The birds I have added here represent about 25% of the birds I captured and possibly 15% of the birds Rich and I saw on our trip to Colombia. The selection is pretty much a random selection from the places we went and of the types of birds we saw. 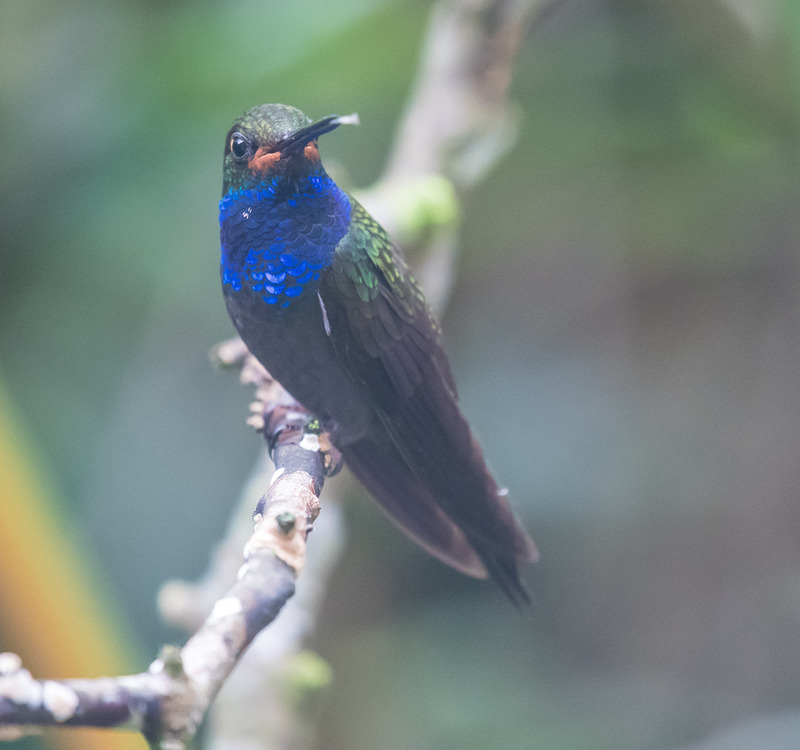 Most frequently we saw Hummingbirds, Tanagers and Flycatchers. 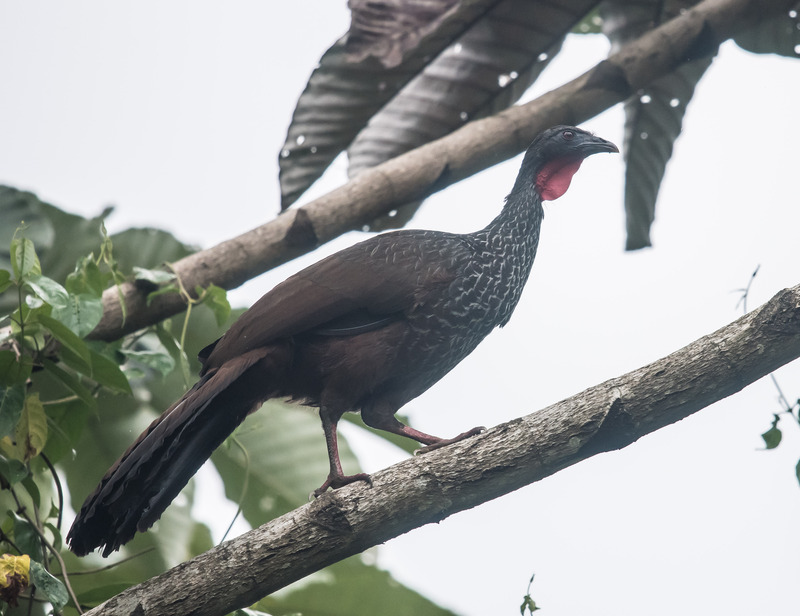 But also represented here are a few raptors, some little ground birds like the Antpittas and a Manakin and big funny birds like the Chachalaca and Oropendola. We loved the long hyphenated names almost as much as the birds themselves. I hope you like the photos as much as I did taking them. If I mis-named some I apologise and welcome corrections. 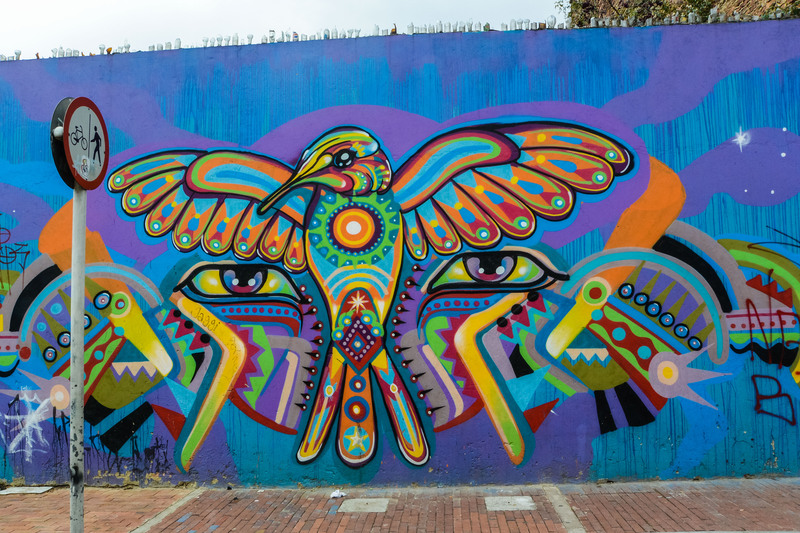 In my previous post I had touched briefly on Bogota, Minca, Santa Marta and Cartegena. 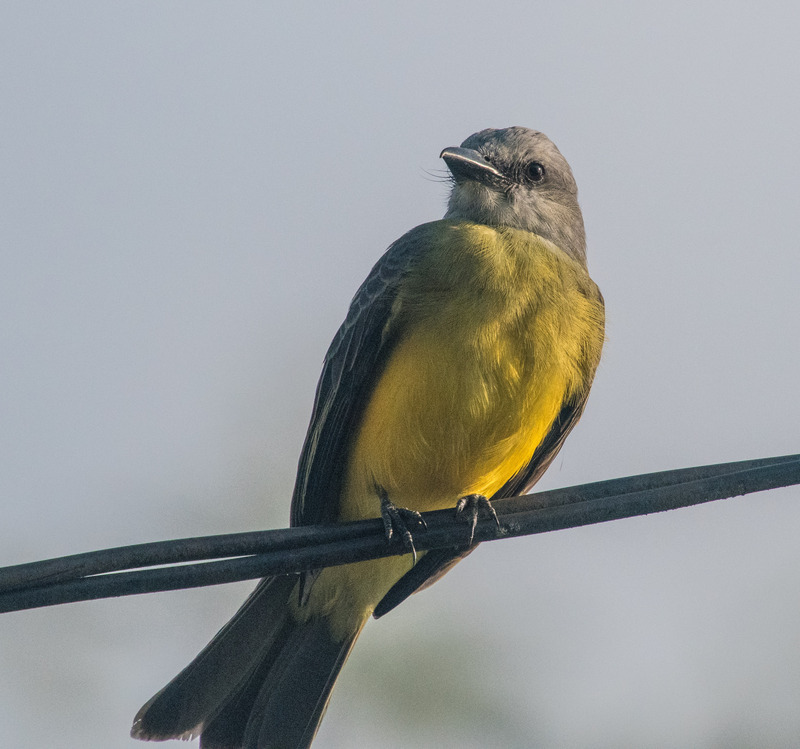 In this post I will discuss the other places we went, mostly to go birding – the primary reason for this trip. I have included only a few photos with birds. 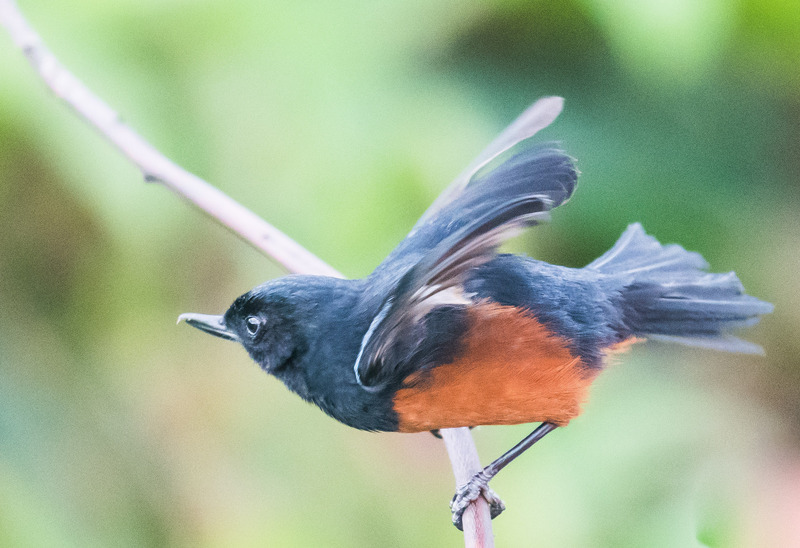 I will do another post showing some of my bird photos when I am further along with the slow job of identifying my birds. 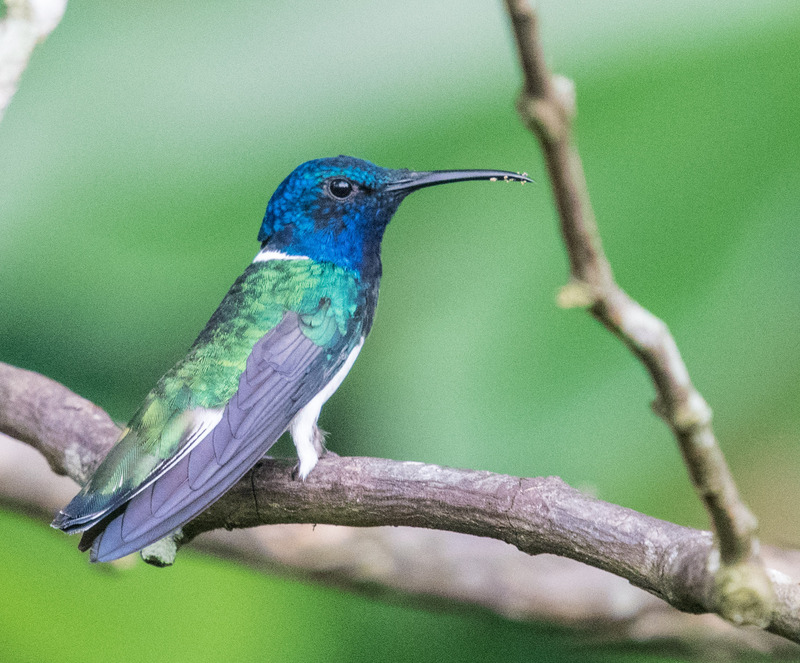 We had come to Colombia with only a few bookings and would be finding our way to birding sites on the fly. 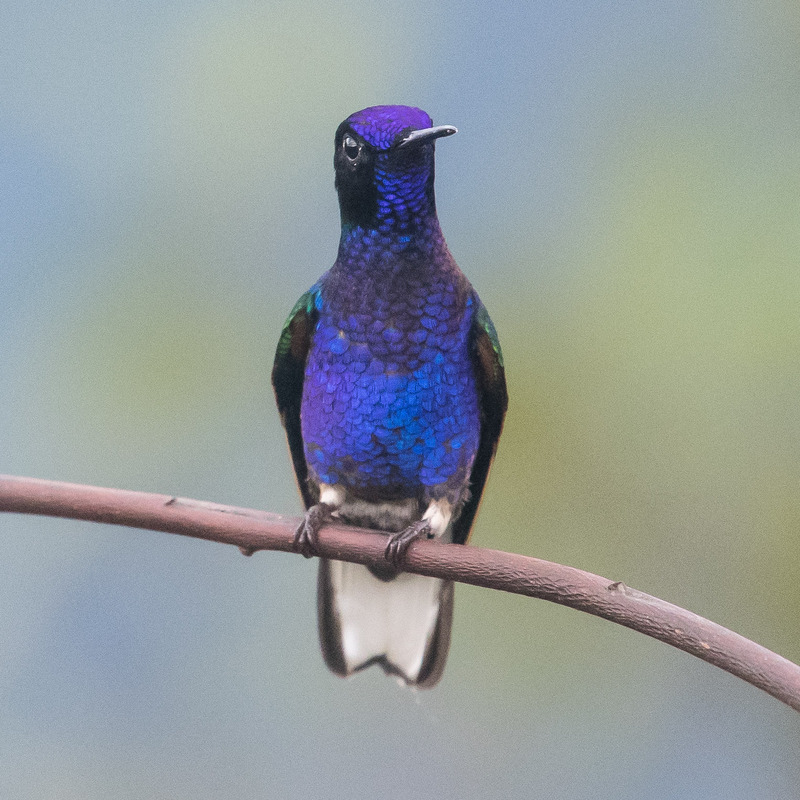 The one exception to this was stimulated by a line in Lonely Planet which identified Montezuma as the one best birding sites in the country. There was no further information in the guide on where it was or how to get there. I was able to find only an email address that linked me to a Kurt Niznik who turned out to be a Californian who was helping Michele, the long-time owner of Montezuma connect with the English speaking world. Michele speaks no English and so Kurt helped through numerous emails get us a 3 day booking at Montezuma. I had only a very rough idea of how to get to Montezuma and phone numbers for Michele and her daughter Yesennia (pronounced with a j) and the hope that our three night reservation was firm. 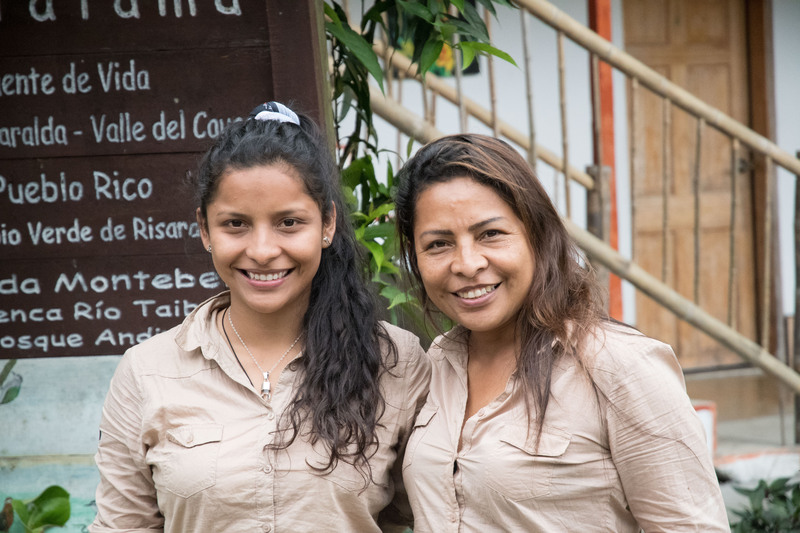 Once in Colombia I was able to speak with Yesennia who has better English than I had hoped and so we were on our way. 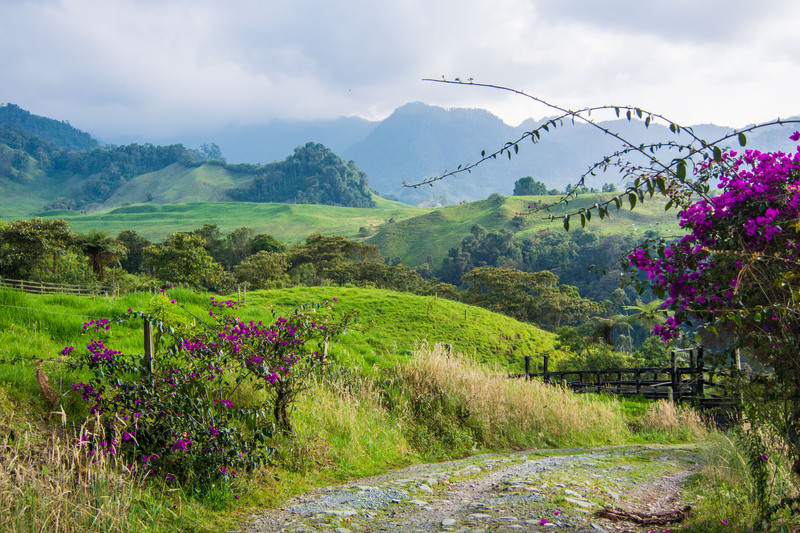 We flew from Cartagena to Pereira, in the heart of La Zona Cafetera, the coffee growing region. We spent the night there and then in the morning caught a 3 hour bus ride to Pueblo Rico where Yesennia arranged for us to be picked up in a 4×4 for the hour long ride to the reserve, arriving just after noon. The lodge is a rough tumble of guest rooms linked by an open area that serves as the gathering place, the eating area, resource centre, discussion area for the guides and clients to discuss their plans and to build the birds-seen lists that are so important to everyone who comes. But primarily this area, is where you sit and watch the feeders. 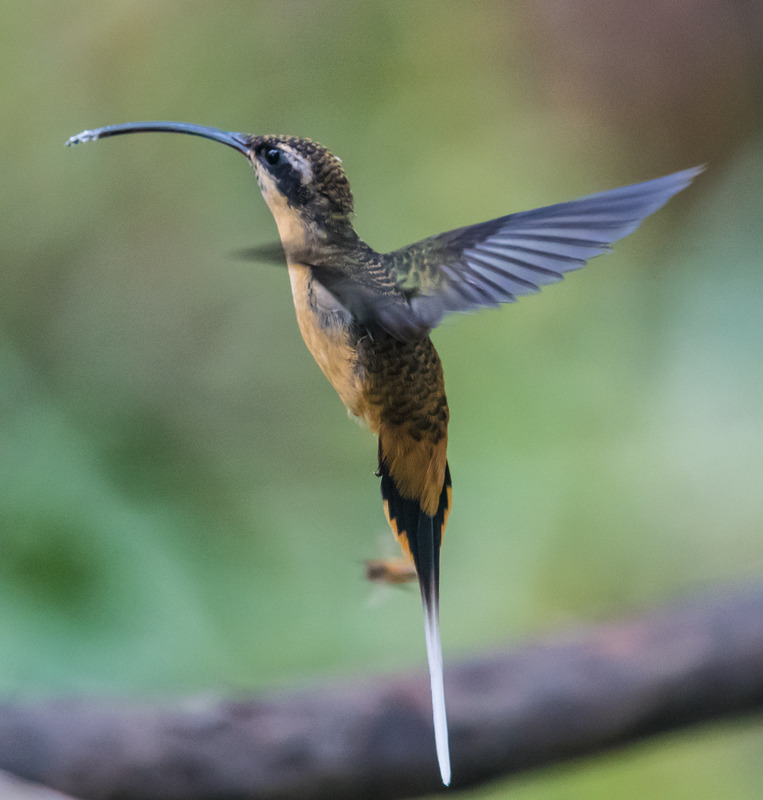 Coffee cup or beer bottle in one hand and binoculars in the other everyone will spend some hours catching the hummingbirds at the sugar water feeders or the tanagers and others at the hollowed logs holding mostly bananas. We got out of the 4×4 and headed straight across to the birds. Even before sitting down to the welcome lunch. Every group that arrived had the same reaction. Also connected to the rooms are at least two kitchen areas, clothes washing area and space used by the numerous family members who work around the lodge and various children who play and mingle at will. 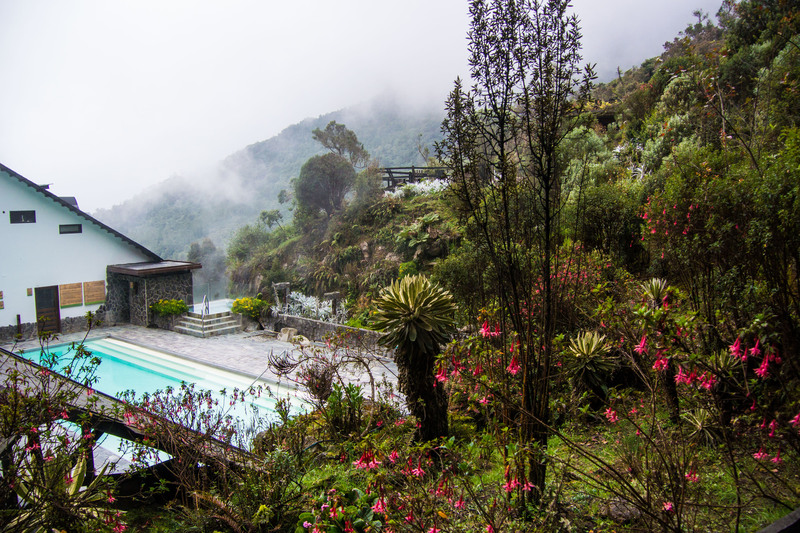 The lodge is far from luxurious but it is wonderfully set in the cloud forest and many birds are found on the grounds of the lodge. Michele’s extended family creates such a welcoming environment that birders settle in almost immediately. We hung out at the feeders and wandered the grounds for a while until Yesennia returned from an outing and then we created a plan with her for the next two days. The first day after breakfast in the lodge at 5:30, we walked and birded for about five hours up the road until a hot lunch was brought by motor bike. We then turned around and birded back to the lodge again. The second day we drove for about an hour to the top of the mountain, at about 2400 m, where there is a military base protecting the communication towers. 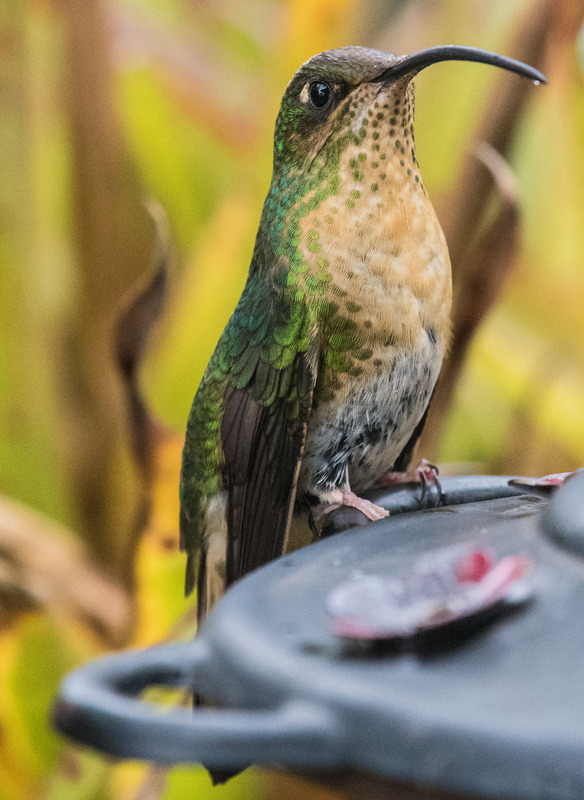 We watched a different slate of hummingbirds at the feeders there. 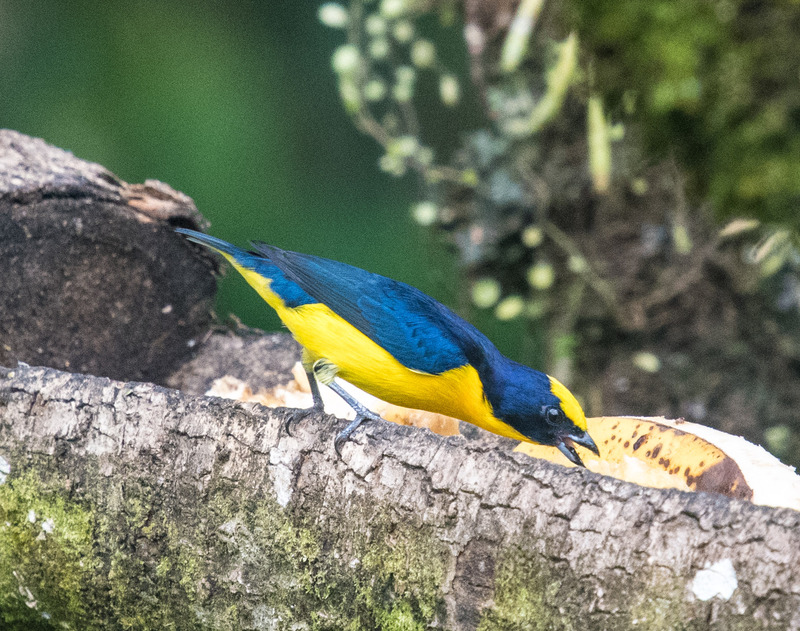 The lodge maintains feeders at various locations along the road to the mountain top. 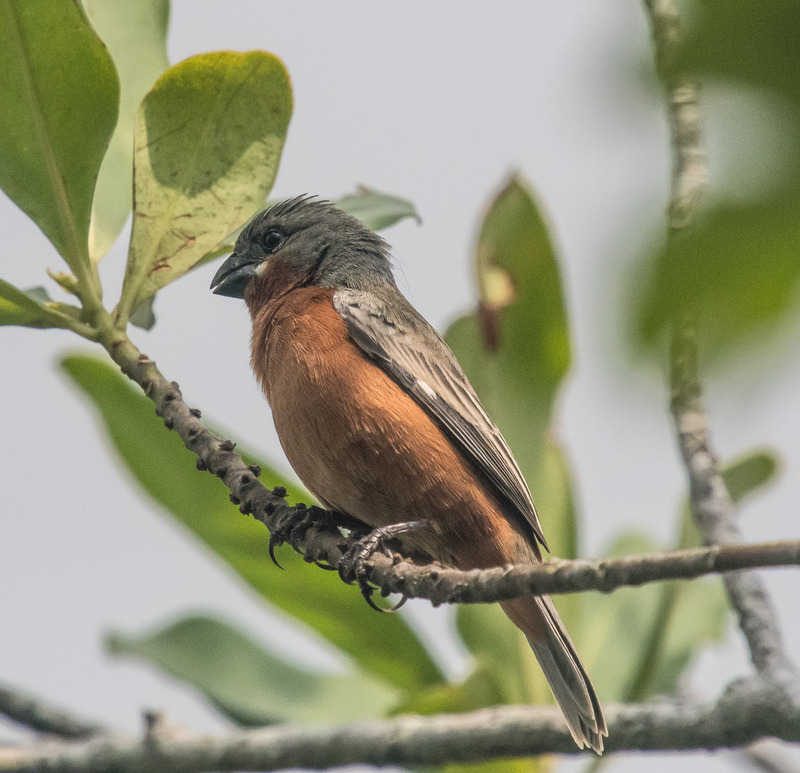 At the top we also saw new tanagers in the bushes and a swallow-tailed kite soaring on the early morning thermals. Hot breakfast was served on the truck tailgate. We spent the rest of the day walking and birding our way back down the mountain, with a hot lunch brought again by motor bike. Weather varies continuously. First hot sun and then clouds made birding tough. 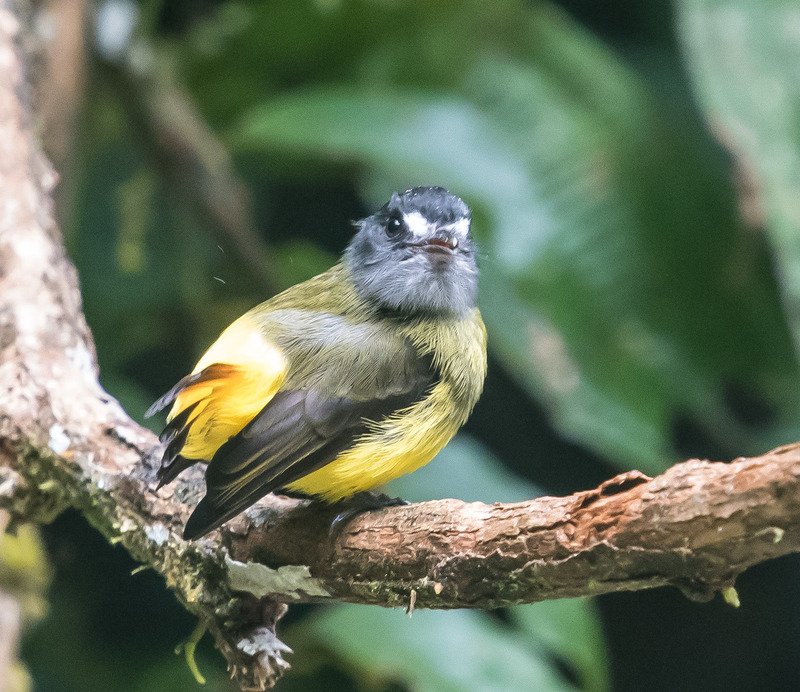 Birding, and for me bird photography, in the cloud forest is very difficult. 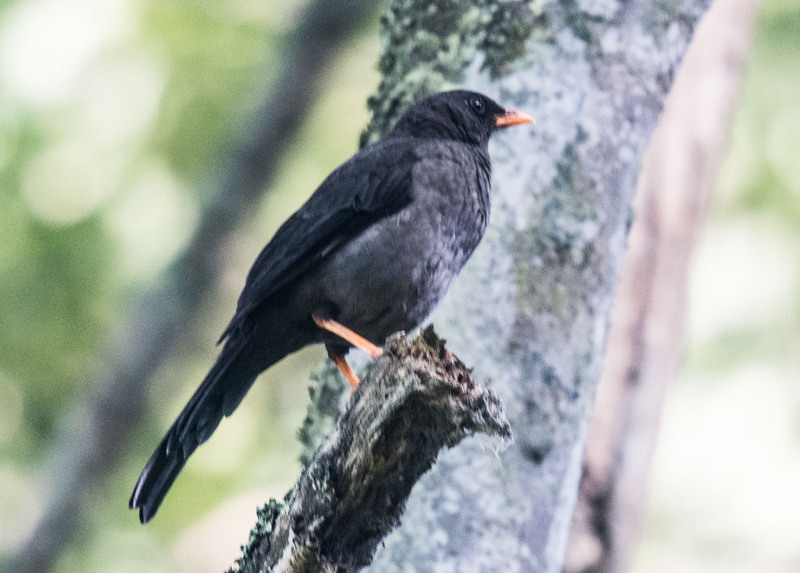 It is dark jungle, the birds are mostly small and very shy and rarely sit out on exposed branches. The guide, in this case Ysennia, will know all the birds by sound and what their behaviours and habitats are. 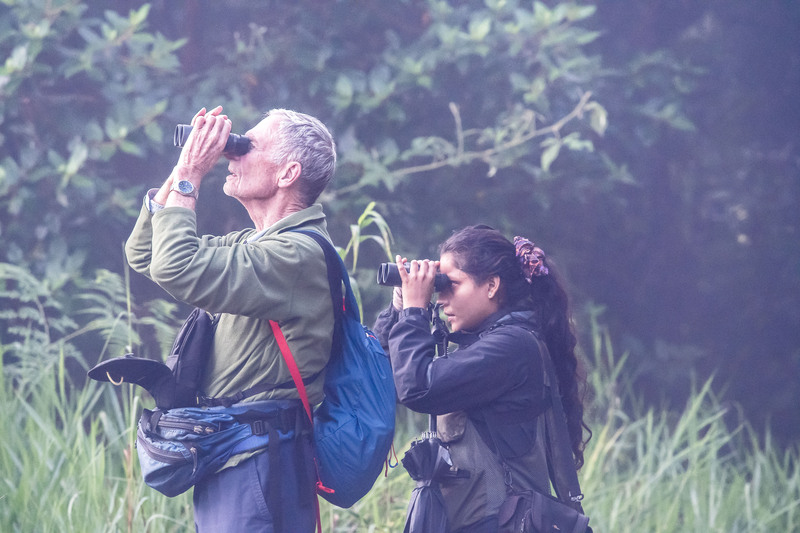 Yesennia would identify a bird initially by sound and then with her binoculars. She would point out the bird by shining a laser pointer near the bird (never right at the bird). It was almost always sitting in deep shade amongst the leaves and branches. Rich would usually find it in his binoculars before I could get my camera locked onto it. 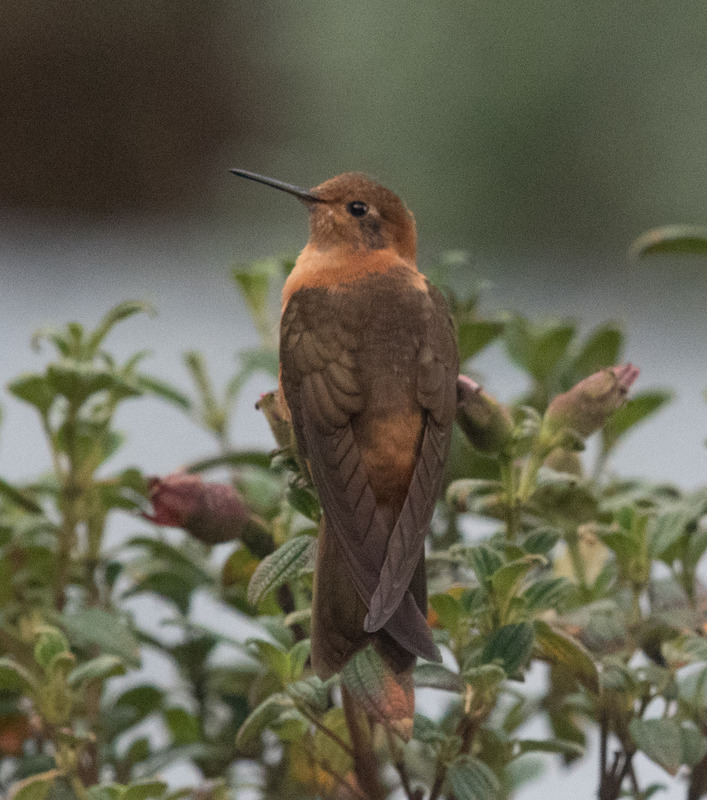 Often it would flit off before I could get it, or it would be too dark or distant to get a good photo. 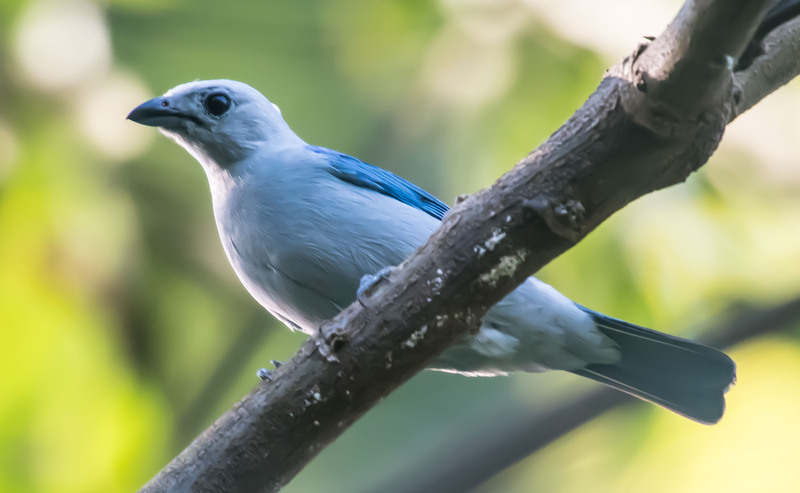 To help zero in on a bird Yesennia, and the other bird guides would occasionally use recorded sounds to attract the bird closer. Sometimes this technique would be used by the guide in a location that they knew was frequented by a specific bird and the recorded songs would sometimes bring it in so we could see it. This technique is considered questionable by some and is not allowed in the national parks. 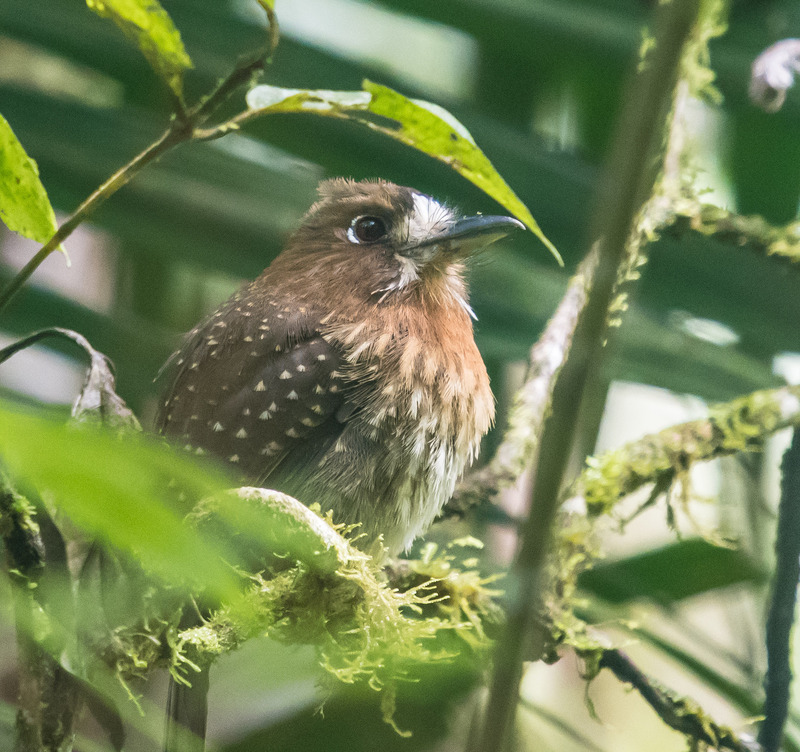 At the end of each birding day we sat with Yesennia and ticked off the birds-seen from a printed list of the 700 or so species that have occurred at Montezuma. 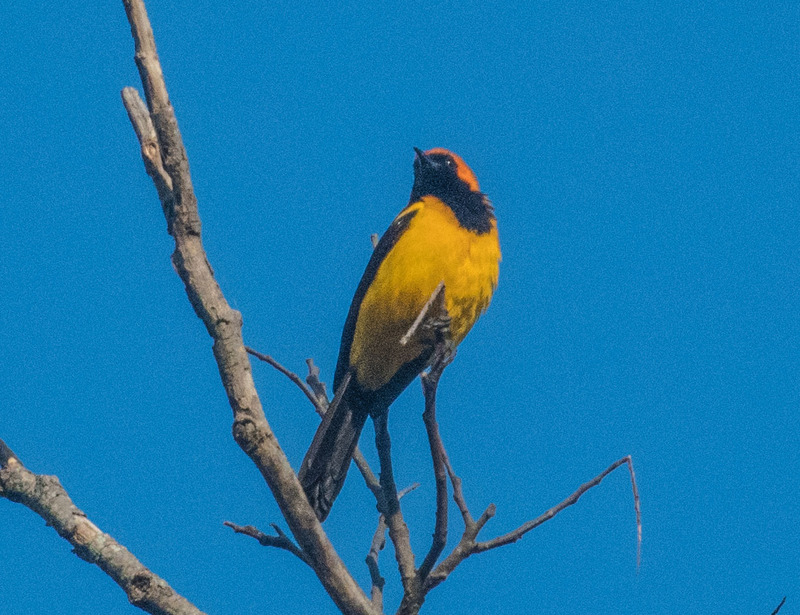 There were two birding groups that we encountered at Montezuma, one from Britain the other from Sweden. Each group seems to have its own personality. 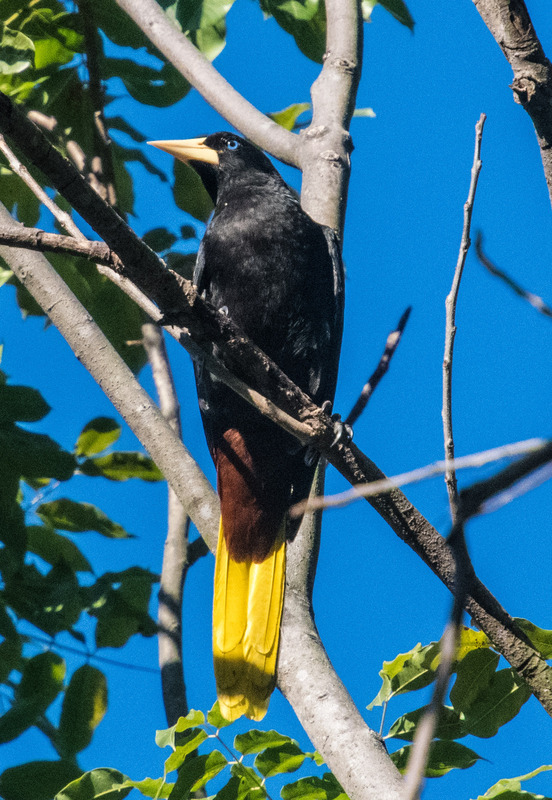 Some are very serious listers who are often primarily after the area’s endemics; birds that occur nowhere else. Others are more fun oriented but are still out for lots of species. 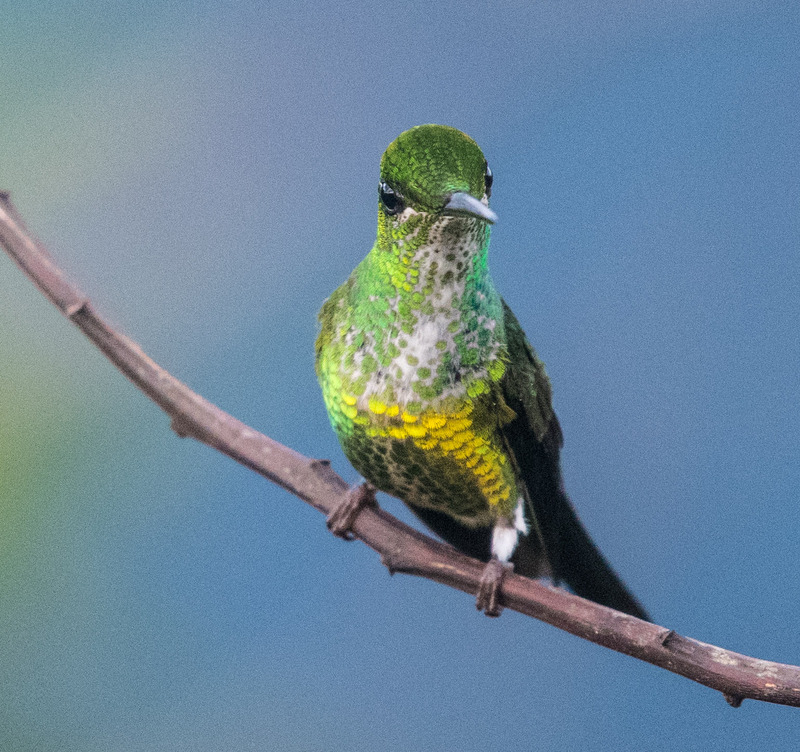 A typical two week birding tour in Colombia, probably getting to 5 to 7 spots will get listers 500 to 600 species. Most groups that we saw were a mix of bird listers and bird photographers, although the very serious of both types would be in tours designed for either listing or photographing. Very different approaches are required. 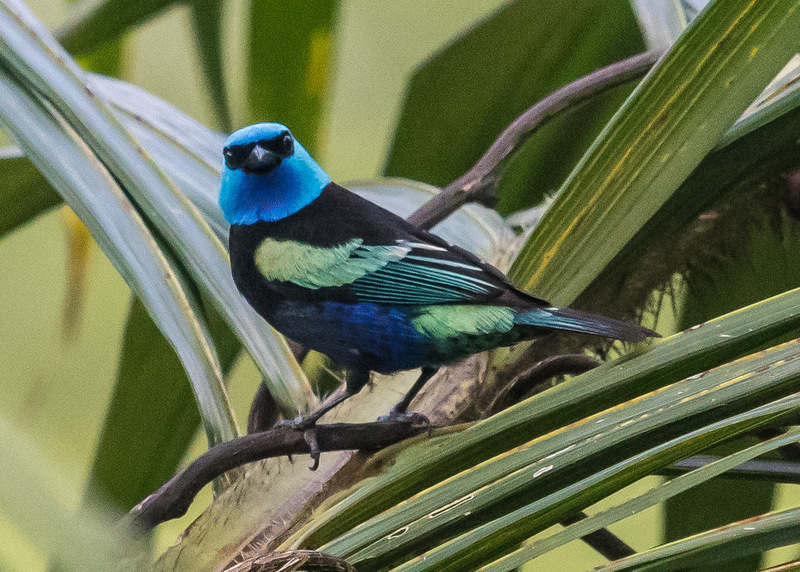 Montezuma was a great first birding lodge experience for us. We did a lot of independent walking about, which reinforced how hard it is to find birds without a guide. I did find an Andean mot-mot on my own which I thought at the time was a great find. As the trip went on we saw many mot-mots and so I guess it was no big deal. 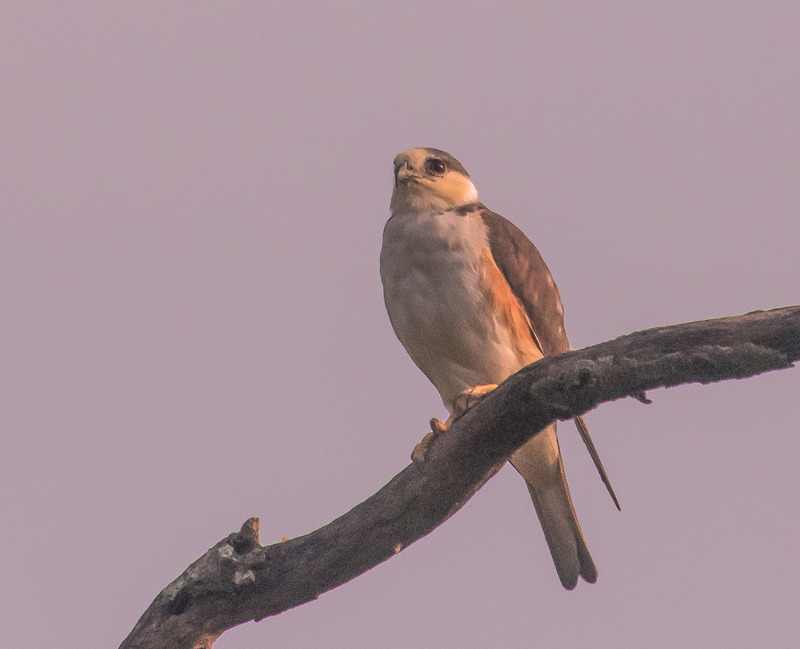 High on my list of birds found here the Lanceolated Monkbird, the Swallow –tailed Kite, and the Mot-mots. 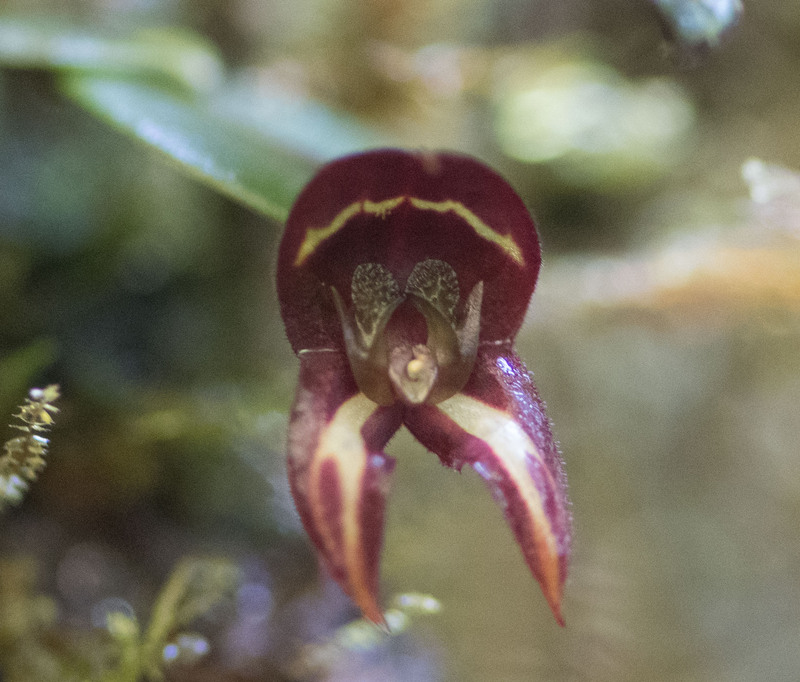 Yesennia pointed out some tiny orchids for me and I got a few butterflies. 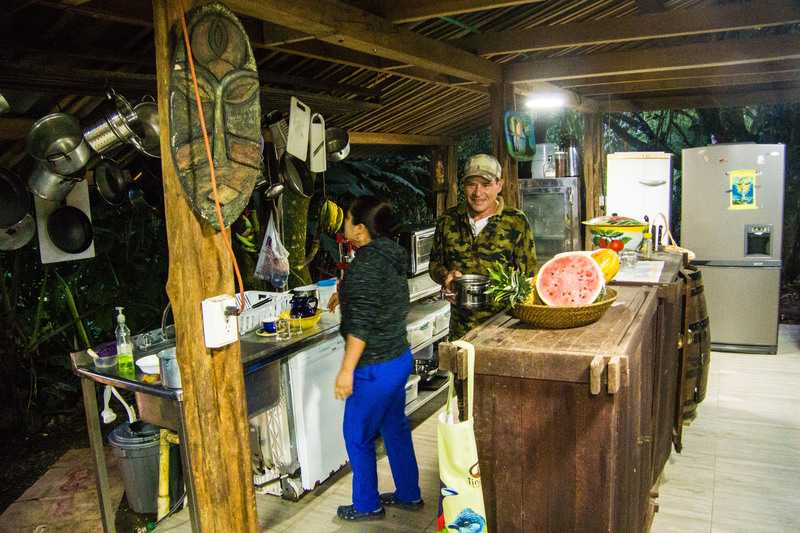 Juan-Manuel, a friend of Yesennia, made reservations for us at Otun Quimbaya which is a Nature Reserve near Periera. 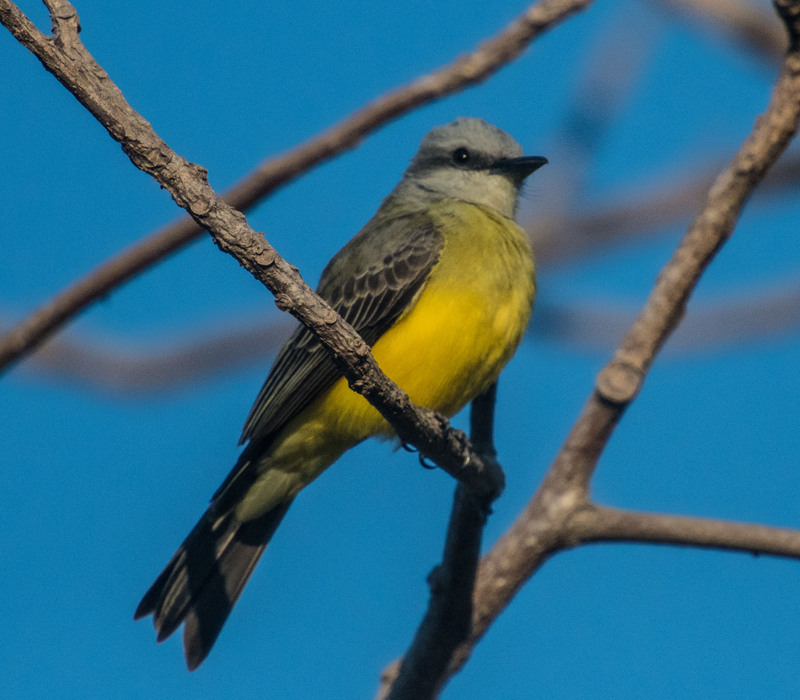 So after birding the morning of Feb 6 at Montezuma, a jeep ride down to Pueblo Rico and a 3 hour bus ride back to Pereria we checked back into the same hotel we were in four days ago. In the morning we caught a strange open bus called a Chiva, where we sat on benches that could hold 5 people. The definitive aspect of these buses is their very high clearances and their ability to handle the unimproved forest roads. Chiva is Spanish for goat; the name is well chosen. 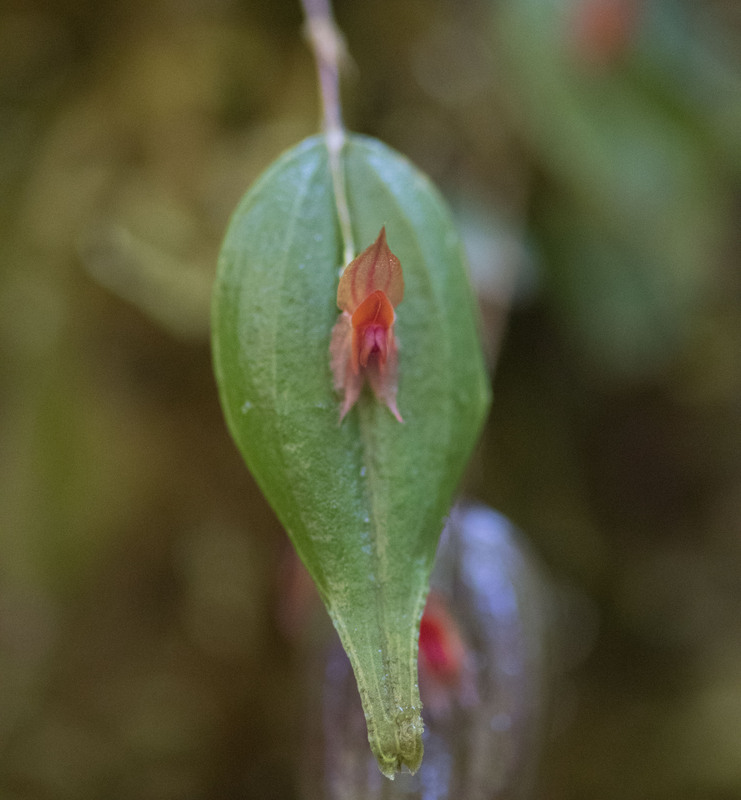 It took a bit under two hours for our Chiva to bounce its way the 18 km back up into the cloud forest to Otun. The lodge here was quite different. It is much more of a public place, reminiscent of a youth camp. There is a cafeteria style restaurant. Most rooms are dormitories. We were given a private room I think because they felt we didn’t fit in with all the young people who were taking courses. 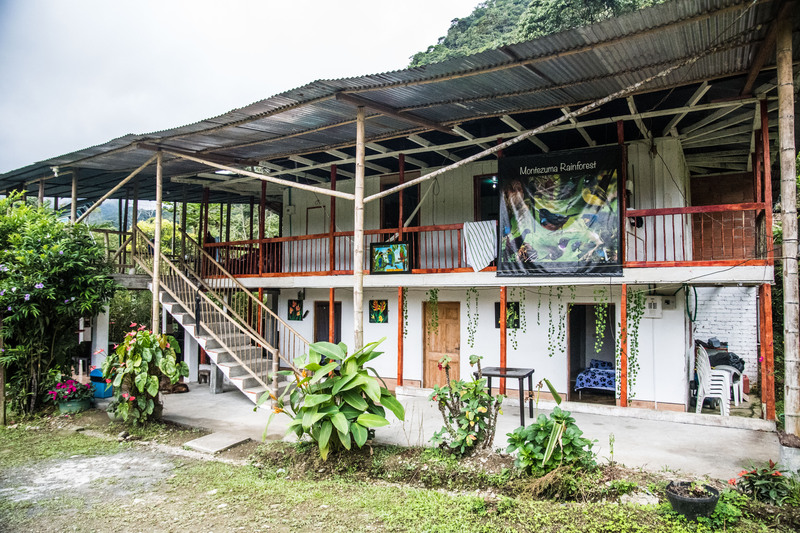 Predominant guests here were Colombians, indicative of the scale to which Colombia is embracing eco-tourism. We were able to walk the grounds before we had lunch and a meeting with Yuan-Manuel. Juan is an independent bird guide who works for the reserve when in the reserve, but also works on his own and with the various bird tour groups. 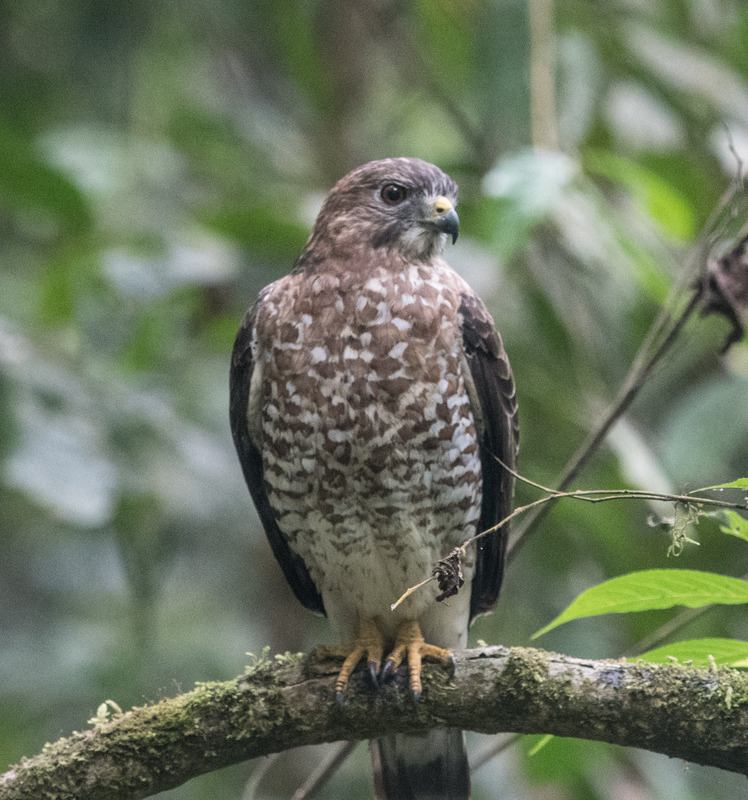 We began to see how large the birding tour business is in Colombia. We did an hour nature walk with one of the other park guides that afternoon and then had breakfast with Juan the next morning at 5:10. A 30 minute 4×4 ride to the end of the road and then birding back for the next 5 or 6 hours. 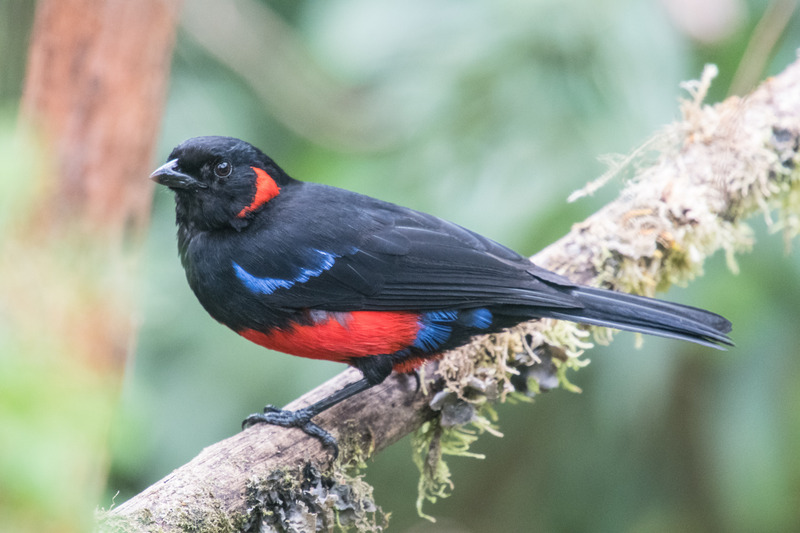 Once again Juan used all of his considerable expertise to find and draw out the cloud forest birds for us to see and photograph. Juan was even more diligent in putting in the extra effort to get me and the bird into a position where I could get a shot. 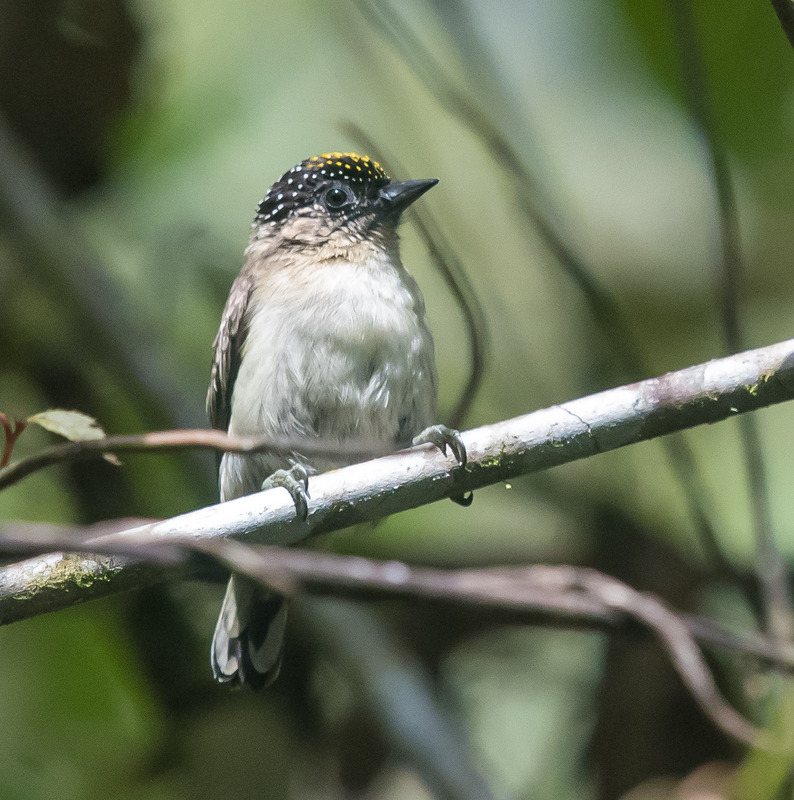 We experienced some big birds here like Trogons, Guans and the Southern Lapwing but for me the real thrill was getting shots of the little bush birds like the Greyish Piculet and the Moustached Puffbird that Juan was able to set up for me. After lunch we spent a long time with Juan going over the plans for our remaining time in Colombia. 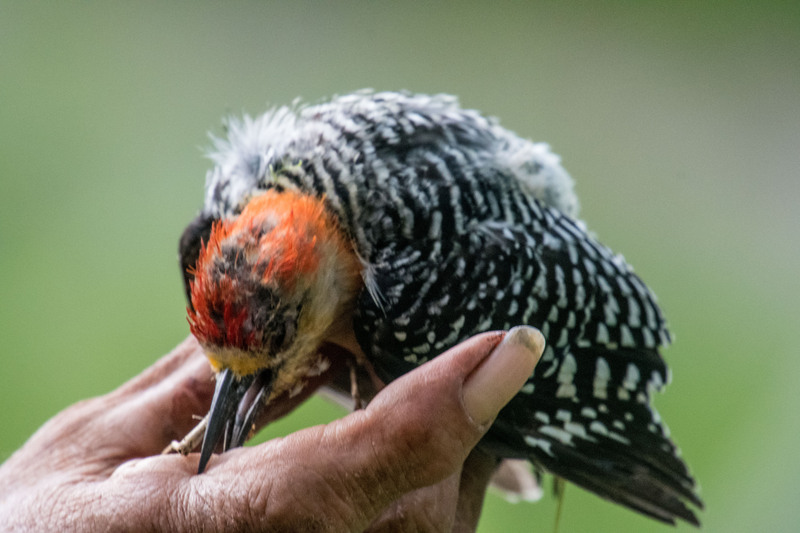 As he had such a good knowledge of birding opportunities and people we went over many possibilities, finally settling on a plan that minimized logistical problems and maximized birding. In the morning another nature walk with another guide around the lodge finished off a very successful visit to Otun Quimbaya. Incredibly Juan had offered to pick us up after lunch and drive us to our next destination. Not only would we stop off along the way and bag a few more birds, but it meant that we did not have to take two different buses and another 4×4 to get to Tinamu. A two hour drive instead of struggling for a full day. Tinamu is still in the coffee growing area, and in fact at one time was a coffee farm. The current owner has turned it into high-end birding resort, with lots of feeders for the arm-chair birders and the big-lens photographers. But there is also a network of trails that rapid growth is gradually returning the jungle habitat from the coffee plantation. Arriving at the lodge we were struck by the contrast with the lodge at Otun. A Czech Republic group of primarily photographers, with their tripod mounted cameras set up around the grounds, were finishing up their visit. The only Colombians worked there. Francisco, the main bird guide at Tinamu does not speak any English but they contract, at a small extra cost, Daniel a younger guide who would spend the day with Rich and me. We had a leisurely start with breakfast at 6:30 and then spent the day walking the paths cut through the jungle. I saw no signs of coffee, but the growth was so lush I guess I wouldn’t recognize coffee plants anyway. 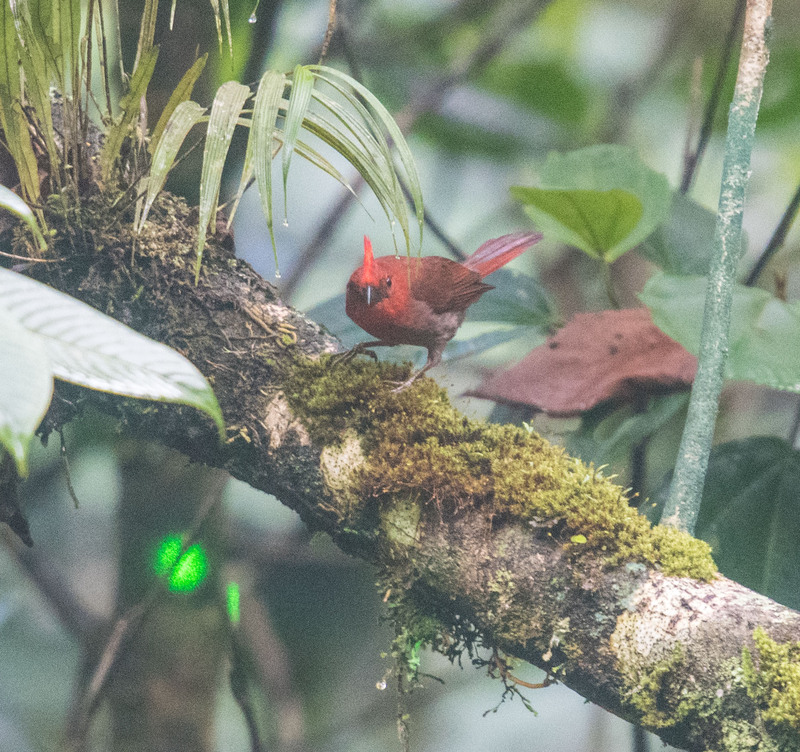 The real prize for me on this day was the little Golden-crowned Manakin that Daniel worked very hard to entice into camera range for me. 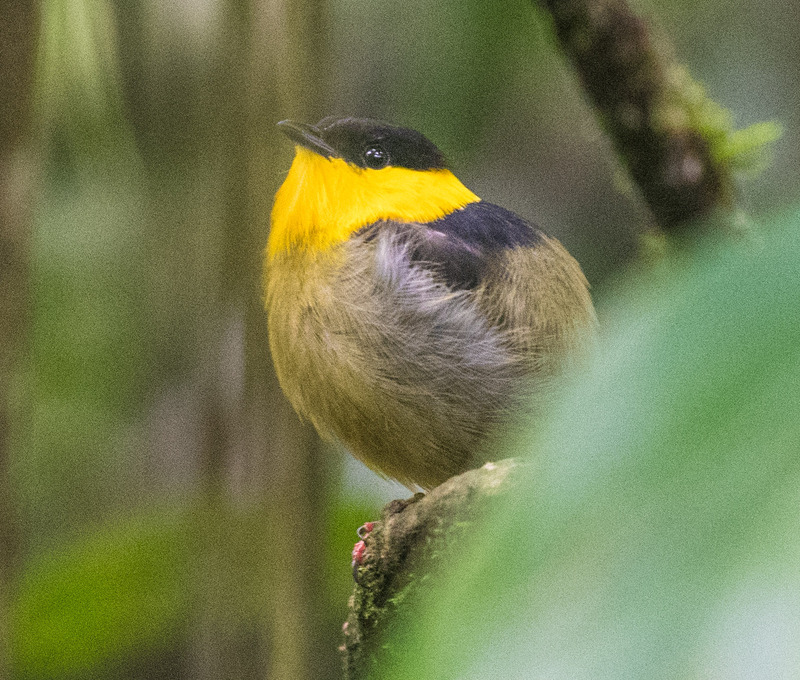 Manakins are low to the ground birds and so we were down on our hands and knees to see it. 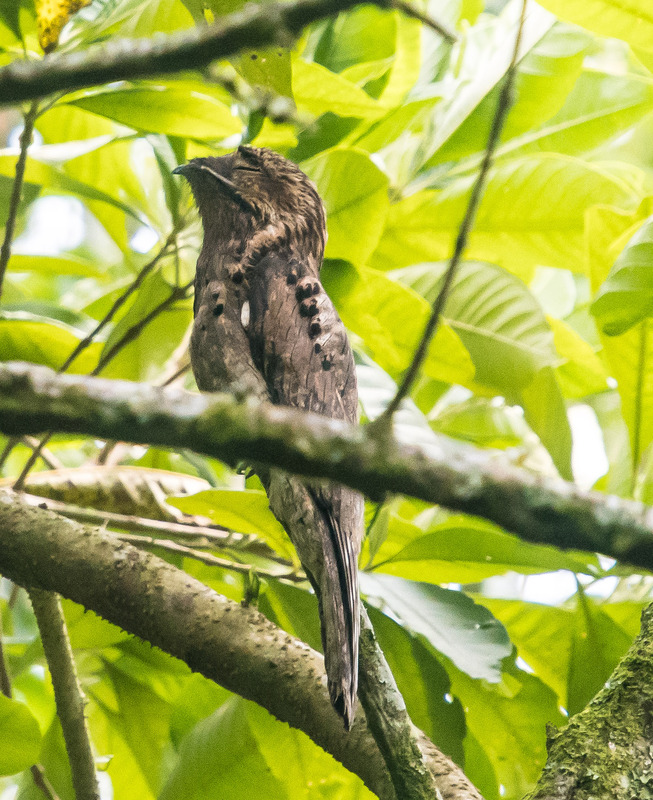 Also fun was the very strange Common Potoo, reminiscent of the Frog-mouthed birds Rich and I had seen in India and Australila. The very friendly bird photography grounds gave some good opportunities to improve on pictures birds seen elsewhere. Tinamu is a lovely spot to bird and to stay. Manizales is a sister city to Pereira in coffee country. It is extremely mountainous and quite high, so the climate is lovely. It is a great place to centre yourself if you want to bird from a city. Laura, another contact of Juan’s picked us up after an early breakfast and off we went for the day with her. 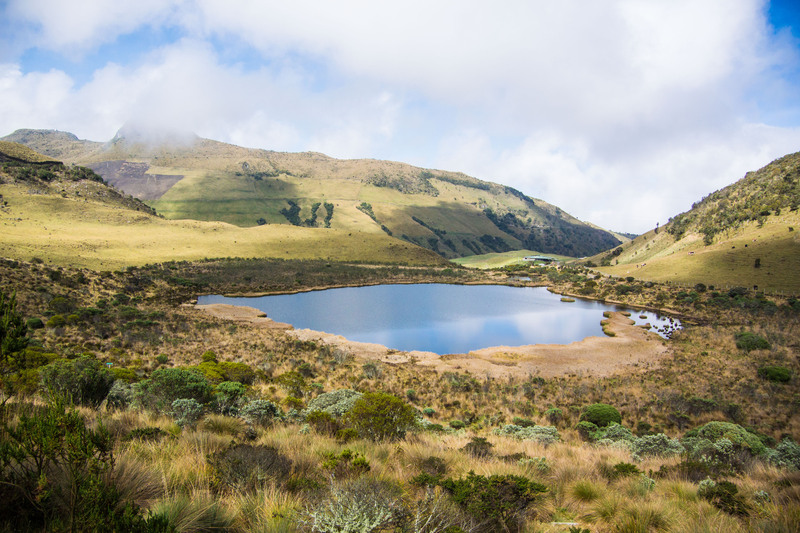 It took us a couple of hours to make our way down from Tinamu and then high up to Los Nevados, a park noted for its high altitude birds. Laura is not a birder but she had taken others up for birding. Once we left the main highway she dropped us off so we could bird the bushes along the road. We didn’t find anything; we will blame it on the cold windy day, but the views were spectacular. We drove along the park road, stopping a few times. We did see distant Andean Ducks, similar to North America’s Ruddy Duck but not much else. At the very top of our drive it was completely clouded in with no relief in sight. 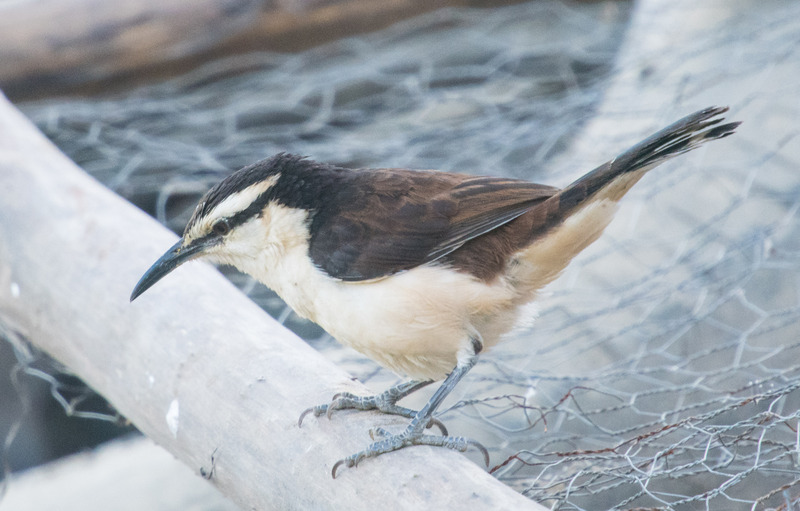 Continuing our drive we next stopped at Termales del Rui, a hot spring known in birding circles for its gardens and bird feeders. 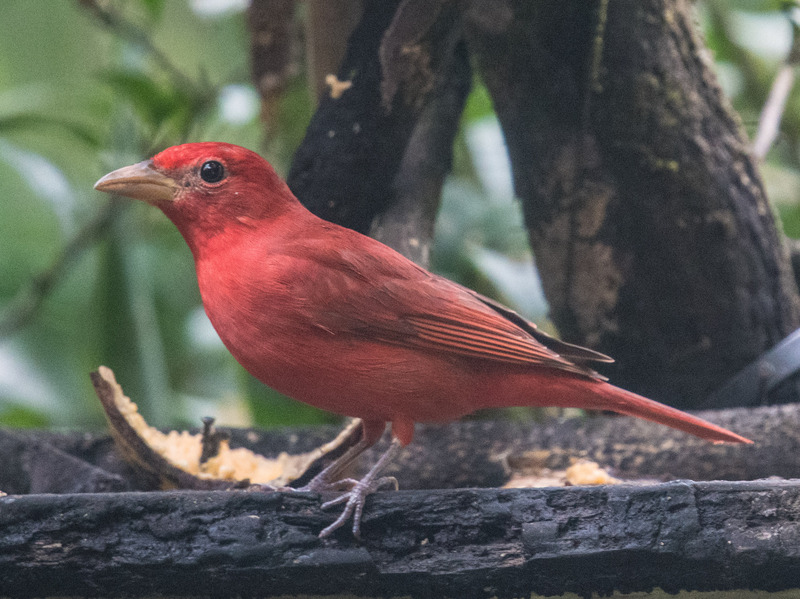 More hummingbirds and tanagers and a nice lunch. A bit later and much lower we finally got some relief from the wind and a little sun, which brought out the birds. We found a nice hedgerow which housed a few species we may never be able to identify, not having the knowledge of a local birder. We were dropped off in our hotel in Manizales where we would spend the next three nights. The next morning Laura drove us and our new guide Miguel an hour or so back up into the mountains to Rio Blanco. There is a lodge there and it would have been nice to stay, but we were unable to get in when we were working out our plans with Juan. We spent only the morning at Rio Blanco but it was still very productive. 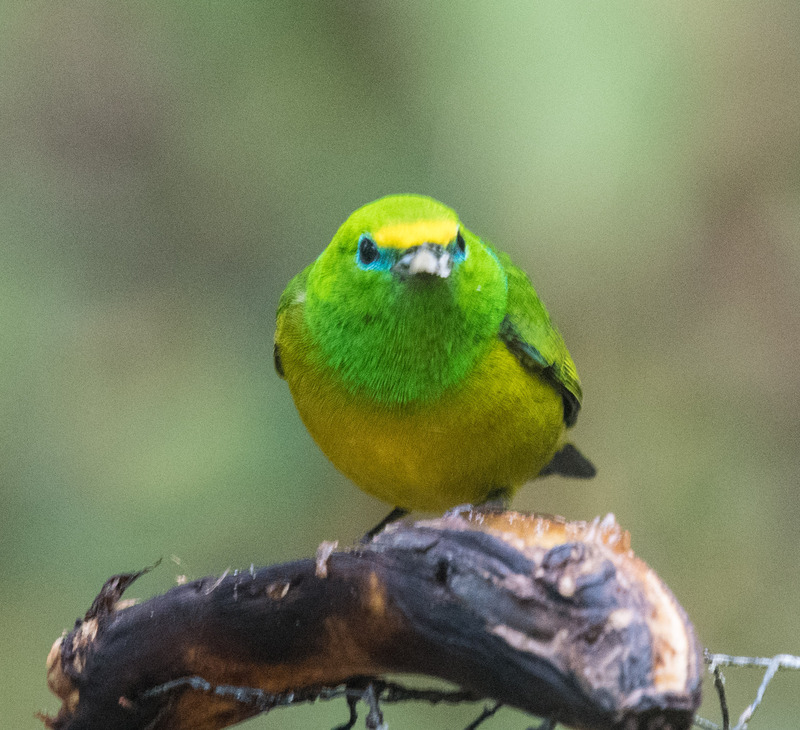 A key feature at Rio Blanco were the little hides that had been built where the guides have habituated some of the special little birds to watchers. The trick is that they throw little bits of worm onto a flattened area in front of where some stools for the watchers sit. 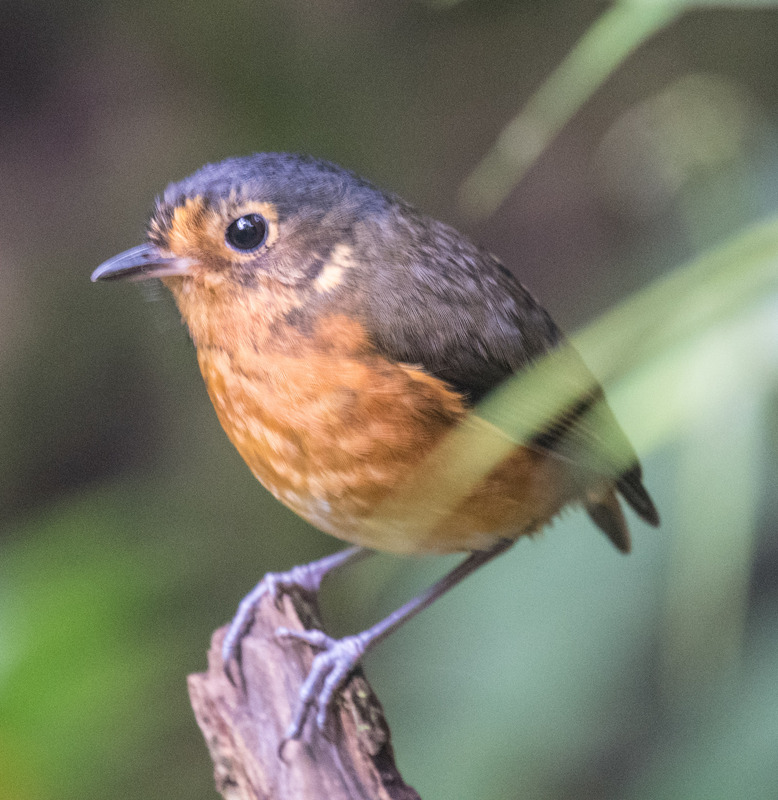 After a while the little birds hop out of the dense undergrowth. 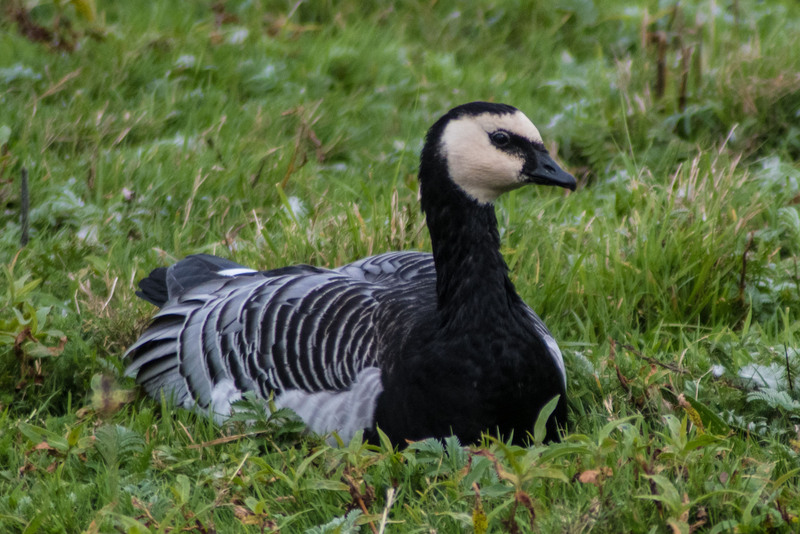 We spent the morning walking up the road stopping at three of these hides. At the second hide I was crouching over to get a shot of one of these little guys poking his head out of the leaves when one of my lens multipliers dropped out of an open pocket and fell into the brush hanging precariously on the mountain slope. Miguel climbed down and for about fifteen minutes fought through the brush but could not find it. It was assumed that if I had tried I would have rolled all the way down to Manizales. Overall the lighting was very poor on this day for photography. Rich saw a few new birds but other than the hides I did poorly. Back at the park centre we kind of hung out watching the hummingbirds and I noticed Miguel had left. But he was soon back with my multiplier. Laura had driven him back to the hide for another look. 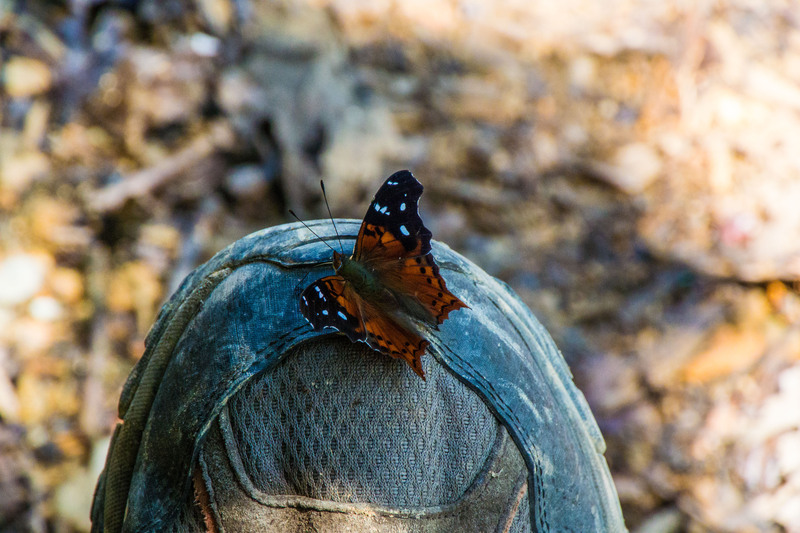 Another example of how carrying the people are that we met at the birding sites. 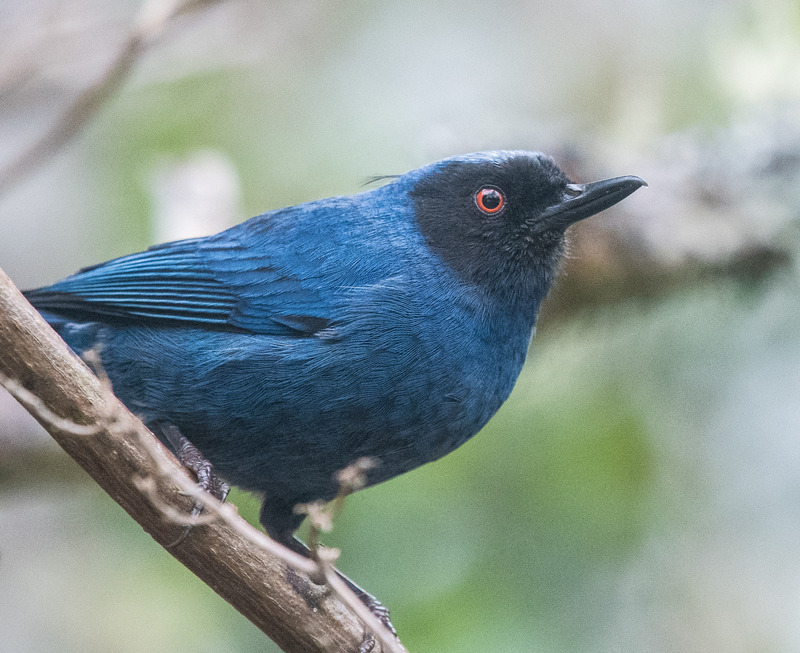 The little Ant-Pittas, four kinds, were great to see. 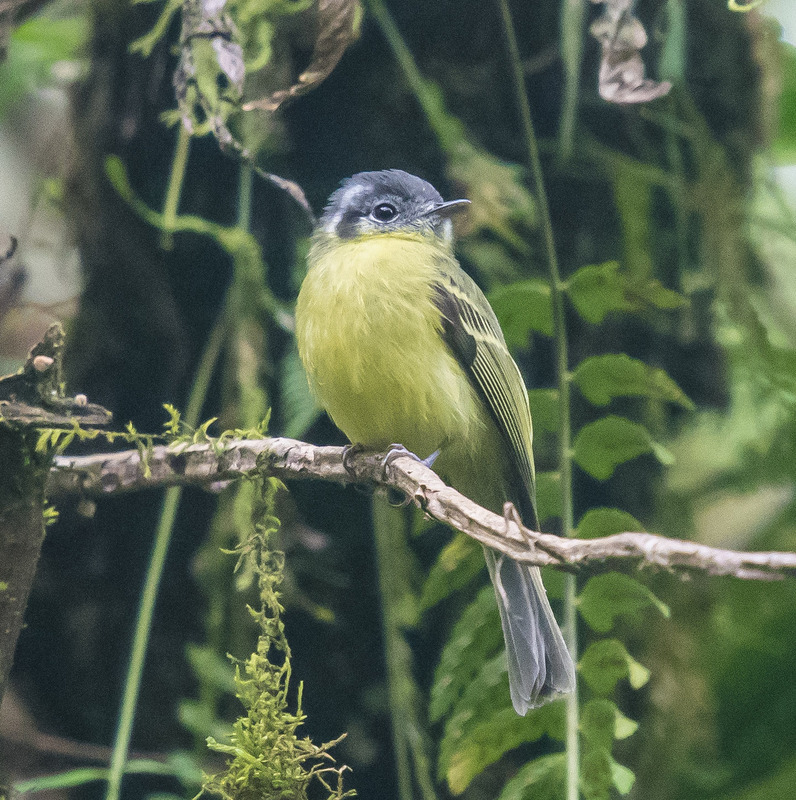 The shot I got of the Tody-flycatcher when I lost my multiplier turned out ok and I added to my raptor collection with a Road-side Hawk. Another place that would be great to visit on a return trip. 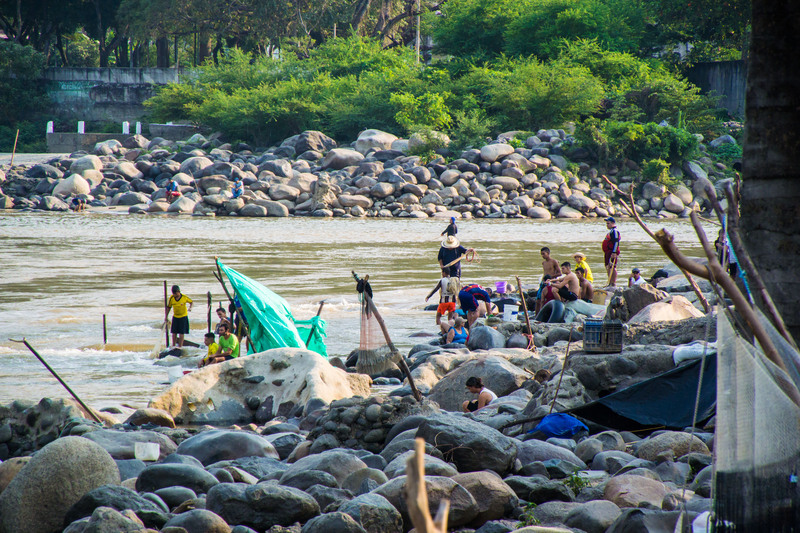 I returned to Manizales after Rio Blanco and crawled into bed where I spent about 18 hours recovering from something. A quiet day walking around Manizales seemed to restore me. 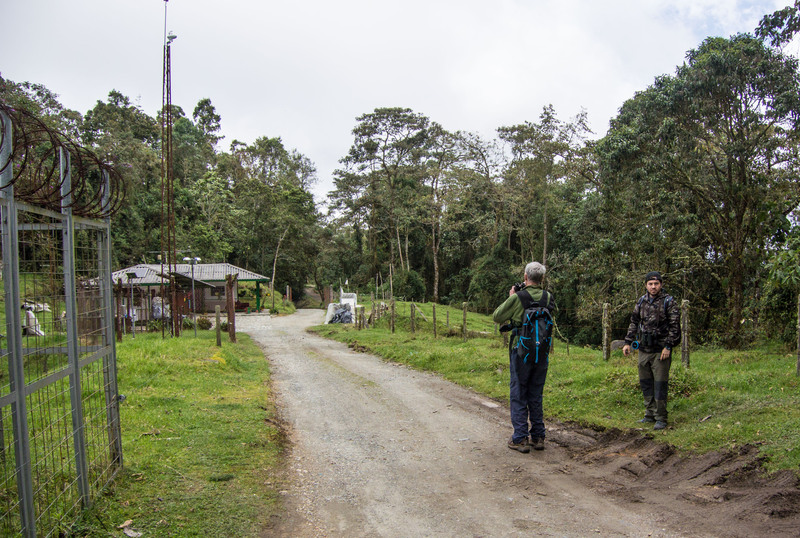 We were heading to Honda in part to get to a birding area called Belavista, which we hoped to find some way of getting to from Honda. Honda was also about half-way along a main highway to Bogota where we were scheduled to be on Feb 16. 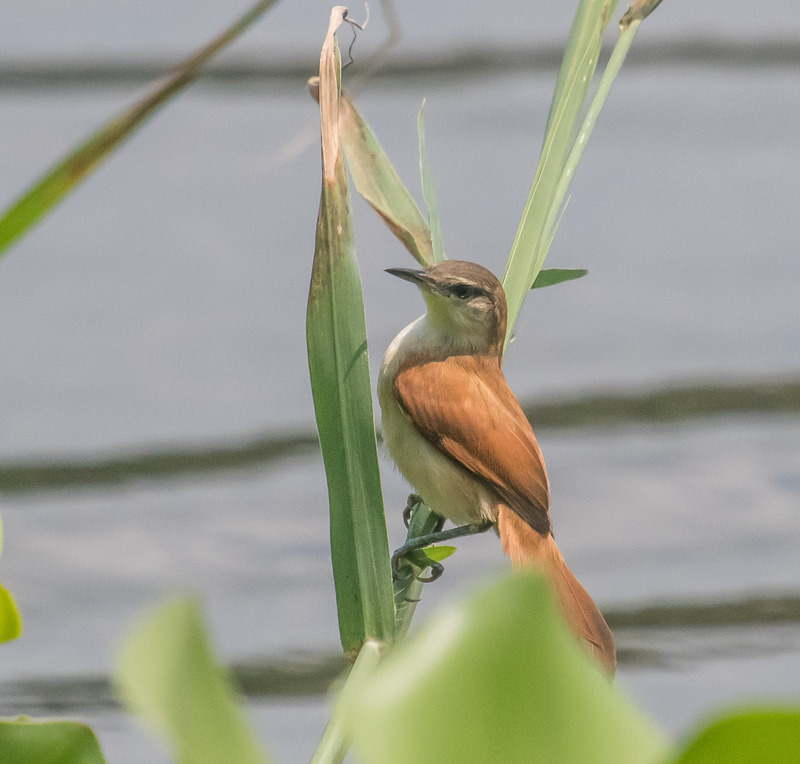 The altitude at Honda is around 200 m, which means it was quite hot and some different birds were on offer. Our hotel, a few minutes by taxi outside of Honda, is a resort type of place that has seen better days, but was quite nice given our budget travel preferences. We were both able to find some nice birds walking out from the hotel. On my walk I watched one of the staff extricate a little woodpecker from a vine tangle. Walking around Honda the fishing life along the Rio Magdalena highlighted some of the differences from the Cloud Forest. Rich was more productive. 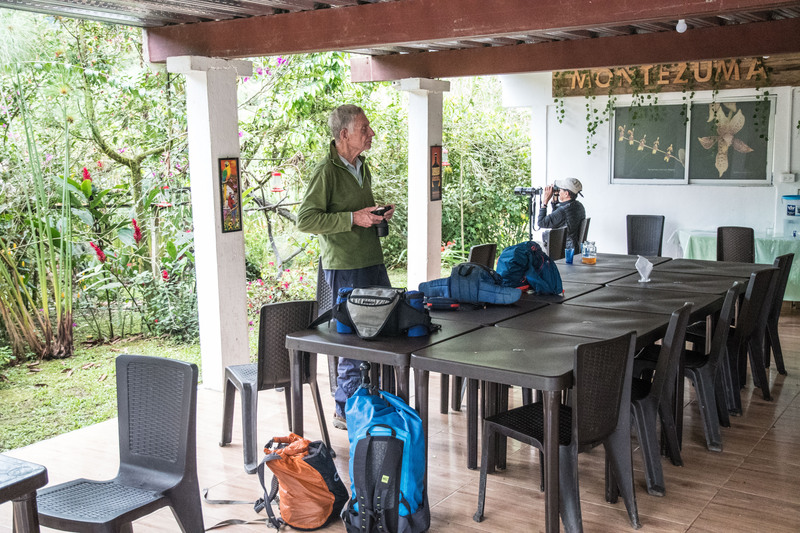 He found an English speaking hotel owner who had some knowledge of birding and who agreed to drive us to Belavista the next morning. Luis dropped us off on a small road leading into Belavista. Luis is not a bird guide and had to get some work done on his car. We found some good birds on this morning but could only identify a few of them. 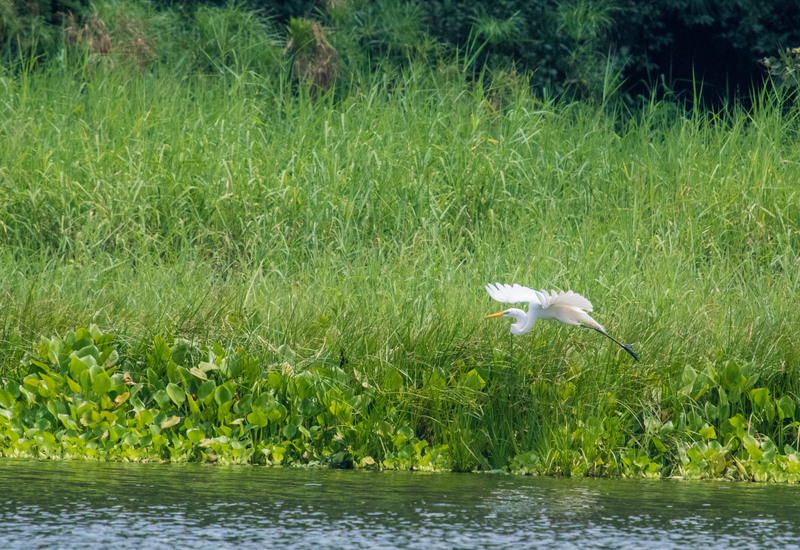 Luis returned and we went down to the Rio Magdalena where we saw a few water birds and got a taste of Colombian wet land habitat. The next day we spent a few hours with Luis walking around Honda itself and found a number of new birds. All in all the stop at Honda was quite enjoyable even if a bit different than the birding lodges we have been to. 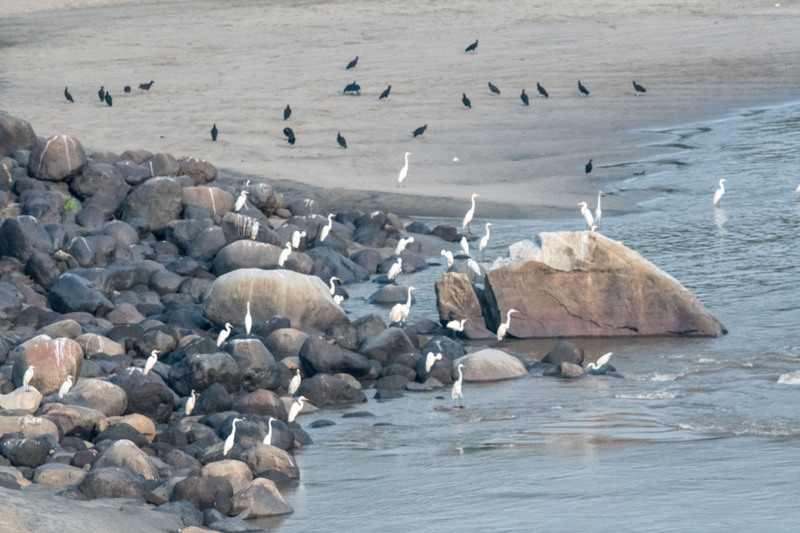 We had good looks at large numbers of Great Egrets, Cormorants and Vultures on the Rio Magdalena. 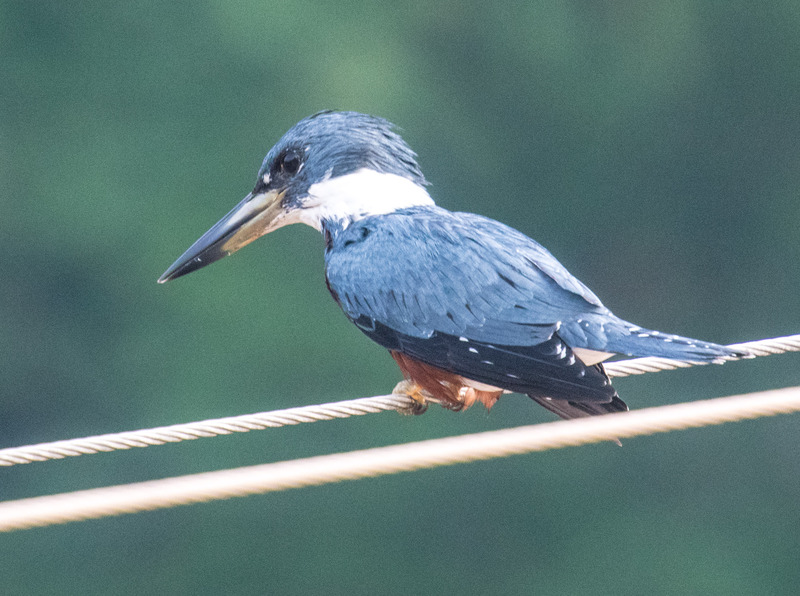 I also got some shots of a Ringed Kingfisher and we were invited into a garden where a Colombian Chachalaca had been enticed to visit occasionally. It expressed great consternation that these foreigners had been invited into its territory. 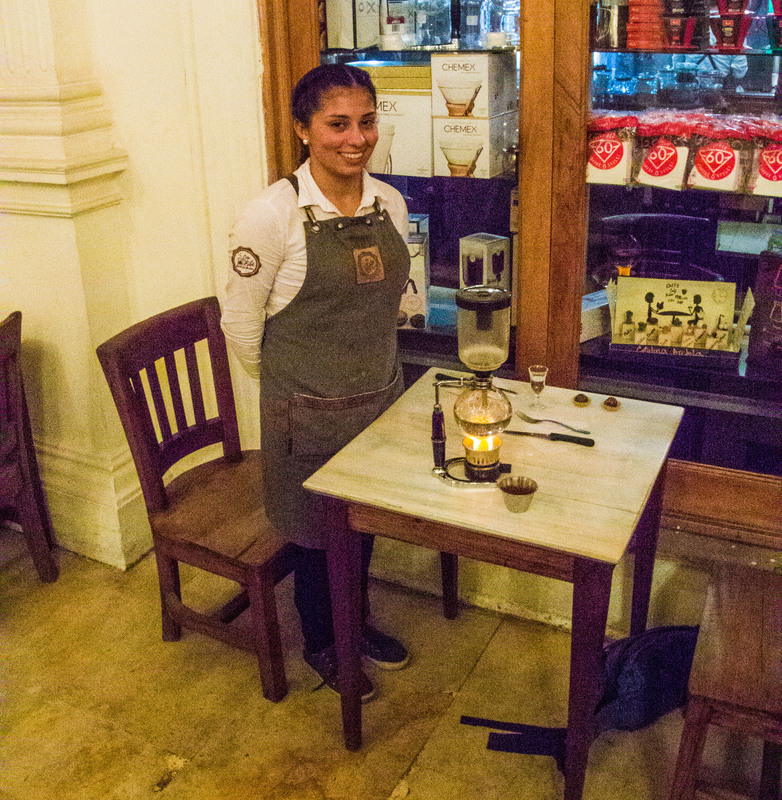 We had three days and nights in Bogota before our 11:30 pm flight home. We returned to Bogotá more familiar with things Colombian and quite enjoyed our final days here. We ate particularly well, finding some great restaurants. No birding though. 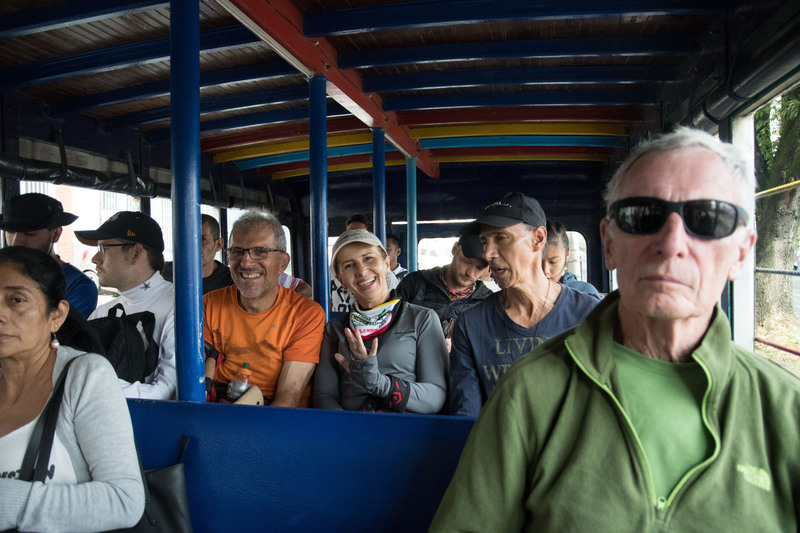 The first day, a Sunday, we spent 4 hours on a bike tour, hosted by Mike, an old American expat who has lived in Colombia for 12 years. Along with about 20 others we visited a market where we sampled at least 20 kinds fruit, many of them hybrid crosses. We cycled the somewhat quieter streets with hundreds of others. On Sundays in Bogota Ciclovia brings many out on their bicycles to enjoy the city’s attractions. We watched dancers and a kind of martial arts in the park. We went to a coffee roaster. We stopped at many street art locations. We rode through the red light district, didn’t partake though. We drank beer and played a strange game where we threw lead weights at something caps with gun powder. 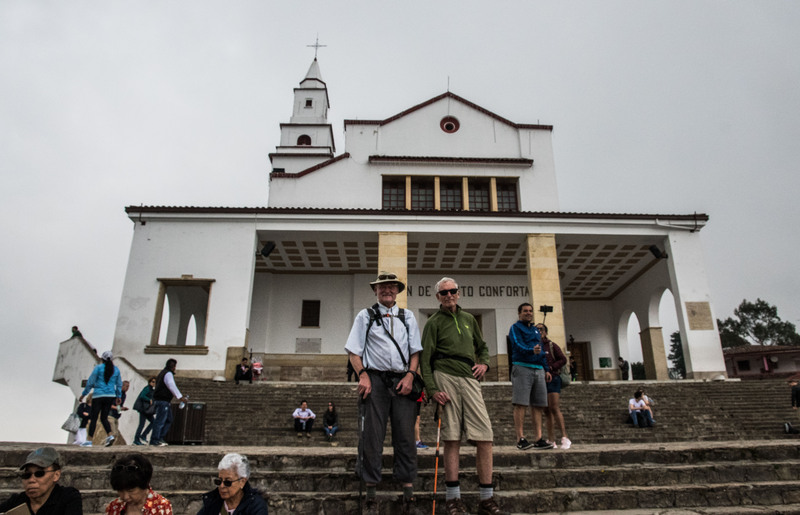 The second day we walked up Cerro de Montserrat and the day we were leaving we spent much of it in The Gold Museum before enjoying one final Colombian coffee. 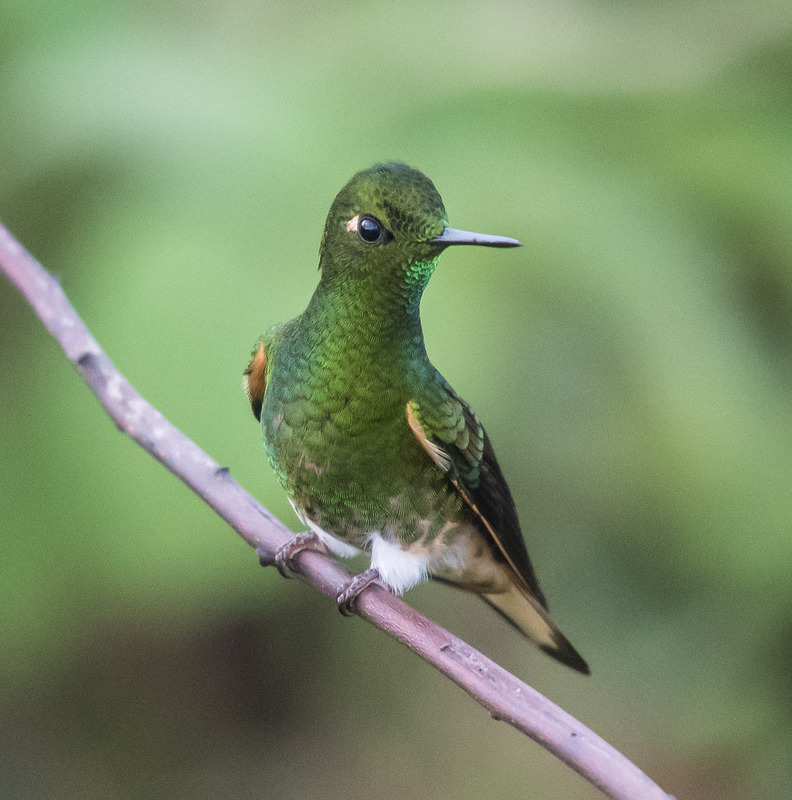 Colombia, fourth in population size in the Americas; behind, the US, Mexico and Brazil, sits at the top end of South America touching Panama, which makes it a birding flyway. The Spanish arrived in 1499, drawn in large part by the stories of gold, resulting in decimation of the indigenous population. Soon the slave trade was to be added to the travesties brought by Europeans. In recent times the country was beset by the drug trade. 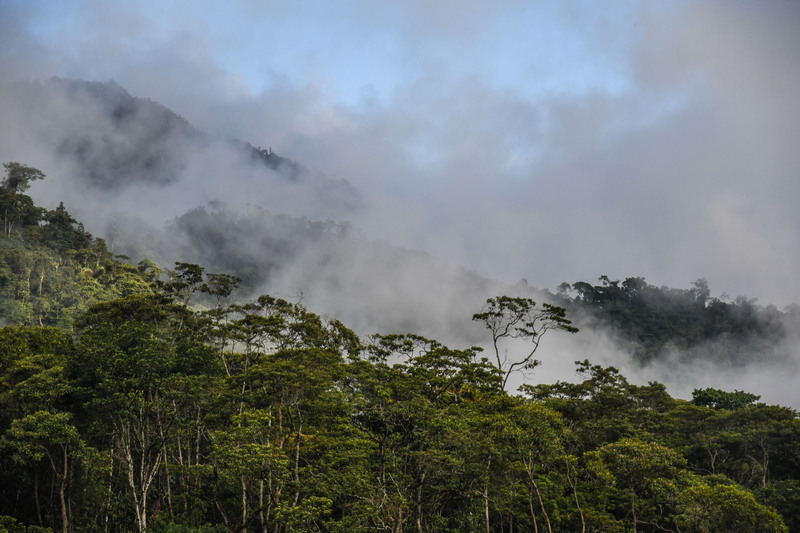 But throughout the centuries the jungles and the mountains (up to over 5000 m) have protected to some degree the natural habitat. And it is largely Colombian nature that has brought Rich King and me here for four weeks . 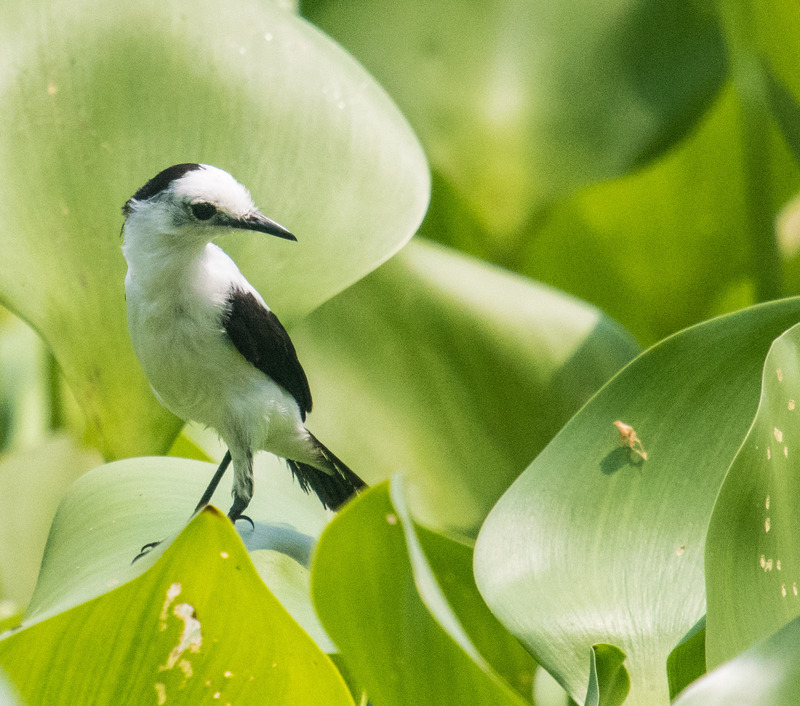 We hope to see and photograph some of the country’s close to 2000 bird species which is possibly the most of any country. 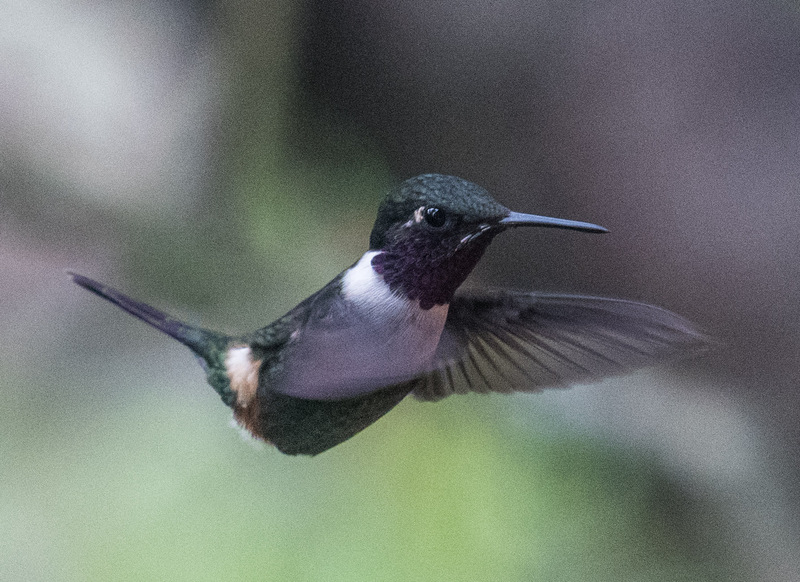 I will perhaps add more bird photos in a separate post. We arrived easily through Toronto on two flights and were picked up at the airport by our AirBnB hosts. We would have two days here and two more on our way home. 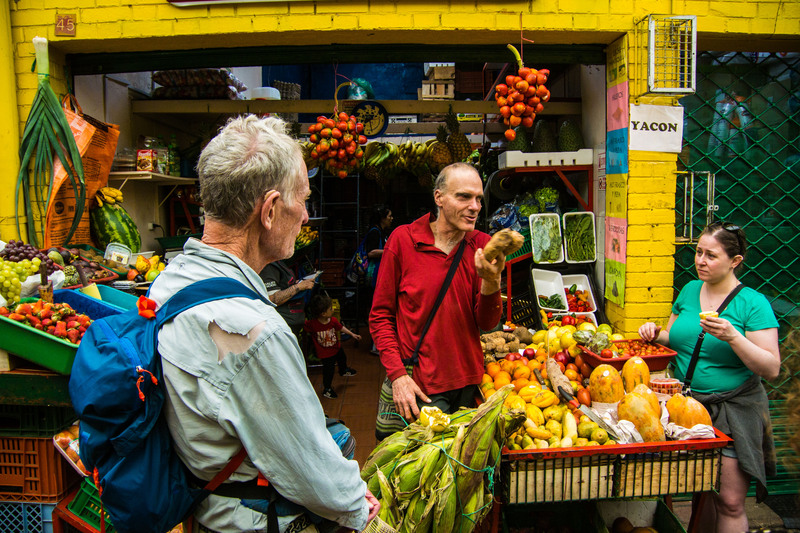 Candelaria is the old town district and our place is on the edge meaning that we can easily walk into the centre to do our business and to get a feeling for the city, or at least that part of the city most tourists frequent. Our primary purpose on the first day was to get sim cards for our smart phones and to find a good bird book in English. Both objectives were met easily and so we had lots of time to get a feeling for the town, the people and of course to scout out the good places to eat, a high priority on our list of travel objectives. 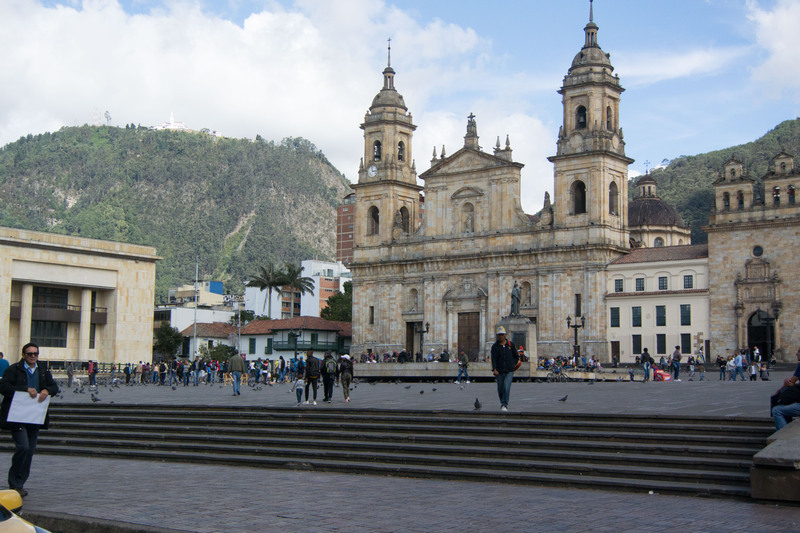 Bogota seems very clean and pretty safe, at least during the day and in the tourist frequented districts. There is a large soldier, police, security guard presence, possibly indicating that things are not always so peaceful. We were warned not to venture too far a-field a few times including once when I tried to get up above the district we were staying in. When two soldiers armed with AK-47s suggest you turn around you do. 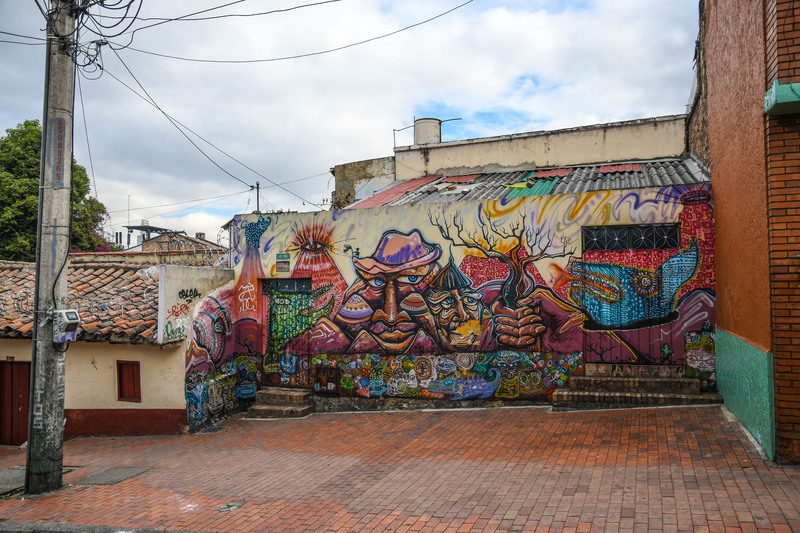 The street art is quite exceptional and along with the old colonial architecture and interesting people just wandering here is so much fun. I am always in search of old books and found a district with dozens of book stores, at least one of which had a good English language section. 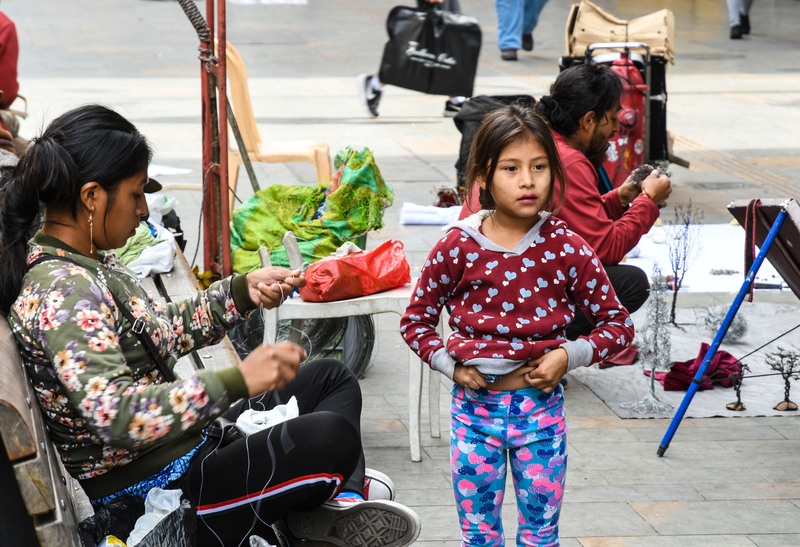 There are countless people, often whole families out on the streets making and selling things. But they were not obtrusive nor were there many beggars. The one museum I went to specialized the fat things painted and sculpted by Bartolo. 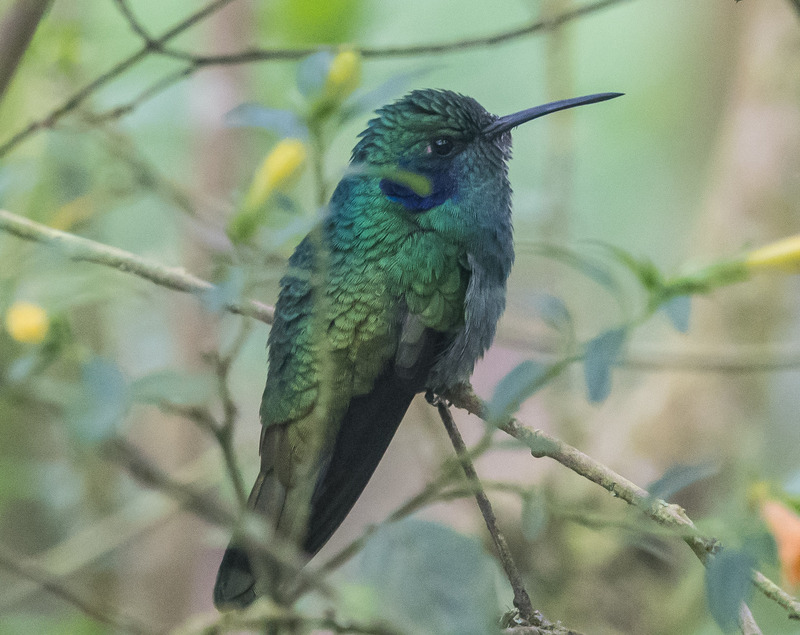 On our second day we took an hour uber ride to La Florida park purportedly with a good birding potential. 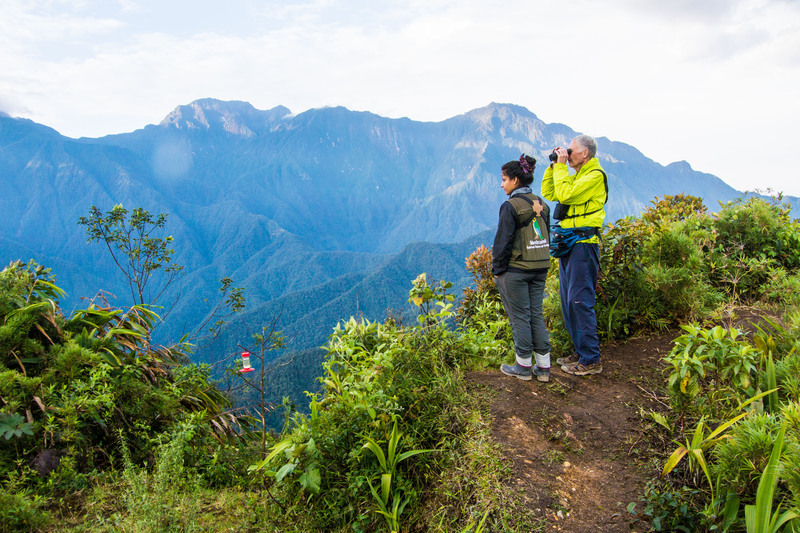 Bogota is at 2600m which will determine to some degree the types of birds we would find. The ride through the city gave us a small notion of the magnitude of this city of over 7 million. 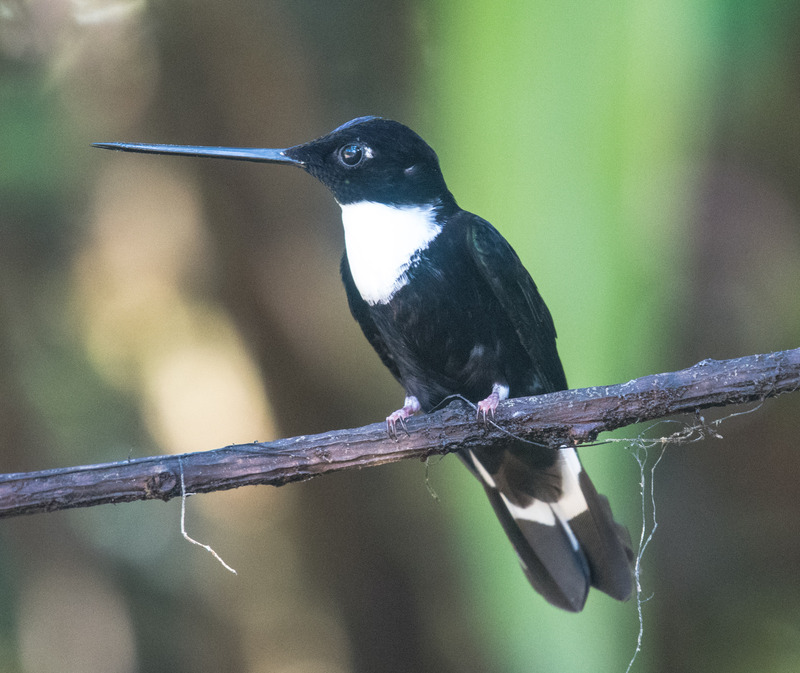 We didn’t do very well from a birding perspective, possibly a dozen species (Rich’s main interest) and three or four good photos (mine) but did have a nice three hour walk before calling upon uber to get us back to our hotel again. We flew to Santa Marta, on the Caribbean coast and took a cab up to Minca a small town at about 700m in the Santa Marta Mountains. 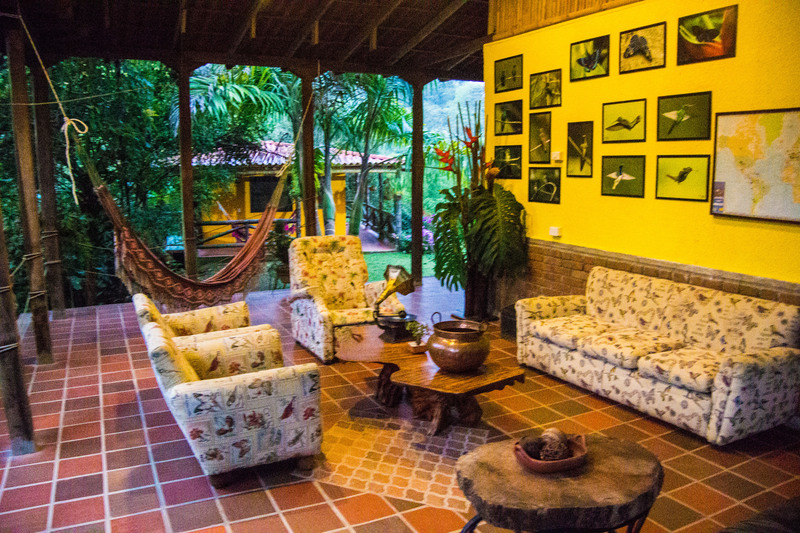 This is a” backpacker” haven that is also famous for its birds, the feathery kind. 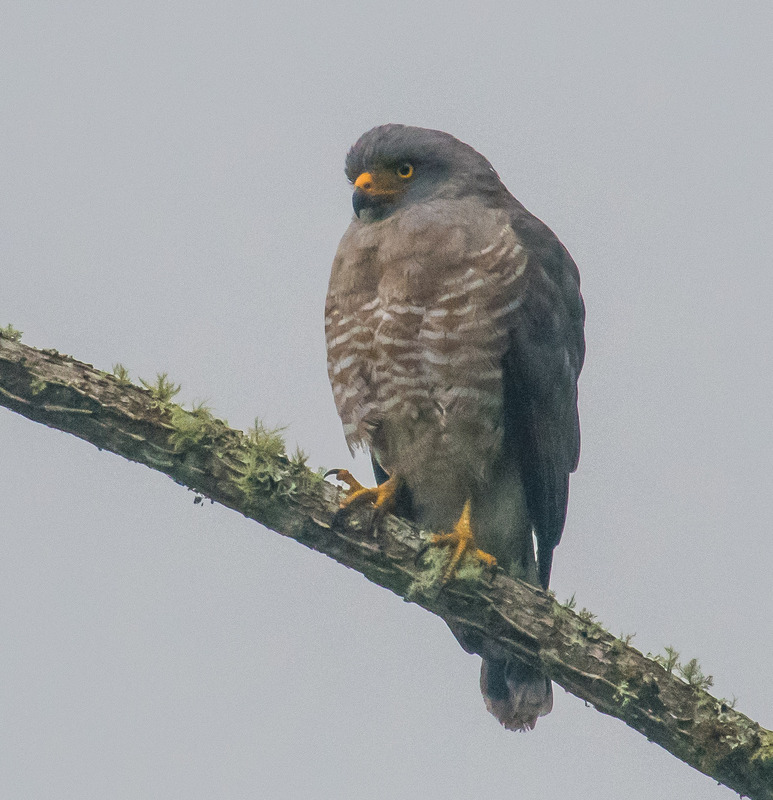 We were in a small guesthouse a further km along on a rough road that yielded many birds to us over the next few days. But the first official outing began the next morning. We were up a little after 5:00 and walked the km back into Minca with our flashlights. 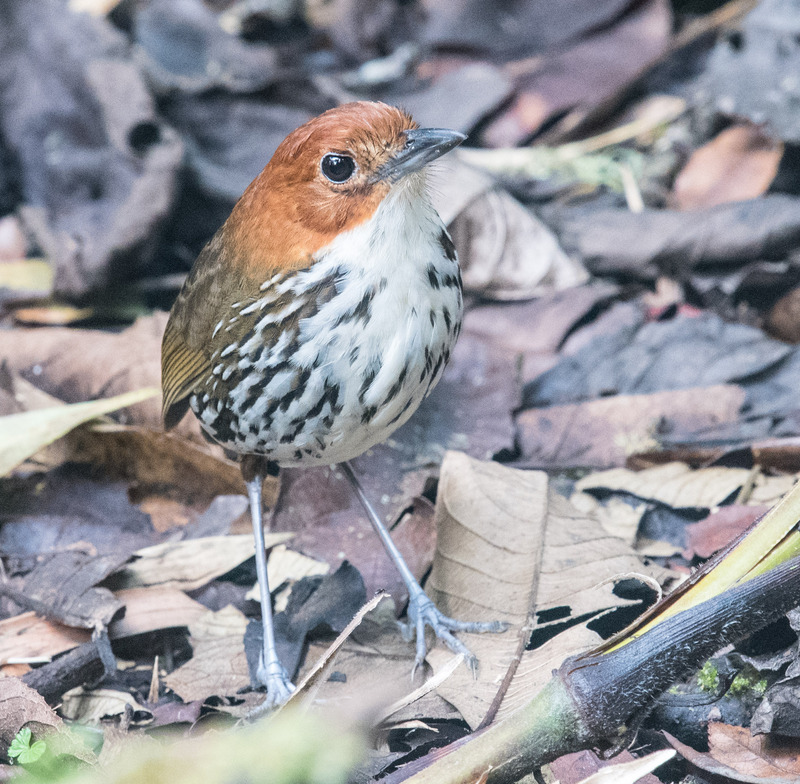 We joined about 15 others, mostly young backpackers, to go with “jungle joe” for a three hour beginner birding walk. “Joe” provided binoculars to those without. 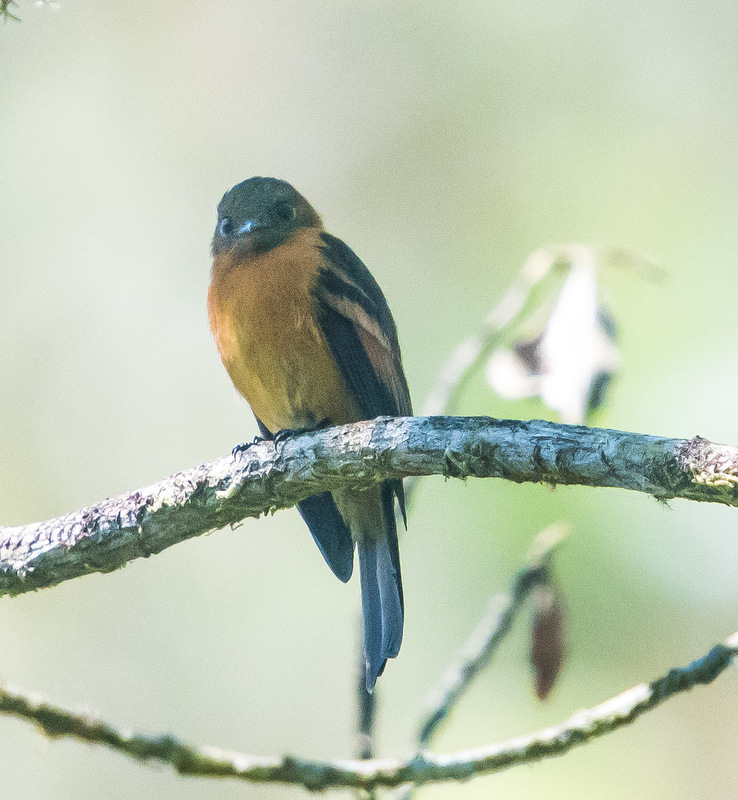 The first hour was spent scanning the tree tops within town where many flycatchers and tanagers were flitting between fruit and insects. 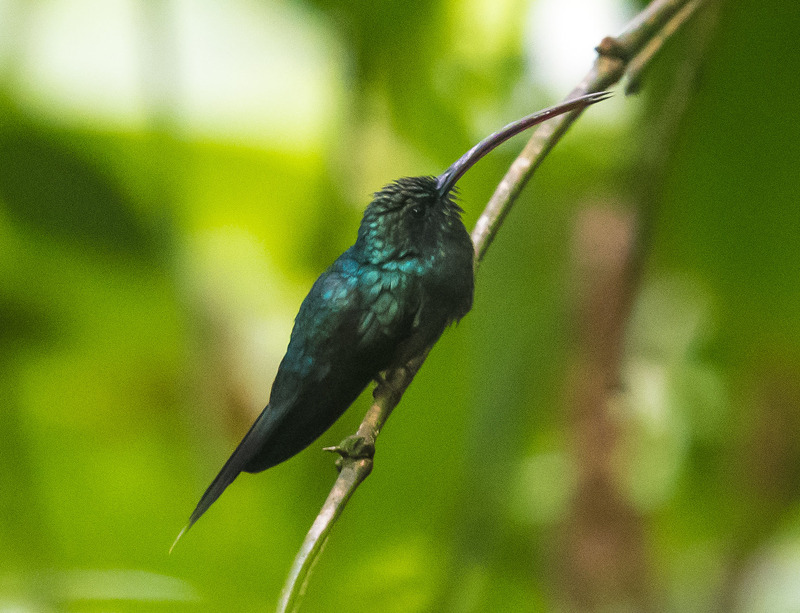 We then walked a few of the dirt roads and found woodpecker, Aracari, Toucan, Kingfisher, motmot, oropendula and others. This was a great start to our Minca leg. We were able to get back to our guesthouse in time for breakfast. 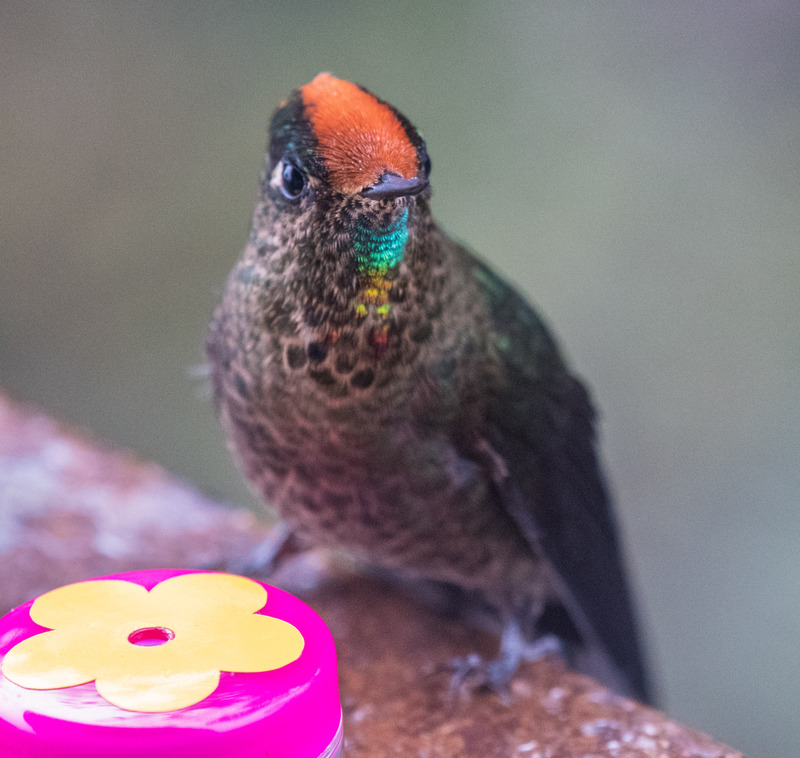 Hummingbird feeders at the guesthouse were not very well tended but I did manage to see two types. We negotiated a full day outing with Marco, possibly the area’s most proficient guide for the next day. We were up about 3:30 for a 4:00 am pickup. 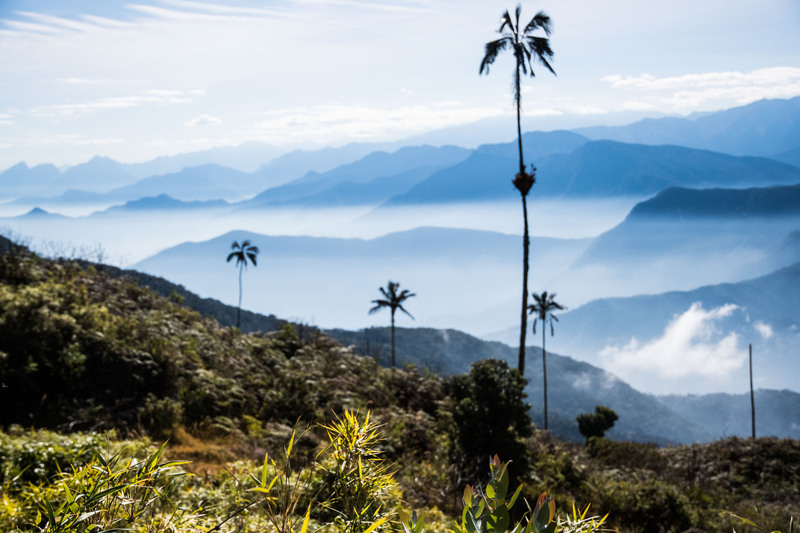 A three hour excruciating Land Cruiser ride with Marco and a driver got us to the top of a high Santa Marta ridge at about 2800 m. Marco then began calling birds out of the foliage. 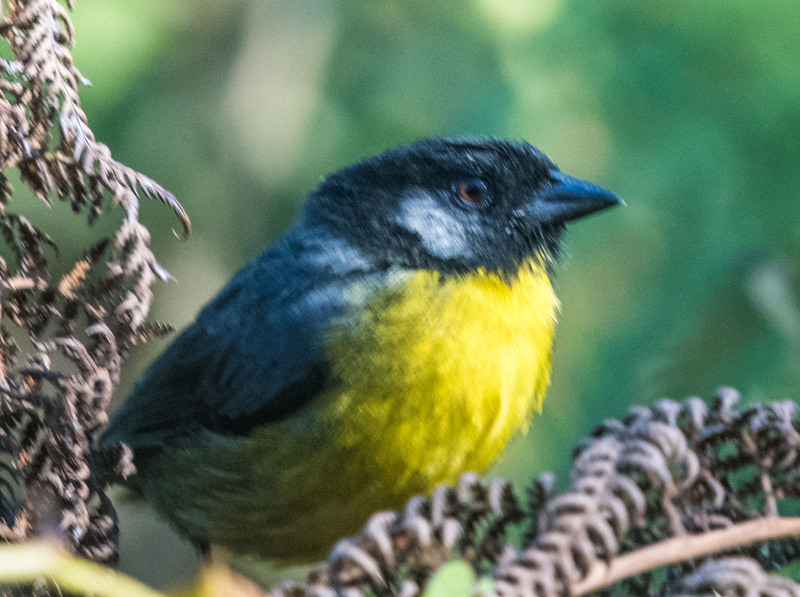 A number of them endemic to the Santa Marta area like the Santa Marta Brush-Finch. We had indicated that endemics were no big deal to us but I guess if you hire Marco he is going to give you endemics. 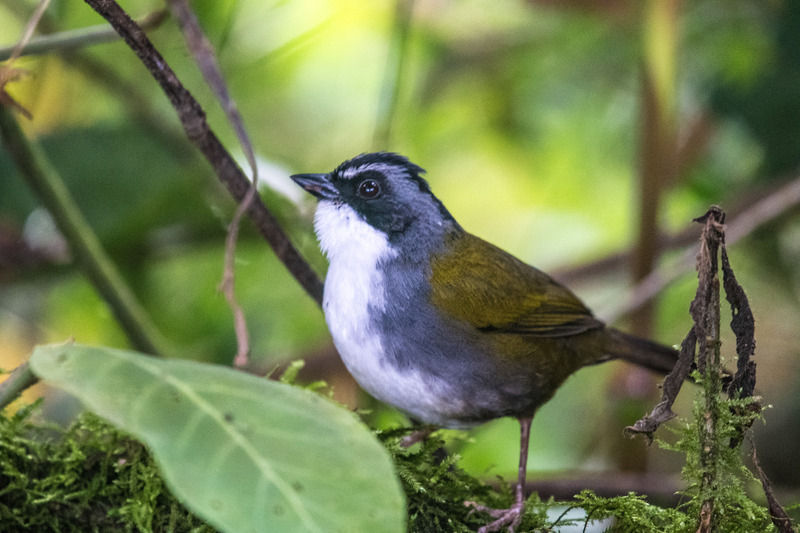 The number of birds and the number of varieties much less than around Minca but it was fun to find these rare finds and inspiring to watch Marco in action. 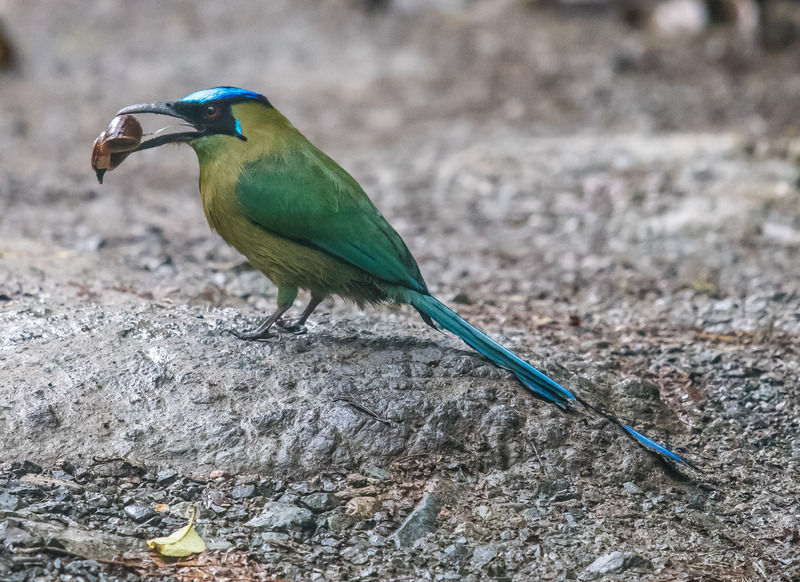 Among those we found were types of toucanet, quetzal, falcon, hawk, tanager. This was a long tough day and completely different than the experience with Joe. 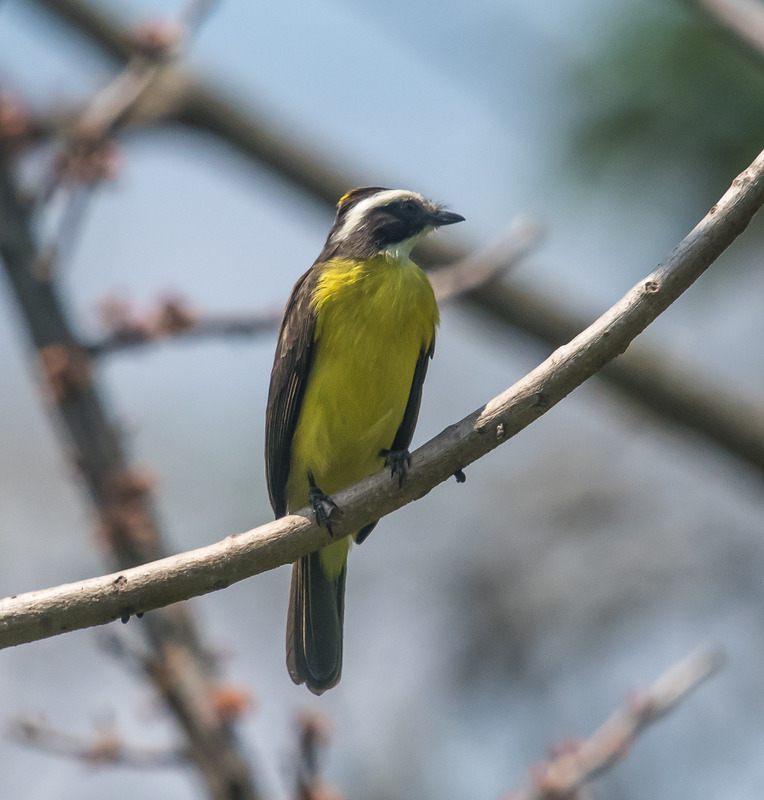 We did some independent birding the next morning and I was able improve on some of my photos before we caught a taxi for back down to the seaside town of Santa Marta. 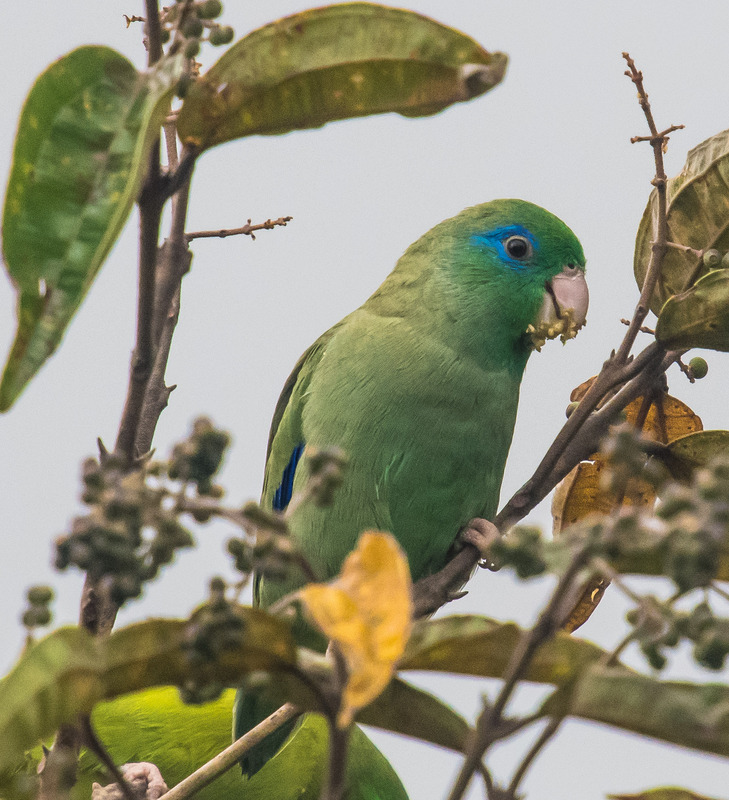 We left Minca finally feeling that we were in birding country even with our tiny sample of birds that might be seen. Just two nights in this transition town. We had an afternoon of wandering the waterfront and old town. The next morning we got on a local bus for an hour and a half to the entrance of Tayrona National Park. We got out of the bus and walked over to the gate but were honked back to the bus. Apparently the park closed today for the next month. Not sure why but we were out of luck. Back on the bus we were let out a bit down the road where we walked on back roads for an hour or so, finding a few birds. We had lunch at a small beach area and took moto bike taxis and a bus back to Santa Marta. Our one primarily tourist destination on this trip is the old colonial town of Cartenaga, one of the oldest towns in the Americas. It is a prime destination for Caribbean cruise ships because of its attractive old town and its history. 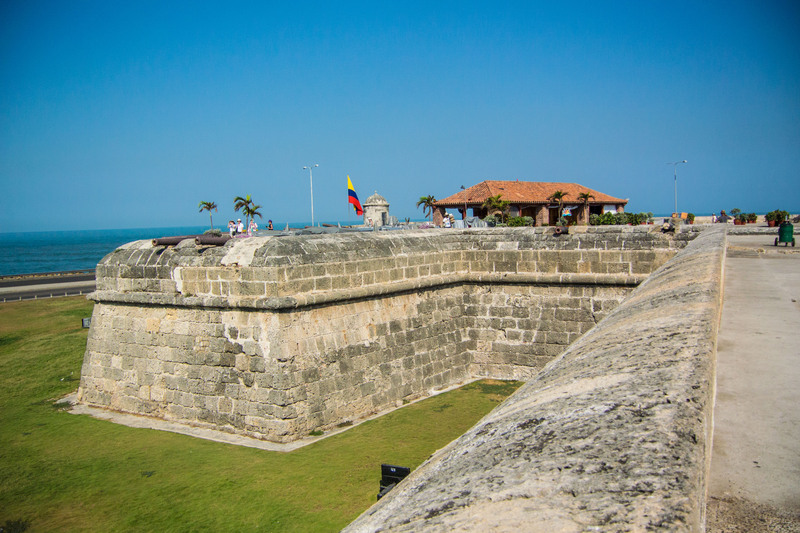 It was attacked five times by Pirates during its Gold pillaging days. I guess the rule in those days was that the Spanish stole from the aboriginals and the Pirates stope from the Spanish. There were probably more thieves in the mix further along the line. We had good food on two nights and one day walking the old town. Great easy place to visit. No feathery birds, but lots of nice human kind. Tomorrow it is off to bird country. 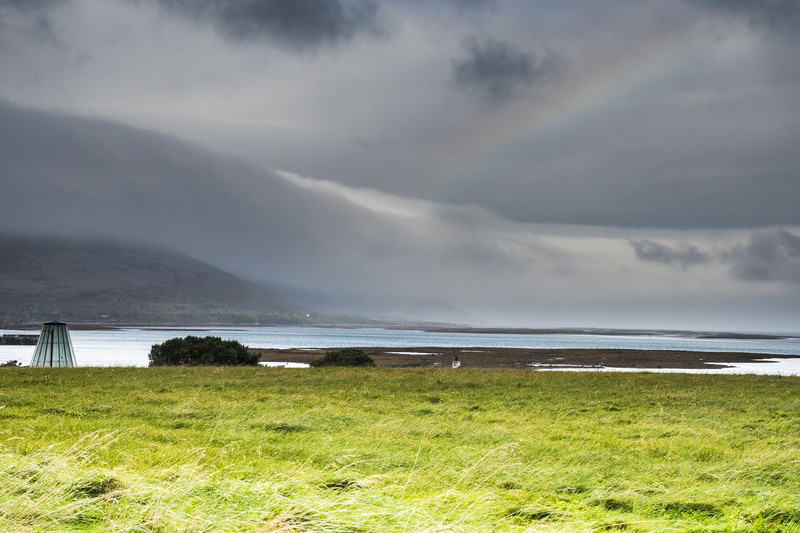 I am doing this final post on Ireland after having been home in Calgary for a few days. My favourable wind and good weather came to an end. It was not a long ride from the cosy B&B in Whitehead but it was made more challenging by the wind and rain. My B&B host, Dave had me watching for a bike trail that meant half the ride into the centre of Belfast was traffic free. I arrived a bit before noon and found a restaurant/pub with a foyer where I parked my bike so we were both out of the rain. A good long stay and I was almost able to get dry enough to warm up. As my Cell connection is a bit flaky in N Ireland finding the B&B apartment amongst the row housing was a bit complicated, but it worked out and I was able to get in early and into some dry clothes. The rain never let u so I didn’t have much motivation to go very far afield to visit things in Belfast. George’s Market was close and so that is where I spent my free time. Mostly food and kitsch kiosks but the rain had brought people in so things were active and good people watching. I had an early rib dinner and then into bed. More wind and rain greeted me on a fairly minor road out of Belfast. The hills added to the challenge and so when I joined the busy road at Ballynahinch my soup and warming stop felt pretty good. The second half of the day, on flatter busier roads was quite a bit easier, although the weather didn’t improve. Newcastle is a beach town with white sand on the curving bay fronting much of the main road. 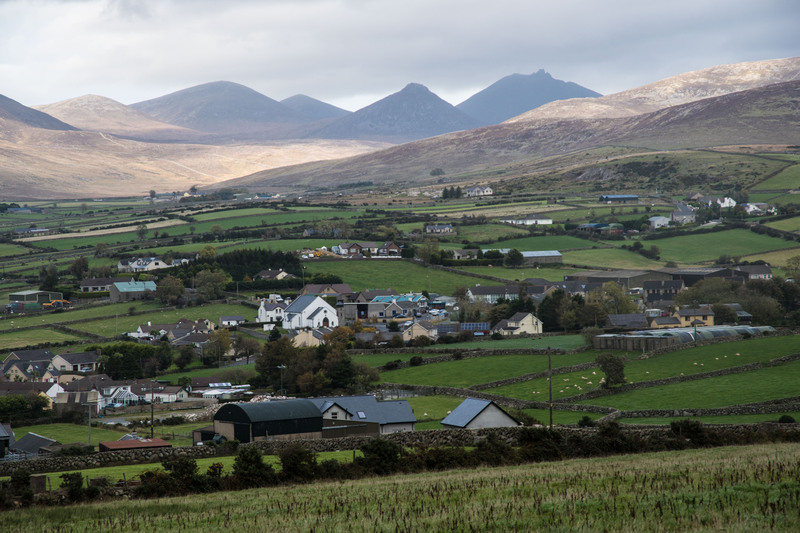 The main attractions for me were the Mourne Mountains rising above the town. My hotel was quite cheap but my room looked over the bay. I was struck by the deep sea colours. My first beer in town was in a lovely many roomed traditional hotel with warm wood décor and fireplaces that had real fires. In nicer weather it would be a nice spot to stay. I had picked out The Mourne Lodge, a hostel/B&B in a small town called Atticall, in which to spend two nights in hopes of some walking. 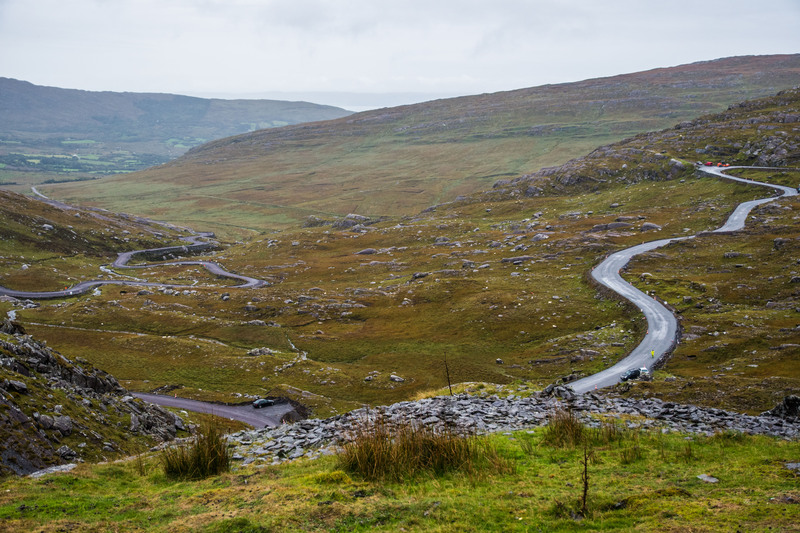 My route was picked from a biking in Ireland book. It chose some very small back roads on which I had to push my bike three times, more than on the whole rest of the trip combined. Luckily it was also my shortest day as I had a stop on the way. 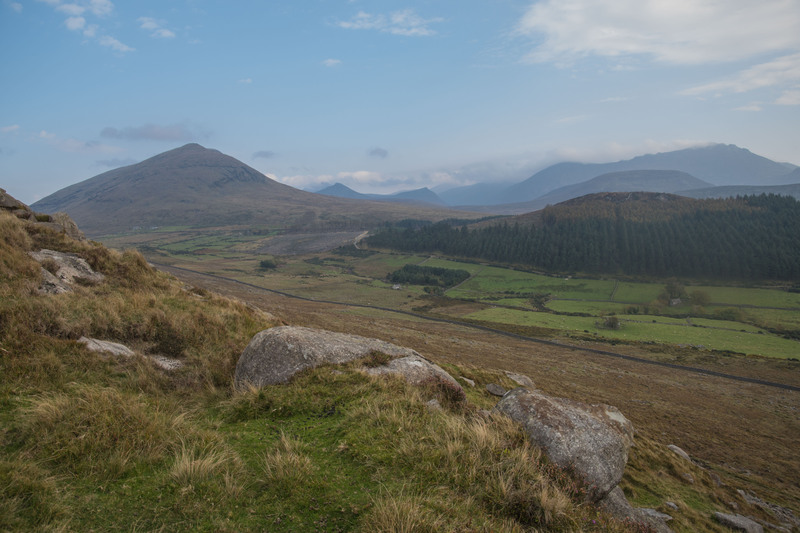 A short side road leads into “The Silent Valley” encircled by a ring of mountains called the Mourne Wall. I locked my bike up and walked for an hour mostly on some of the many forest trails in the park. I did get up to the reservoir in the centre of the park, from where I could look around the ring of mountains that make up the wall. I probably had time to get up one of them that afternoon, but my bike would have been unattended for too long and the wind was too strong for me. A few kms later I got to the lodge/hostel where I had booked a room. Meread, the woman who runs the place had kindly left a note in the entry welcoming me and telling me which room was mine so happily I was into my room early. I used the kitchen to make lunch, food bought from a store close by. There was no pub in the tiny town. I had pre-arranged for breakfast and dinner for my two days. This was a very nice place to spend a little extra time. Meread cooked my meals and ate with me. I was her only food customer during this time, the other guests mostly cooked for themselves or drove down the road to the nearest town that was too far to go for me. 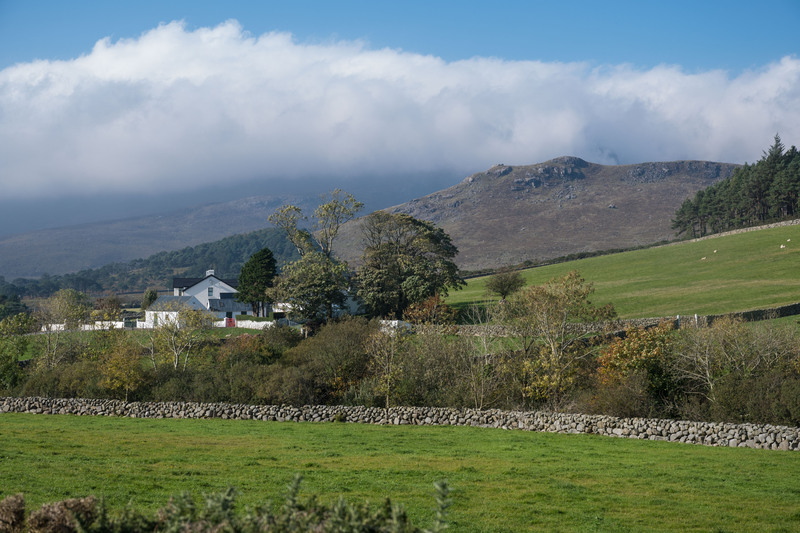 During my first afternoon I walked one of the rock fence bordered roads up to one of the little passes where I took pictures across fields, the village and farms to the Mournes in the north. I could easily be happy just walking these kinds of roads. After about an hour a car came along and stopped. The guy inside just wanted to talk. I could understand much of what he said but I thought he was telling me Jack Kennedy had been up to the same point as I had gone to. Kennedy’s Irish connection was in Wexford and I think he went there on his visit, but who knows. 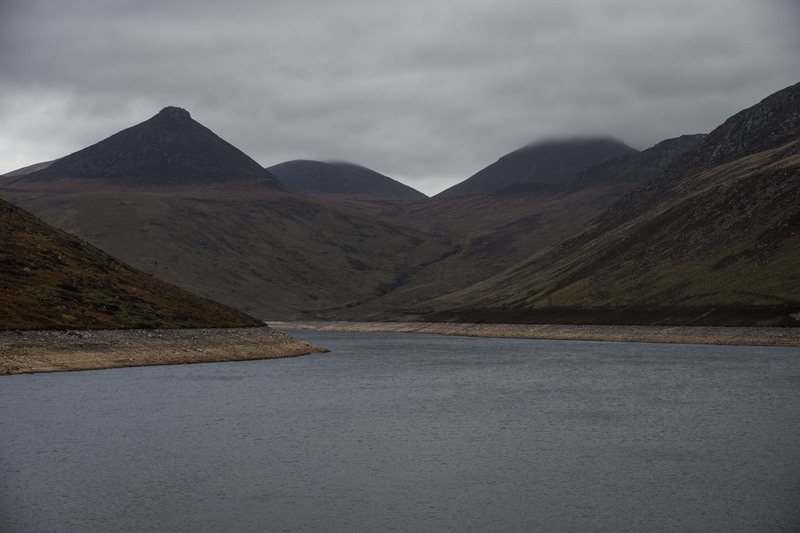 The next day, a full day, I went the other direction, up into the Mournes proper. 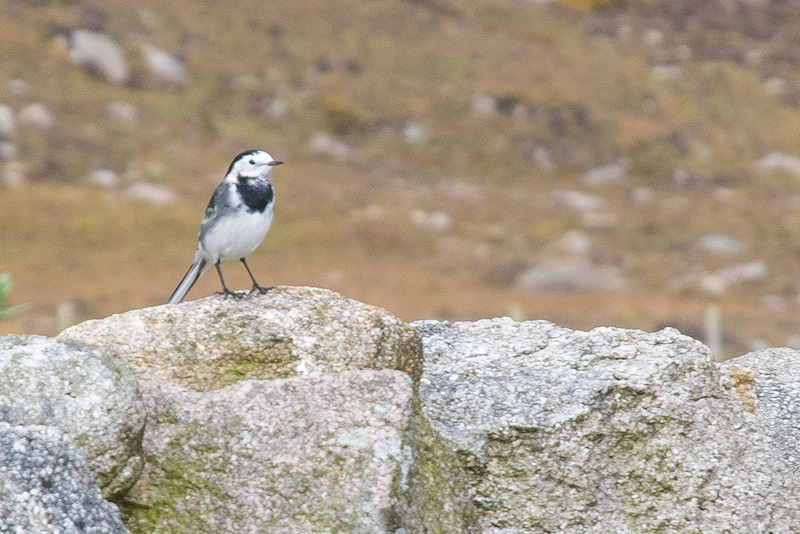 I spent five hours walking about 15 km initially along more roads where I snapped a shot of a nice little wagtail on a stone fence. I headed up onto a small mountain until the wind drove me down. I then snuck across a series of farmers’ fields all enclosed by rock walls. I rock hopped across two small streams and climbed over about five big steel gates. The rock walls didn’t look very inviting to climb on. They are just loosely built and would probably topple if you climbed on them. 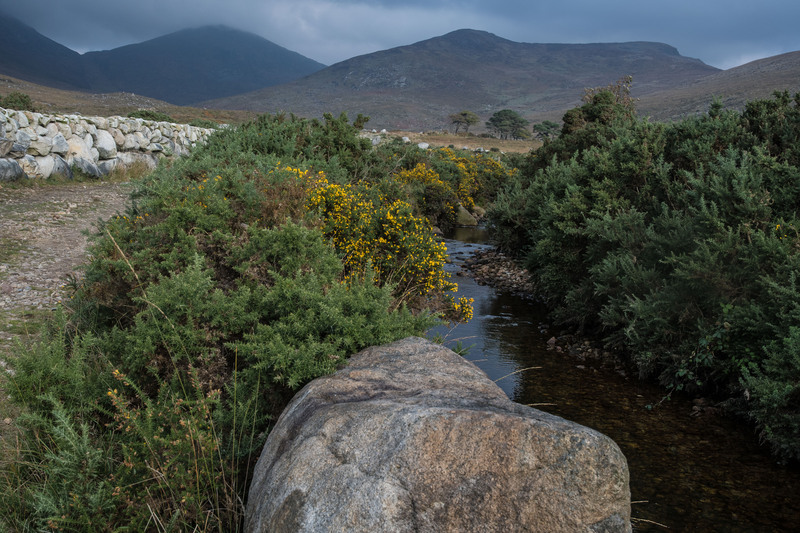 “Canadian Trespasser buried in rocks in the Mournes.” I was successful in making a loop walk out of the day in an area that wasn’t too inviting for such walking. If I had wanted to get on my bike again I could have ridden back into the Silent Valley for more defined and accepted walking. A great day away from the road. 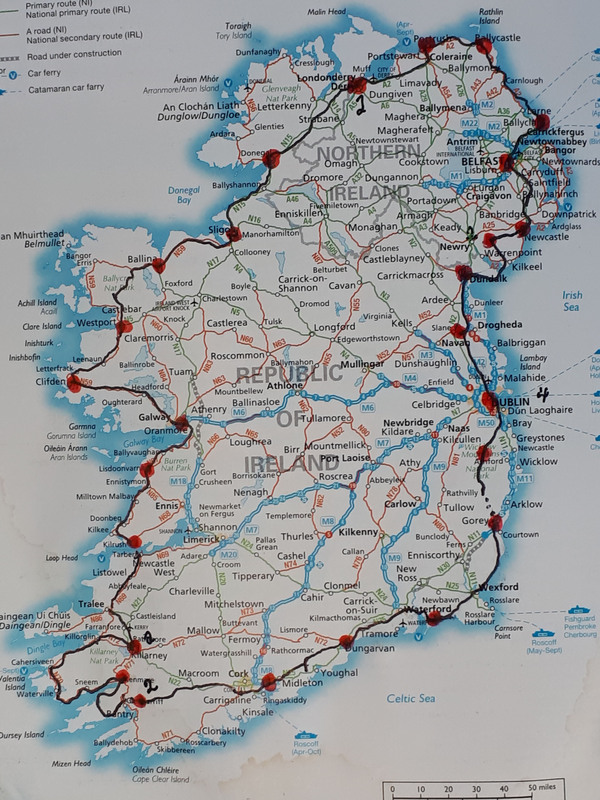 My riding days are shorter now as I booked accommodation to get me to Dublin by Oct 13. And it is OK because the wind is now a strong headwind usually filled with rain. Leaving Atticall I had a fairly short 12 km downhill run to a ferry crossing. I was heading to Carlingford, recommended by Sarah, an Irish yoga friend. I got into Carlingford and saw enough to wish I had planned on staying. But, the rain hit and I was off to Dundalk in time for a late lunch and then I fiddled around town until my neighbourhood B&B let me in. The forecast for this day was for a bad storm with 50 gusting to 80kph winds. I had 60 km to do. The wind was up near the 50 kph as I left Dundalk, but I don’t think I got any of the gusts and no rain to start. It was very slow going, but the road on this day was quite flat so that helped a bit. Coffee and break conversation at Dunleer centred on why on earth people would be out on a bike on a day like this when they didn’t have to. It was a bit hard to answer that one. In the coffee shop it felt like I was in the eye of a tornado, knowing that I would get hit again when heading back out. And then it got worse. The full brunt of the storm, now with rain, hit after my break. I had to get into Drogheda and then a further 6 km to a hotel I had booked near the Newgrange Neolithic (late stone age) site. I stood dripping in the hotel bar for about 15 minutes until they got my room ready. And then I came back for soup and beer hoping at least the rain would let up so that I could go visit Newgrange. When I arrived it seemed futile. But after a wait of about two hours the rain was less and so I rode another 3 km to the visitor centre and it began to clear a bit. I purchased tickets for the centre and the tour to Newgrange, the most significant of the three Neolithic sites accessible from the Centre. Newgrange has a large “passage tomb” that is unique among late stone age sites. The tomb is a large circular earth and rock mound with a 35m entry passage to three tomb enclosures. Each year on Dec 21 at about 9:00 am the sun shines in through a “light passage” to the back of the tomb. 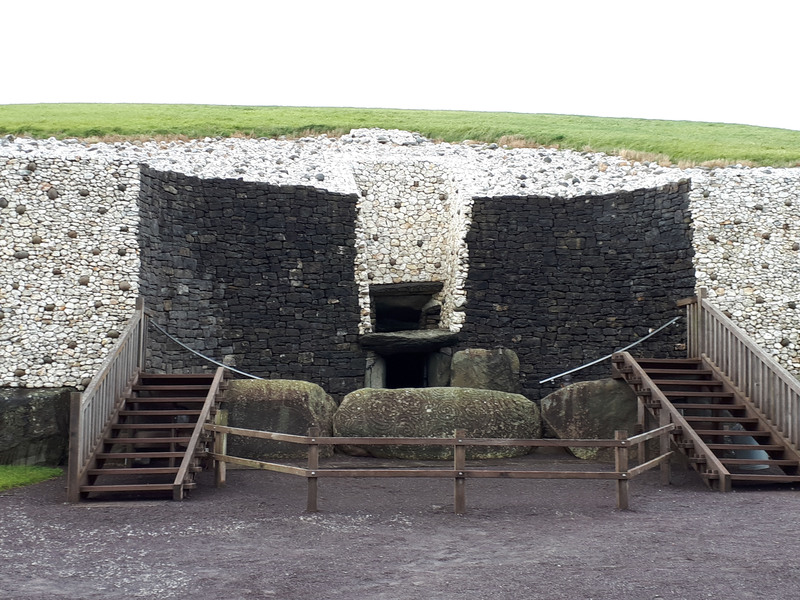 If you want to come to Newgrange and see this happen there is room for about 50 people over the couple of days around Dec 21 to enter the tomb and wait for the sun to find its way down the passage to hit them. The trouble is about 20,000 people apply. The window above the entry is where the dec 21 sun finds its way down the passage. 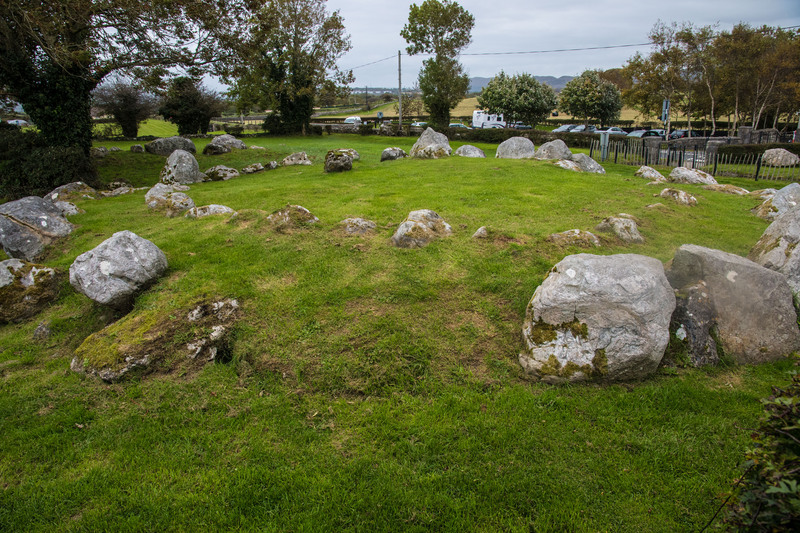 There are two other major sites close by with more of the Megalithic structures like I had seen at my two earlier visits here in Ireland. The people living 5000 years ago had a much more sophisticated life than I realized. They were more than the roving hunter-gatherers I had assumed. These sites and hundreds of others around Europe were occupied often for 100s of years and they show a society that was fairly advanced. Steady wind and rain greeted me on my final day riding into Dublin. I had a mid-ride coffee break where I waited more than an hour hoping it would let up. It finally began to lessen as I entered Dublin. I lucked into a fairly good approach to the city. There was a nice wide shoulder to the road and as it became city a bike/bus lane was to be had most of the way. I stopped for a beer in the city and gave Google the address for my warm-showers host Eoin’s (Pronounced Owen) parents house where I had a visit, some scrambled eggs and picked up keys for Eoin’s converted garage/apartment where I would be spending my final three nights. 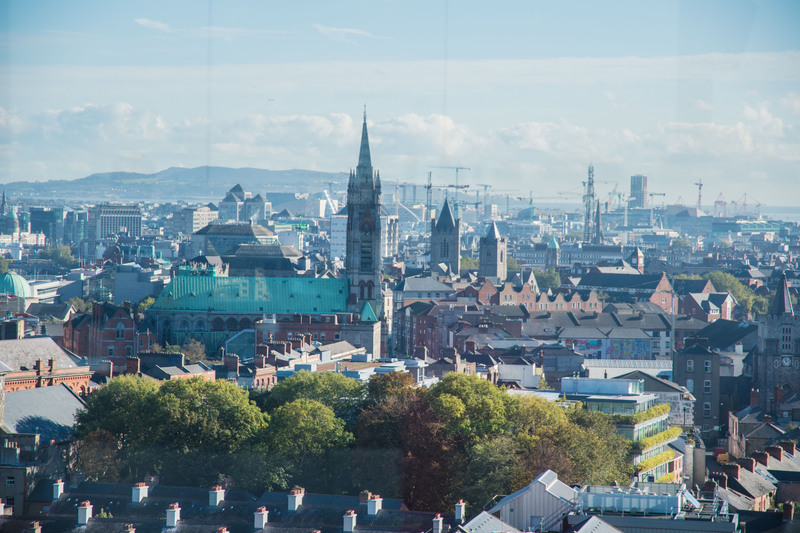 I would have two full sunny warm days to visit Dublin. I cycled about 40 km around the city. Eoin lives near the town centre so it was easy to get around. As the weather was pretty nice I didn’t visit a lot of museums. The one I did dealt with pre-historic to medieval times. Of most interest to me was the section that dealt with the “Bog-People” of which there is almost nothing known. They also had a significant section on the Vikings. I spent some time on the Trinity University campus but could not get into its famous Library. But mostly I just enjoyed riding around. Dublin is a nice bike city. Painted bike lanes proliferate and there are lots of scenic areas. 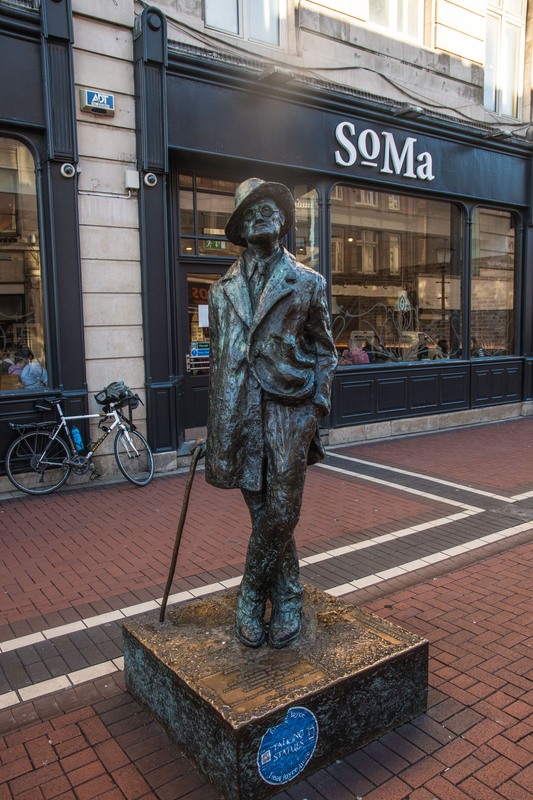 I ran into James Joyce holding forth in the middle of town and Frank Kavanagh sitting on a bench, I believe composing a new poem. 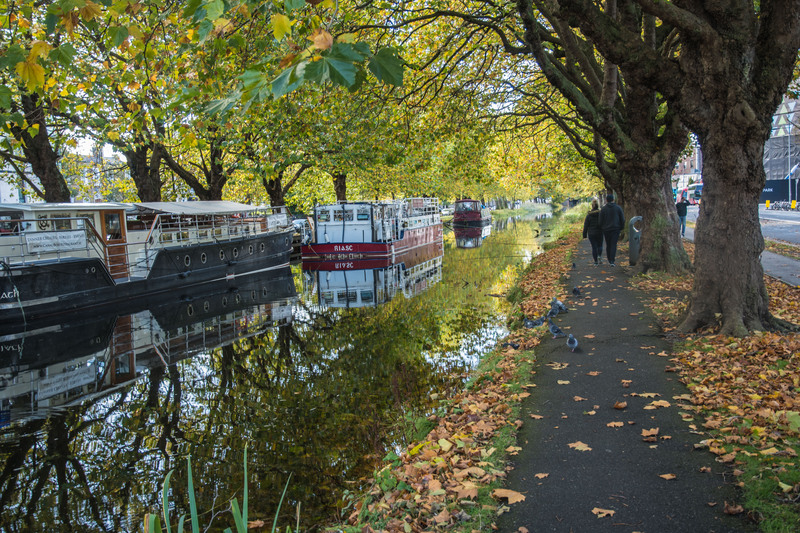 Fall showed itself along the canals. My second day I spent the morning at the Guinness Brewery. 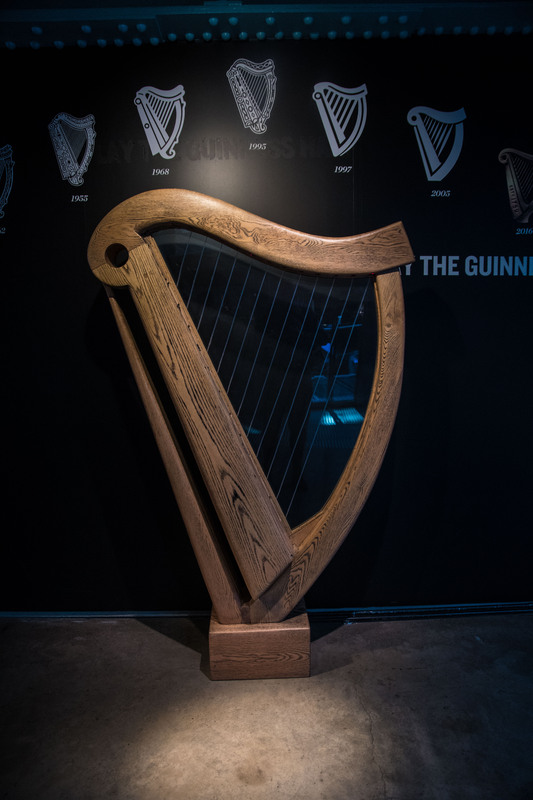 It is a seven or eight story museum and demonstration of all thing related to the history and process of building “a pint of Guinness”. 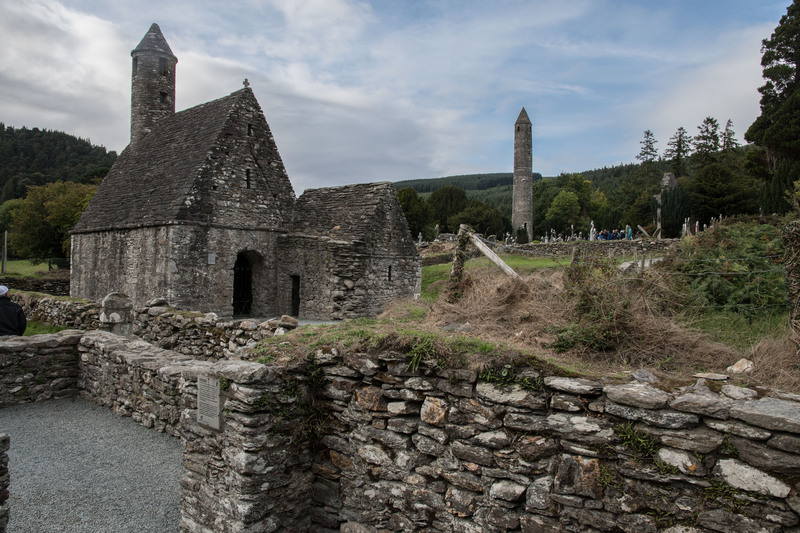 I thought it is very well done and I believe it is one of the top attractions in Ireland. 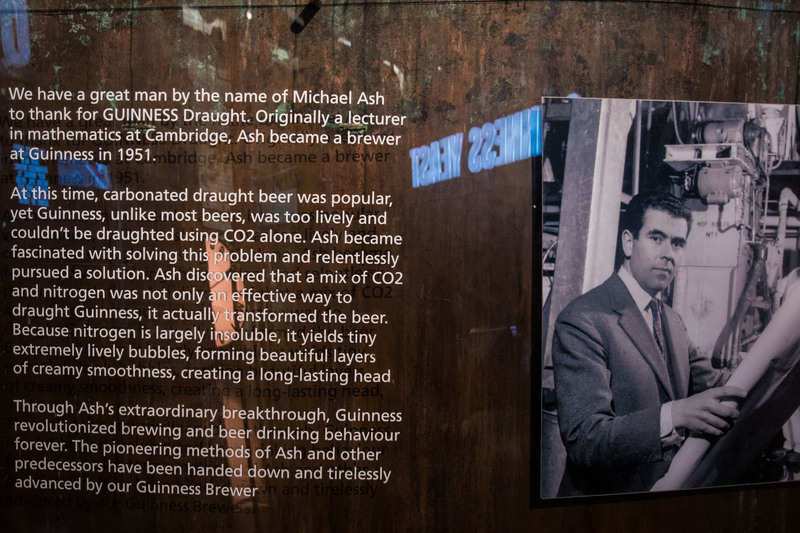 I came to enjoy Guinness while here and it was nice to see that one of the innovators in the production of Guinness was a mathematician. It is not only judges who “like to drink beer”. 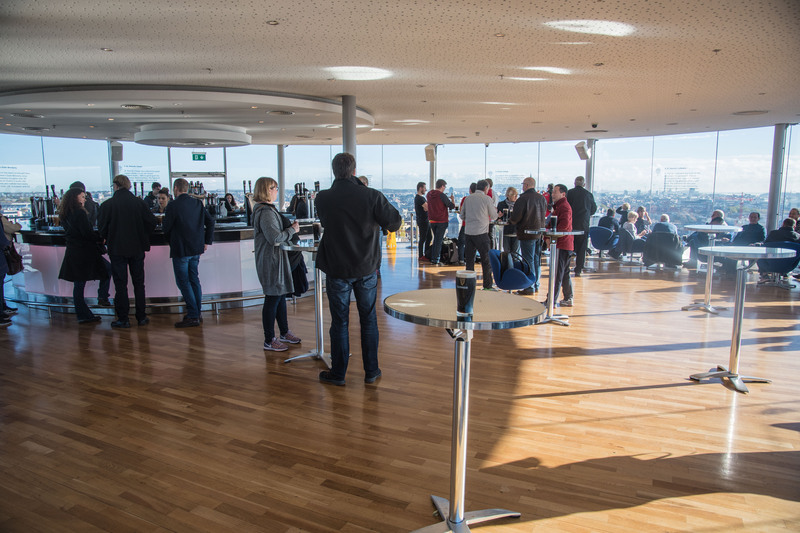 Our not very free beer was served on the top floor with 360 degree views of the city and the distant Wicklow Mountains. That night Eoin’s parents Frank and Irene (spelt very differently in Irish) took us out for a final dinner and the next day Frank kindly drove me and my big bike bag to the airport. I have only had two “warm showers” experiences. Last year in Frankfurt and Eoin in Dublin. Both were exceptional experiences. This has been a great trip. The cycling was challenging and rewarding. 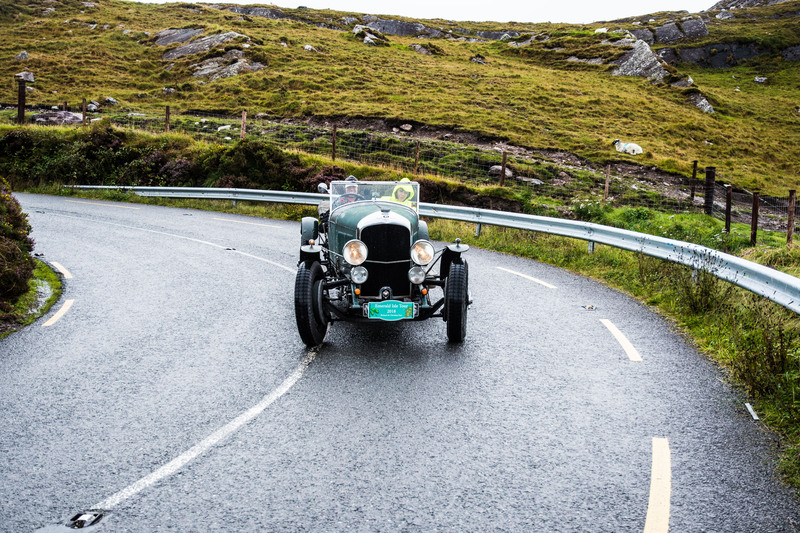 I found the Irish drivers with whom I shared the road to be exceptionally patient. Never did I feel threatened. I think it might be my first trip in some time that nothing went wrong with my body. The beer and food were excellent. I stayed mostly in hostels, then B&Bs and I think 4 hotels. My tent never saw the light of day. It was definitely colder, windier, and wetter than I had expected. I didn’t keep accurate count of the kms I notched; I think between 2000 and 2500. Looking at my map I see that I stayed much closer to the sea than I had initially thought. I had at one time hoped to get well into the centre as well. All for now…Talk to you on my next adventure, wherever that might be. Cold and pretty clear as I climbed the hill heading out of Clifden, near the outer-end of Connemara. The hostel hostess had made a full breakfast for me, much beyond the normal continental style offered in most hostels. 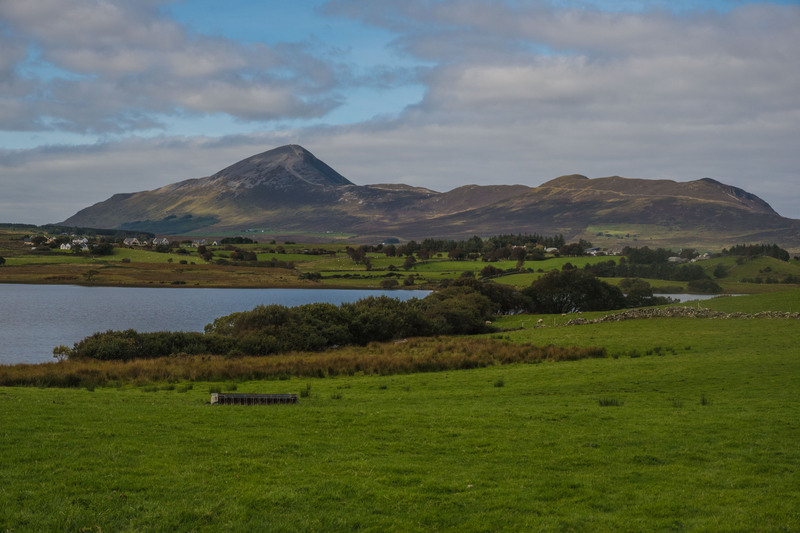 Like the road into Connemara from Galway yesterday there were quite a few lakes and even more hills, as I would spend the day riding north through and eventually out of Connemara. With the clear skies I was able to take a few pictures. The hills are quite barren of trees, much the same as I have seen whenever close to the sea on the west side of Ireland. But they still have their beauty and beckon the walker in me. But I am headed north, still under the notion that I have to keep going while the weather permits. 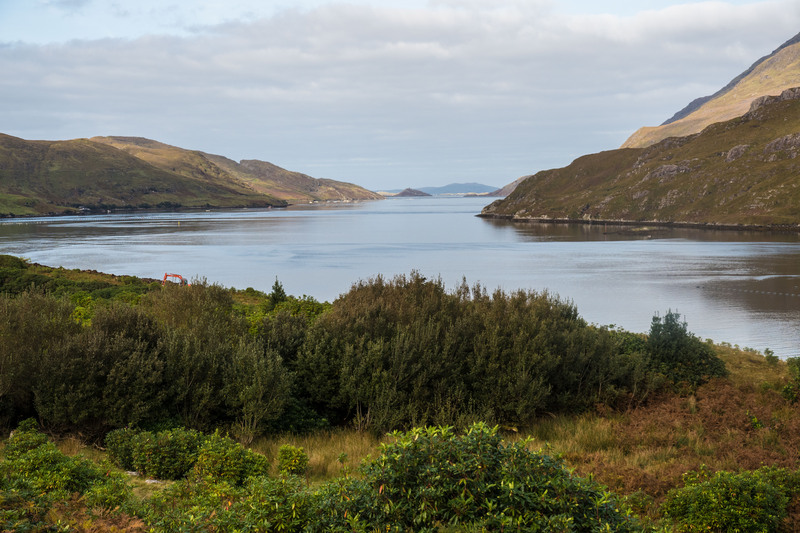 The road dropped from the hills down to a long fjord where I stopped in Leenane for soup and bread. I had an option here to take a quieter road through the mountains, but as it would more than double my remaining riding for the day I gave it a miss. The road I chose rose steadily from the fjord to a high flat area again; and it wasn’t very busy anyways. As I was approaching the end of the day I noticed a high bald peak with a predominant trail leading up to its summit. In town I would confirm that this is Croagh Patrick. In less windy times or when I was more moved to take a day off rather than moving on I would be stopping to do this pilgrimage to celebrate Ireland’s Patron Saint. I naturally arrived in Westport a couple of hours before the hostel would open. But it is a nice town with a good information centre and a quiet scenic river at the bottom of the main streets. This hostel, 35E up from the normal 20E or so I have been paying is in a lovely old historic mill. The girl at the reception desk was French and helped me into a nice room with a bottom bunk. There were three other young French girls supposedly helping. Two lounged around the common room busy with their cells not connecting with people at all. 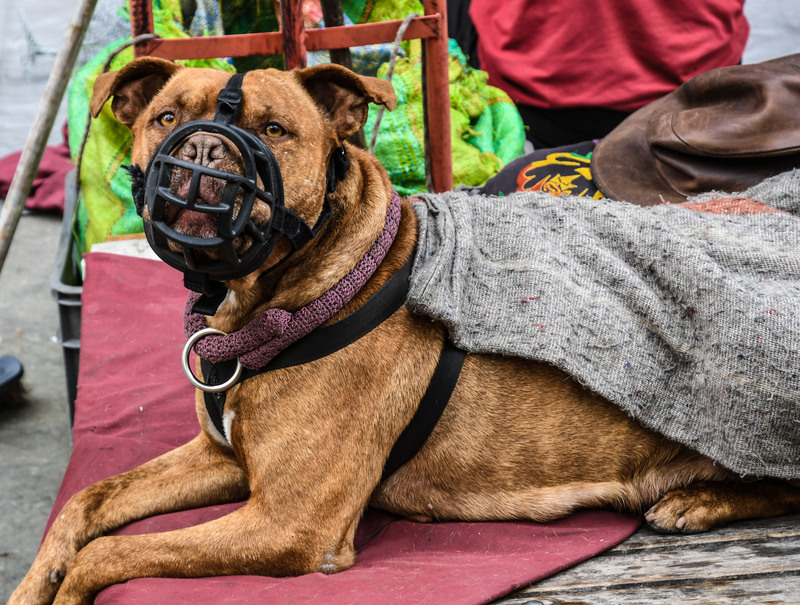 In the morning I stood outside for about ten minutes before one of them sullenly came out of an adjoining room, opened the common room and the room where my bike had been stored and then resumed her cell phone work. I had some nice bread and jam and hit the road. The first real negative experience on this trip. My route to Ballina was not very direct. It started on a 12 km section of the Westport Greenway. I had so much enjoyment on my Waterford Greenway experience I decided to redo part of that at any rate. Much of this Greenway was away from the road as at Waterford but here the trail was mostly fine black cinder, which still ran well on my moderately skinny tires. Unfortunately it wasn’t much of a ride for me. I think the full Greenway is about 40 km, but only 12 were in the direction I wanted. The rest of the day’s ride was on very quiet R and L roads. At times I was so isolated, sometimes heading in quite the wrong direction that I wondered if the road was correct. But as usual just before noon about 12 km short of my destination I popped out into Crossmolina where I was able to find a supermarket with a sit down deli where I could have my mid-day soup and a break. It was Saturday and the streets of Ballina were packed as I came into town. I had had no luck finding a reasonable place online, the information office was closed until 2:00, and a hotel told me only one hotel had any room left and the quote I got from them was 149E. I decided there was no use waiting for the Information people to tell me the same thing. I went back online and booked an 80E B&B. When I have been riding all day and then stop I start to get cold. The sun never seems to be out but the wind is always at work and even the little sweat that I generate chills when I stop. So I want to get out of my wet stuff into a hot shower as soon as possible. As it turned out, the place I booked was 4km out of town, which means that if I was unable to get in I would have to ride back into town to find a pub to sit in. Often hostels and B&B don’t let you in until 3:00 or 4:00. 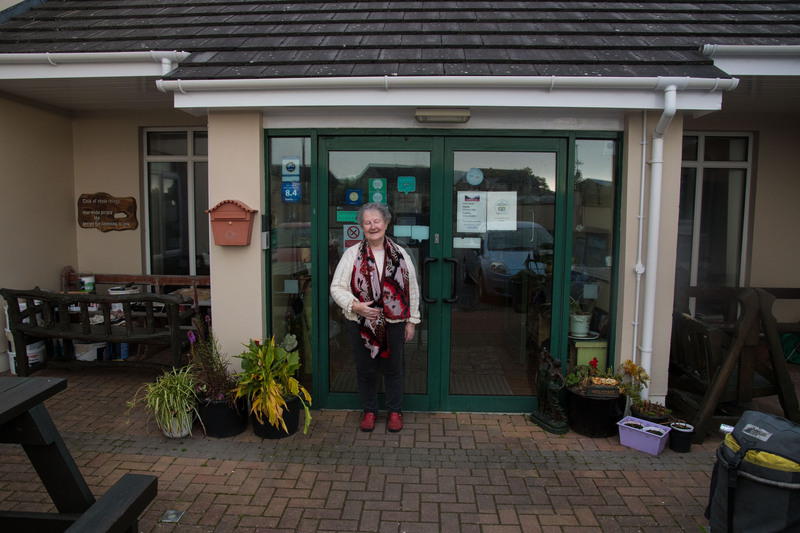 As it turned out, just as I pulled into the B&B yard at about 2:00 Breege (Bridy), as it turned out my hostess was called, pulled up in her car and was more than happy to let me into my room. She only took cash and so she drove me back into town to find an ATM and then later she took me about 4km in the other direction for a wonderful roast lamb in a pub and picked me up again when I was through. To top it all off, as if this was not enough, she washed all of my clothes and then reduced the price to 70E for everything. Every now and then it is great to use a B&B, especially one as nice as the Breege’s place. A full Irish breakfast with all the coffee I can drink. Another benefit of using B&Bs. Joining me for breakfast were four members of a ten person group from PEI on a ten day adventure tour of the north. Their guide was a young extreme adventure racer who lived in Ballina and who one of the group had met on a business trip. They were travelling by bus to locations where they would bike, hike or kayak. 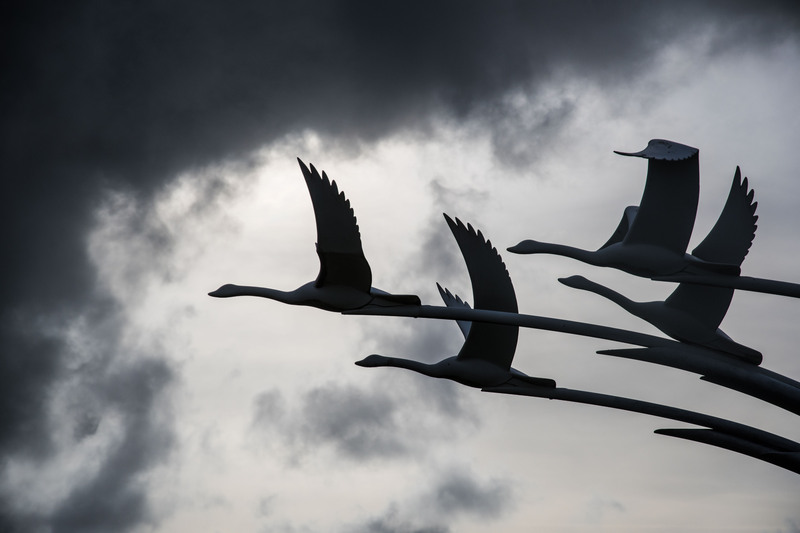 The four I saw would be in their fifties and for them it had been a very rewarding trip. They had one day left. The cold west wind was in full force as I hit the road and I was going east appreciating the reward from so many days of fighting against it. After too short a time I turned north so it did not help as much. When I stopped for my soup I had already gone 50 km and it was still only 11:00. Often I just need to get out of the cold for a while. A little later as I neared Sligo I turned west off of my route into the wind for a while. I was heading to Carrowmore Megalithic Cemetery. A lovely farmyard type setting for a number of Dolmen, burial mounds and stone circles. They date from about 3000 BC. It is hard to make much sense of them or to imagine why people at that time put so much effort into creating these structures. 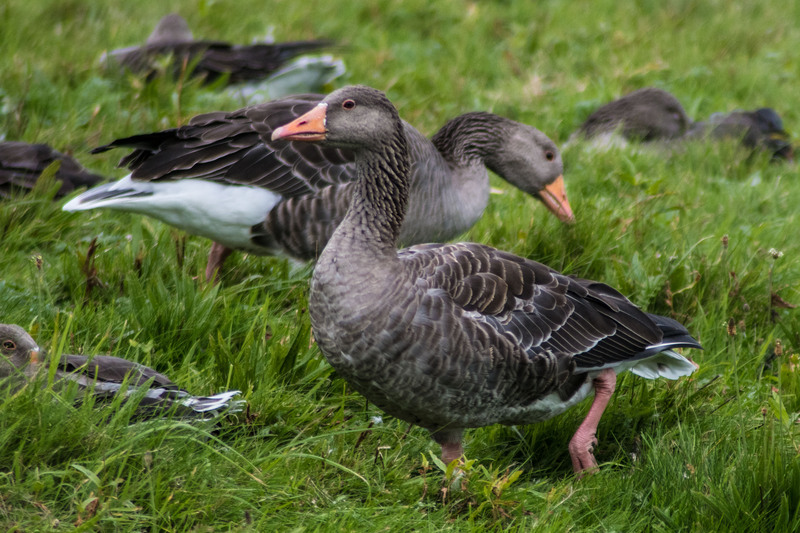 They exist all over N. Europe and seem to have a high degree of consistency. For me it was a nice hour walk through the fields. In Sligo I had my most basic hostel yet. It was a rough place but the owner who I had contacted by phone was nice enough to let me in early. This was the final Ryder Cup day, so I found the downtown section and spent a couple of hours in a pub watching the shellacking Europe laid on the US. The only time in Sligo until I was in bed that I was warm was when I was in the pub. If I lived in Ireland I guess I might become addicted to sitting in the pubs; they are always warm. It is interesting that when I have a very good evening experience like in Ballina I have a poor one the next night and it works the other way as well. Leaving Sligo Hostel without breakfast it took 20 km before I found supermarket in hopes of something hot to eat and especially to drink. This one did not have a sit-down section so I had a fruit drink and coffee sitting outside. This was not helping to warm me much. In Ballyshannon a further 25km along I had a small Irish breakfast and sat for an hour. I am not describing the country much as I roll along these days because there is a sameness to the rolling hills, the often busy roads and the grey cold days. I love the physical act of riding, even when fighting the winds but the only birds I see are Crows and sometimes seagulls. I enjoy the little towns where I stop to eat or drink, but mostly I just sail through them. As usual I pulled into Donegal, my destination town far too early (1:00) to expect the hostel to be open. The central square (diamond they are often called) was very busy with tour bus visitors and I did a slow walk around before settling on a coffee shop for a rest and read. 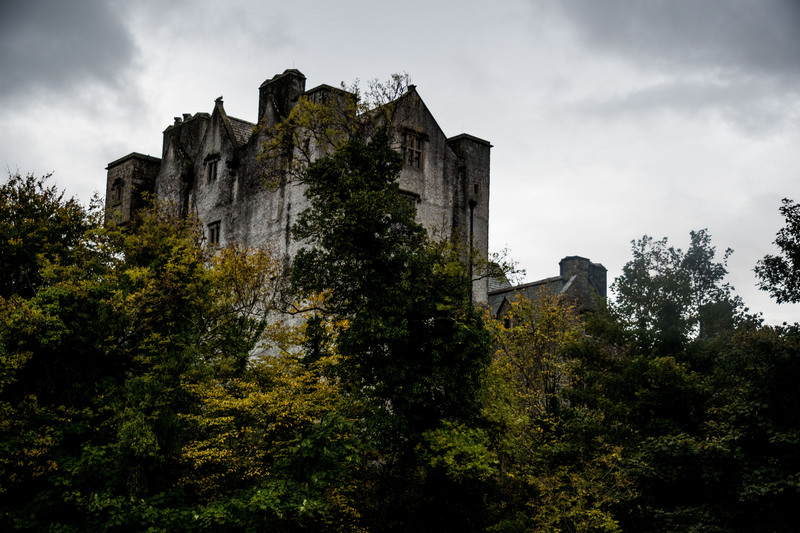 In my e-guide to Ireland they mentioned a river walk that took part of an hour, but I couldn’t get into the foreboding castle. The hostel is 1.5 km out and again I was lucky; at about 2:45 the hostess was there and she let me into my room. This in contrast to the Sligo hostel was a lovely place. I had a full Irish breakfast that I was unable to finish in a service station on the way out of town. My first 30 km to Ballyboffey (love the names) were on a wide busy highway that had a generous shoulder most of the way. It had rained all night but the day began to clear as I was riding. The morning took me over a fairly high pass on the nice road but then as I came down at high speeds the roadwork began and all that early work did not return a fast down-hill. The rest of the day after Ballyboffey were spent on quiet roads. At 11:00 I stopped at Raphoe for lunch and was given a tip on a nice side road. But when I tried to find it I must have missed my turn and it added a few extra kms. Still it was lovely riding. 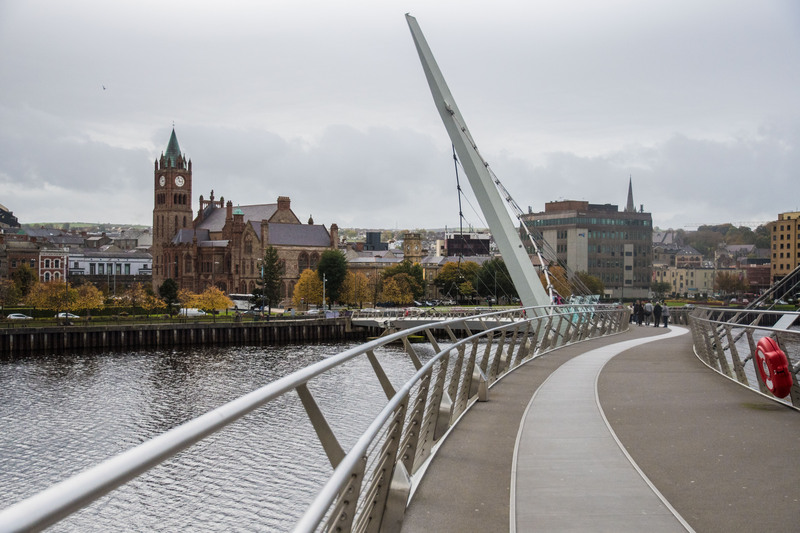 I came into Derry (Londonderry) along the River Foyle, which becomes a tidal estuary as it enters the city. It is quite wide and the first thing of note as I approached the centre of the city was a new meandering foot bridge called the Peace Bridge. I had pushed quite hard on this day not real certain how far I had to go and I noted that it was only 1:15. So again I had coffee and a treat for a while and then phoned the hostel and the young guy running it gracefully agreed to let me in early. By this time I had already decided that I would take an extra day here. There are quite a few things that I was interested in and it had been eight days since my last break. I would get to quite a few things on my first afternoon and then I cleaned up on my interest list the next day. There is still a non-violent resistance to the British in parts of Northern Ireland and some of that resides in Derry. To begin with there is an on-going issue about the name. London was added to the Derry some two hundred years ago by the British occupiers. In road signage the London part will often be scratched out. I was most interested in a district called Bogside. At one time this was where the poor Catholics lived and it became the centre of the resistance. There are about twenty paintings on buildings reflecting the struggles. They were initially done during “the Troubles” as they were called. The British army would remove them and they would reappear. Today they represent a history of that period. 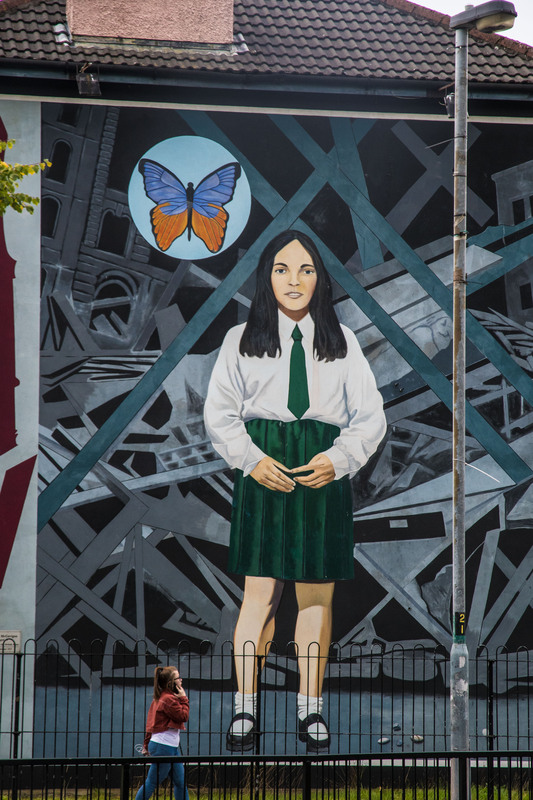 A critical period was about 1971 when people were killed in the streets and some of the murals represent those events. One painful one is the painting of a 14 year old girl who was out with friends collecting things for a school project when she was shot. The painting has a butterfly symbolizing the need for peace and at her feet were a few small stones which she had collected for her project. 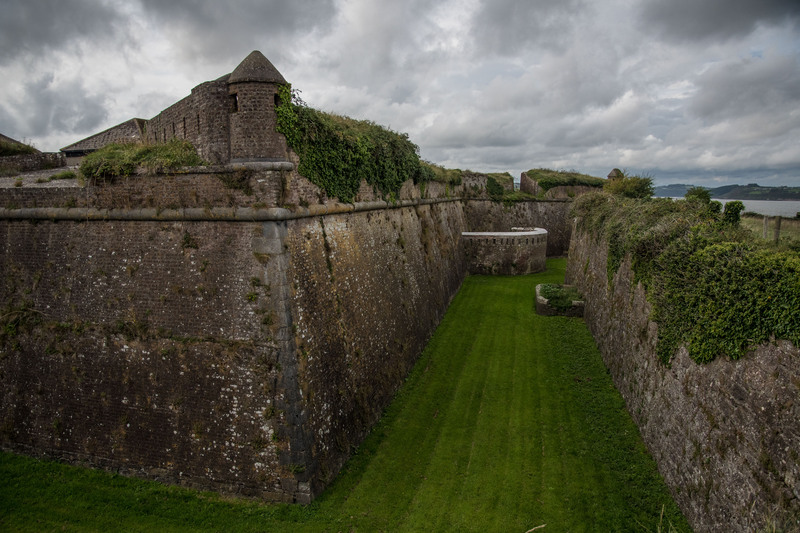 The inner city is surrounded by a 17th century wall that is still intact. The nicest parts of the city are within the walls. I walked the walls twice. Leaving the big city I was on another big busy road with periodic shoulder for a couple of hours. After my morning coffee break I moved onto a likely looking minor road B201. It turned out to be famous with local cyclists I found out a few days later. I never did have to push my bike up any of the many big long hills but I was very close on more than one occasion. This road was probably about 5km shorter than an alternative but it probably took me an extra hour because of the climbing. Still it was great. The views were not that impressive but the riding was. 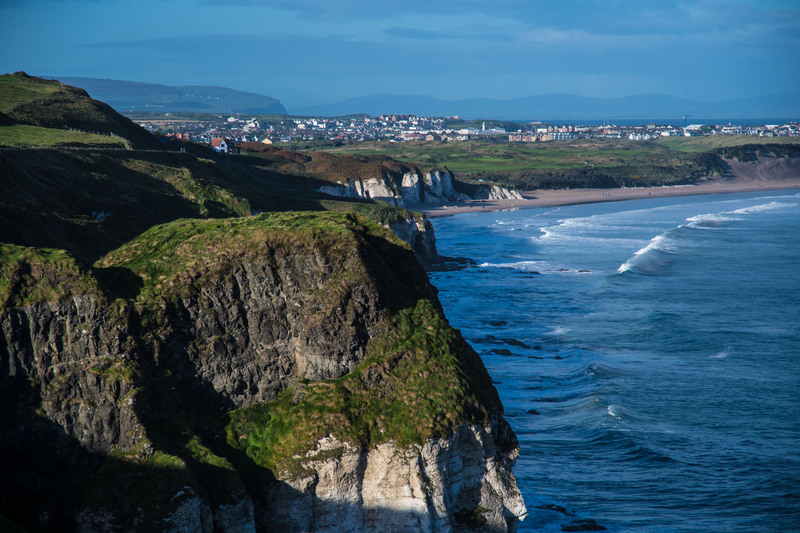 Portrush is a seaport town famous for its Golf Course, for its surfing and as the beginning of the Giant’s Causeway road. I didn’t get to see much there because as I pulled in it began to rain, so I sat in a coffee shop until 3:00 when the hostel began to take registrations. 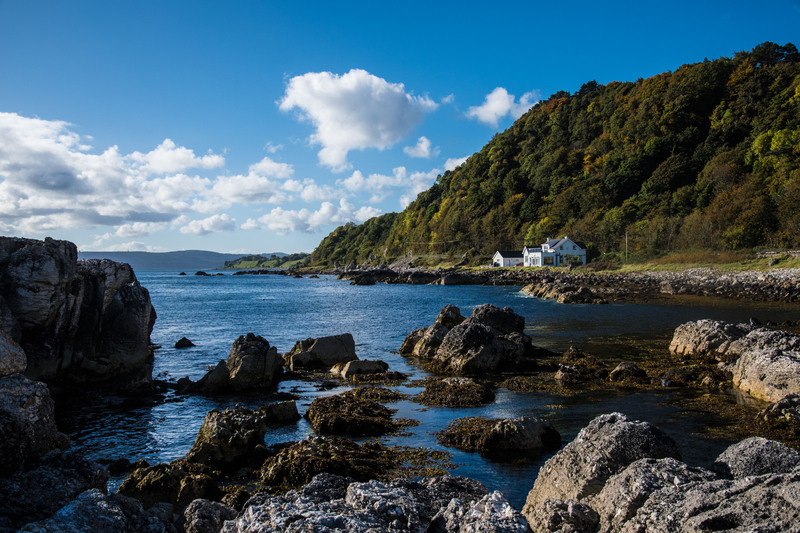 This hostel has been named the best hostel in N.Ireland on more than one occasion. Everything about it was well thought out, and so it was a nice stay. I was off as usual about 8:30 on a cold and brilliantly sunny morning. On this day I would ride 40 km and get to my next stop at 4:00. Obviously a very different kind of day. 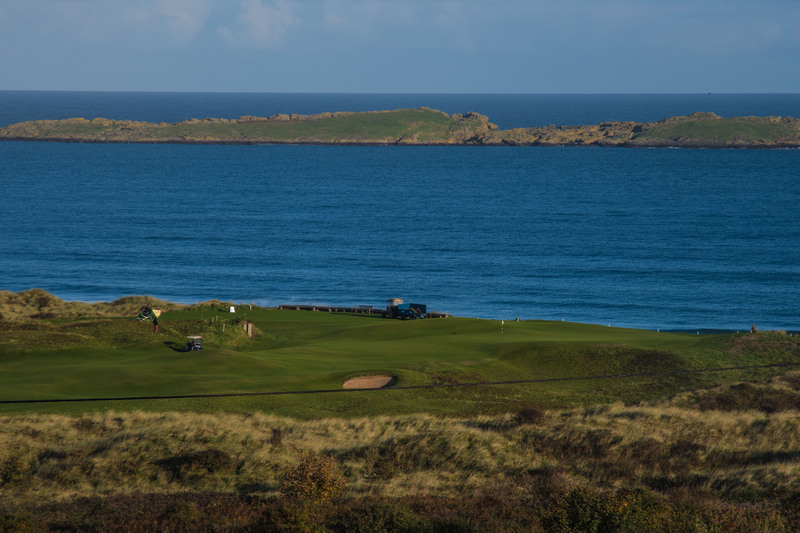 I was barely out of Portrush when I stopped first to have a look at the Royal Portrush Golf Course. I had read that summer fees are 190L (pounds), dropping to 100 in Oct and 60 in Nov. It is the site of the 2019 British Open. A links style course running along the white sand beach. I couldn’t see much, but it looked immaculate. There were already golfers out, dressed in their winter garb. 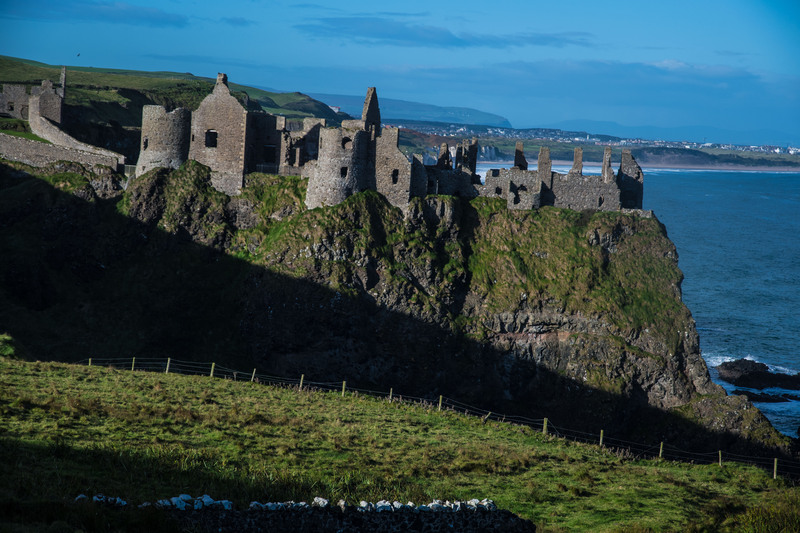 Next I stopped at Dunluce Castle. It was not open but I just wanted to see the setting anyways. It sits on the edge of a cliff. Apparently it was last in use in 1639 when seven servants who were preparing the evening meal and the kitchen they were in plunged down to the sea. I’m not sure when the gentry noticed that the meal wasn’t coming, but as there weren’t take-outs in those days they had to move to town. I went through Bushmills the site of the oldest licensed distillery in the world, dating back to 1608. There are tours but it was a little early in the day for me. So, on to the Giant’s Causeway. 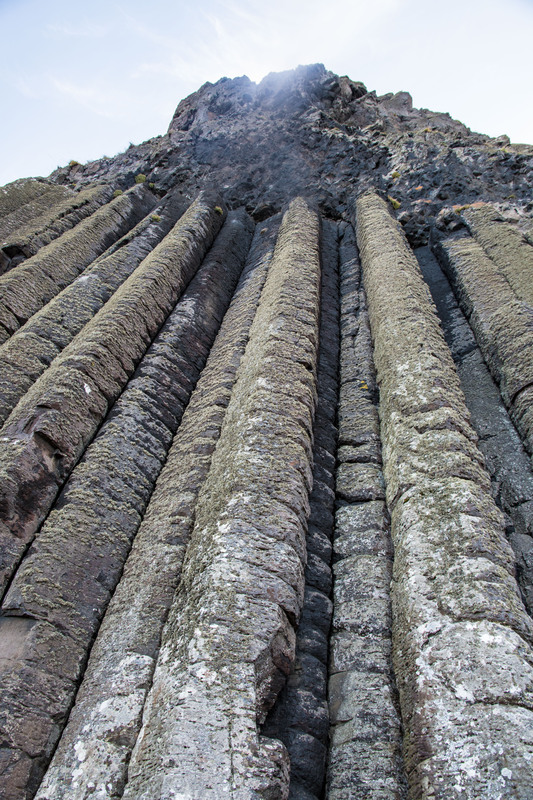 I spent about two hours walking along the trails to the different areas where the polygonal basalt columns are found. I had been to two similar locations with these kinds of formations: On the John Muir Trail in California and at Svartifoss in Iceland. There are many places around the world where they occur. They are formed when water pours into molten lava with certain characteristics. But the story here is different. 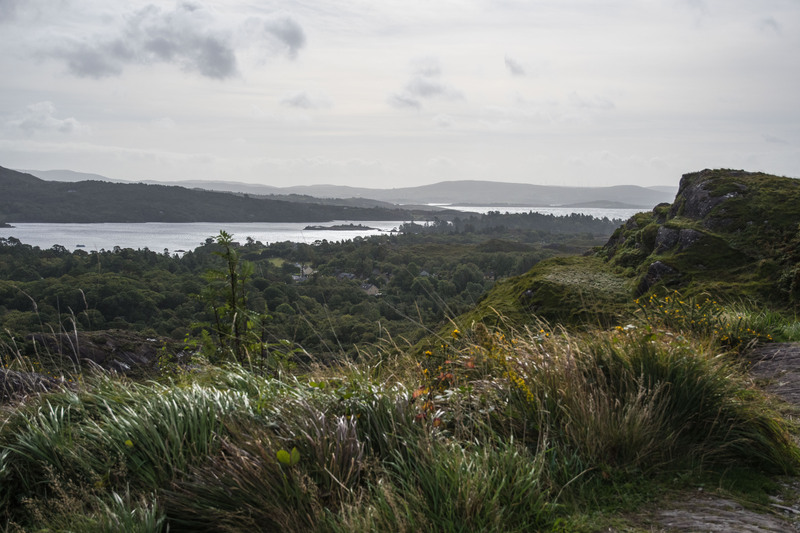 They were formed here by a Giant, Finn McCool who was making a pathway to Scotland to take on another Giant over there. 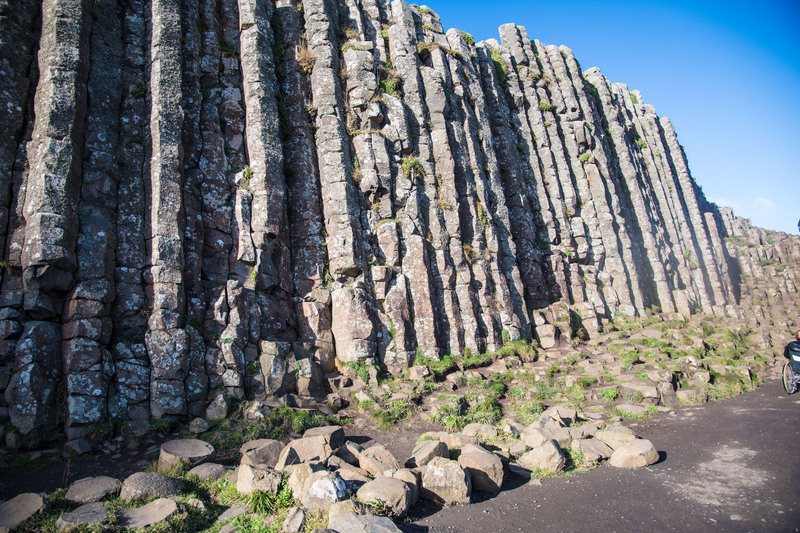 When he saw how big the Scot Giant was he beat a hasty retreat and destroyed most of the Causeway. I may not have the whole story but it seems plausible.. Heading back onto the road I was caught by a local cyclist and we rode together for about half an hour. He was the one who told me about the nature of B201 that I stumbled on. He, interestingly, was able to identify my as Canadian more or less immediately and passed on more local knowledge. 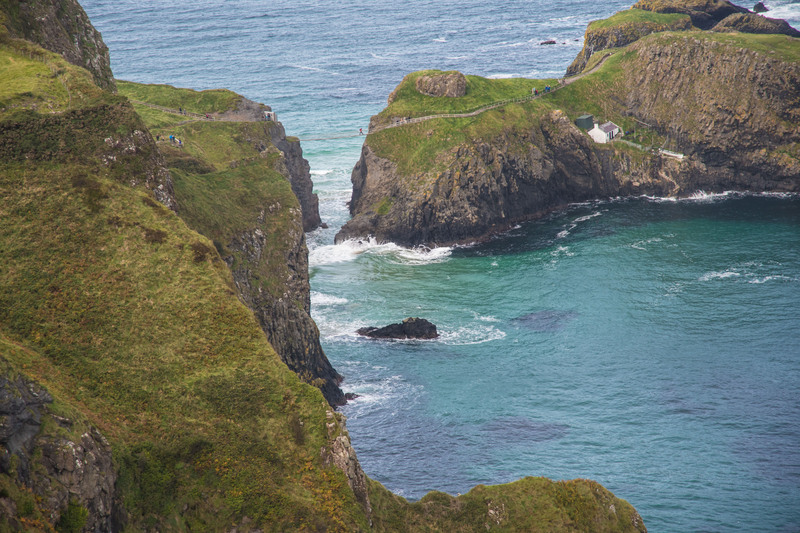 I had a steak and kidney pie early in the afternoon at Ballintoy and then stopped occasionally to take pictures of the sea coast and then again at an overview of Carrick-a-Rede Rope Bridge. For 7.5L you can walk across this bridge to prove how brave you are. 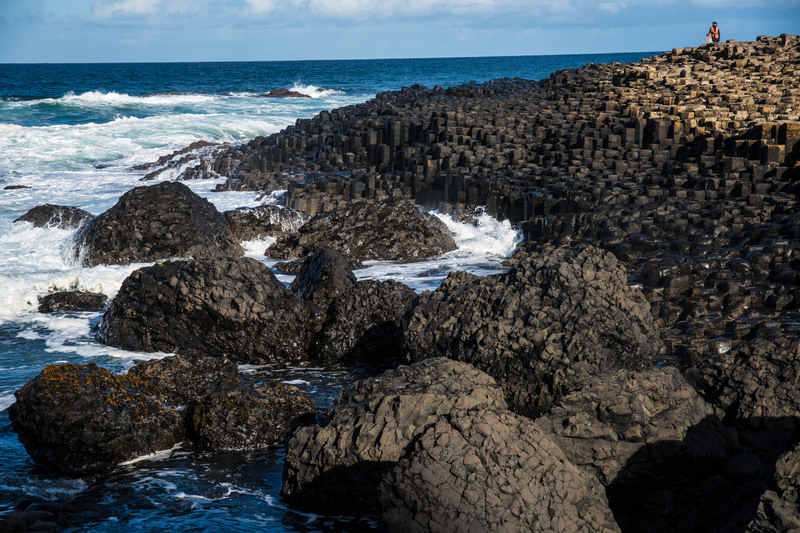 I had already paid 10L for parking and entry to Giants Causeway when I didn’t have a car and where the walk doesn’t actually cost anything, thus proving I am not very bright. I also decided that riding a bike on busy highways is enough of a bravery test for me, I didn’t need another. All told, while this has been my shortest riding day of this trip it has also been one of the best. 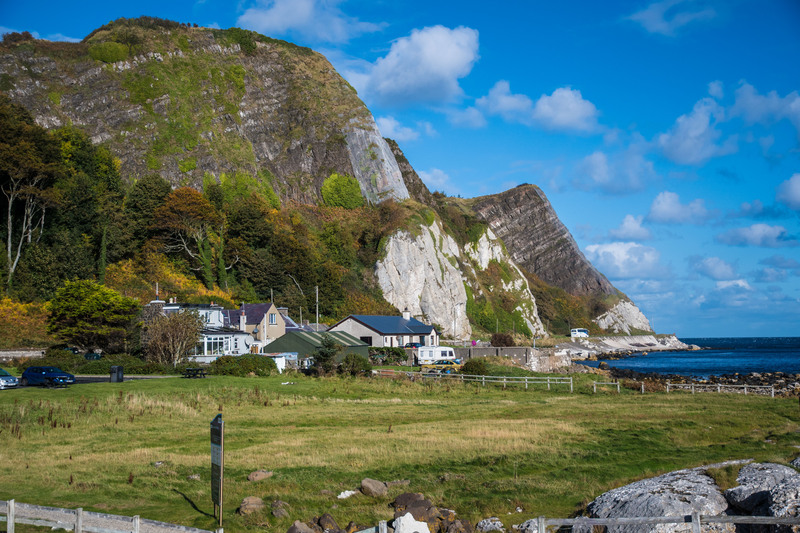 In part the weather was superb but the scenery along the Antrim coast is spectacular. As I said there was no need to sit around and wait for the hostel to open today. Oh, and today I did have to push my bike up one hill, the first time since the first day. At Ballycastle I had fish and chips made right on the wharf ostensibly caught that day. On the way back to my hostel I was struck by the Geese heading into the sky. Off on another cold but sunny morning. I was taking highway A2, the Coastal Highway. It began with some long climbs and drops into the headlands. It was lovely country and great riding. After a final drop to the sea and a morning coffee the road stuck to the sea the rest of the day. Normally sea coast riding is a lot of up and down but for about 60 km the highway was literally a few meters above tide line. And the wind was with me except when in the many bays where the wind bounced back by the cliffs made me work a little harder. But most of the time I was sailing along on a nice smooth road over 30 kph. Heaven must be like this. 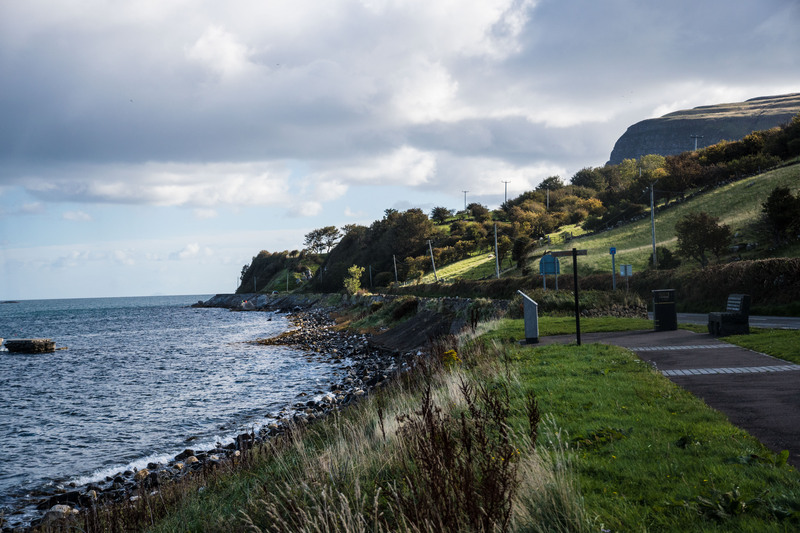 These last two days along then Antrim Coast have certainly been the nicest for me on this trip so far. Today I rode more than twice as far as yesterday and took two hours less time to do it. Both days were lovely. The one because of all the neat places to visit the other because of the exhilaration of flying down the scenic coastline. My B&B hosts in Whitehead were great, good visiting and great facility. Whitehead is a funny town with the train station cutting through town with most track crossings being pedestrian. There are also some great painted houses here. Tomorrow I will head into Belfast for one night and then on to my last leg to Dublin. Since my last post I have had almost no rain and most of the wind was tailwind. I wonder if someone was listening to all of the complaining I was doing for the first two weeks. Heading out onto the Beara Peninsula it was raining again. It cannot possibly go two days without rain. It was now heavier than I have had it before. And then as I was coming down a hill about an hour out that squishy rear wheel feeling. I walked down a bit farther to a coffee/art house. I needed some cover to fix my tire. Pushing my bike around behind the building I found a partially covered wood-shed and moving some garbage bins I got in out of the rain. Another pin-prick hole with no apparent perpetrator. I put my remaining good tube in and tried to fix the punctured tube. The patch would not stay in the damp air. Near the bottom I stopped again for photos and was passed by about six antique cars, all but one driving with no top in this silly weather for such activity. Don’t they know that it is too cold and miserable to be out in the open on days like this. 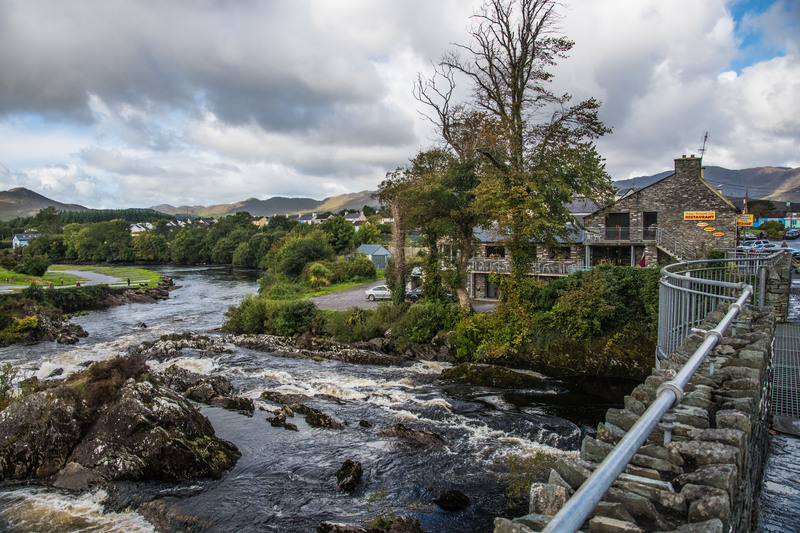 There was another significant climb yet to do before I sailed into Kenmare and found room in the local hostel. I bought an extra spare tube, almost lost my helmet. I had ridden away from the visitor centre with it sitting loosely on my panniers. It fell off soon after taking off and I finally found it a few hours lately where some kind soul had I assume picked it up from street and placed it on a bench. I also bought some light walking shoes as my waterproof shoes were soaked from the all-day rain and would take some drying out. I obviously had not expected things quite this bad when planning for the trip. Dinner that night was in a pub where two young people were playing Trad; that is traditional Irish music. She on a violin and he on a flute or a little hand accordion. Great stuff. No rain but a cold west wind as I was heading out to ride the Ring of Kerry. It would take me two days, and the headwind would be from the West as I was going out and then it turned to be from the East as I was coming back the next day. The only difference was the second day brought rain. Such is Ireland I guess. My first day was quite long and tough, but I seemed to be riding well and so it felt good. As usual I stopped mid-morning for coffee and a snack by a nice river-side restaurant. 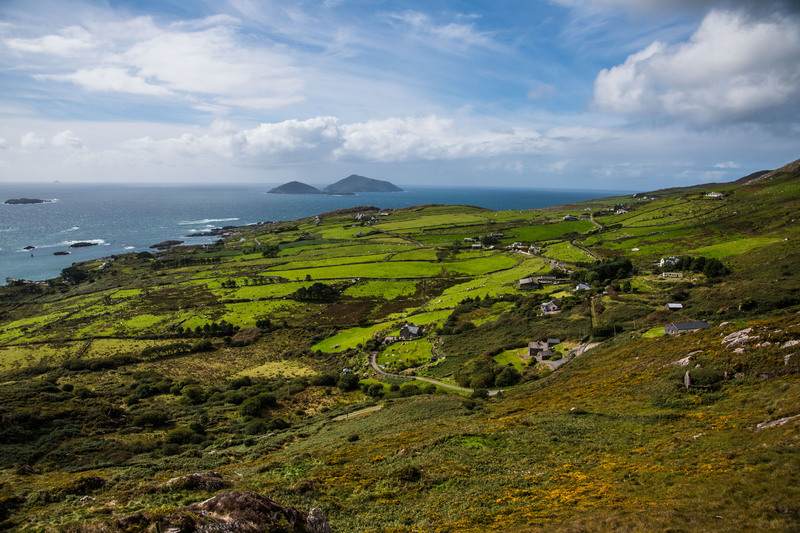 The end of the Kerry Peninsula is where Daniel O’Connell was from. In the early 1800s he began to bring the Irish Catholics into the political arena. I think many think of him as the father of Ireland, even though it still took over a hundred years for them to gain control. After I turned the corner at the end of the peninsula coffee and hot rhubarb crisp at Waterville. In Cahersiveen I got into the hostel not long after an old Englishman, living in Dublin, arrived. 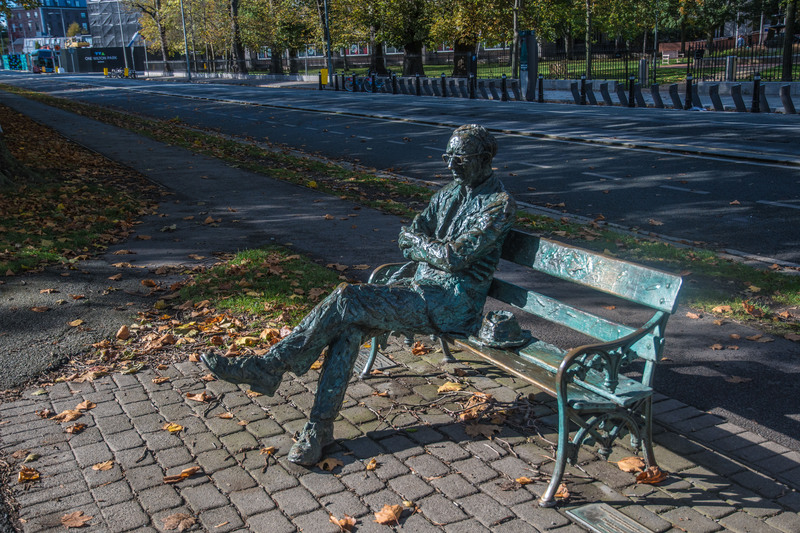 I had spent the night with him in Kenmare and he had taken the bus. He was going to spend four nights at this hostel and would take a rented bike into places where there are still native plants growing. He paints them in situ and is as stressed by the rain as I am because it is too humid for his paints to work. 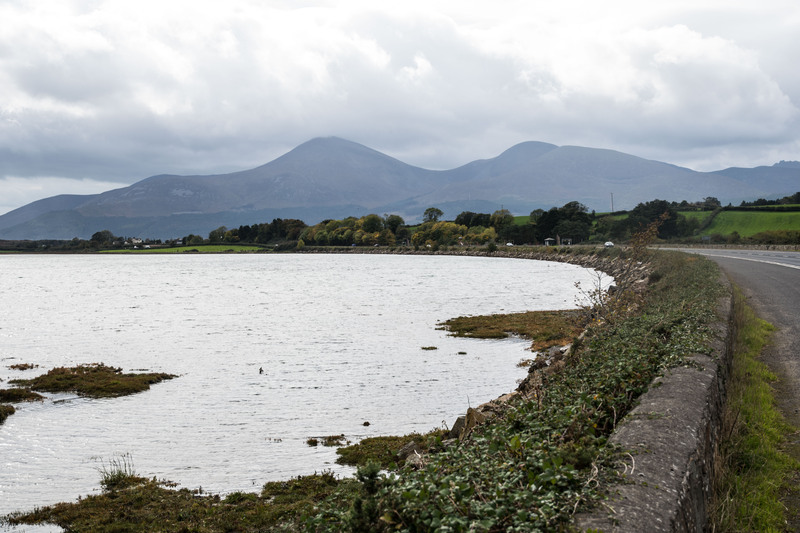 I was going to skip Killarney turning at the bottom of the bay onto the Dingle Peninsula but with the rain and the forecast for two more days I backtracked a bit to Killarney. I was tired of riding the wind and rain with my head down, rain hood up not seeing much of anything. Dingle would have to wait for another time. Another rest day, after only three days of riding. But as I was not particularly in need of a mental rest it felt a bit of a waste. I saw what I wanted of the town in about two hours. I did cycle into the national park and walked up to Torc Falls and had a look out over the Killarney Lakes but I would rather be riding. I did buy some nice merino wool long undies which I now do not know how I did without. I now felt the need to head north in a big way. It seemed that I had been stuck down in the SW corner far too long. I picked a route heading straight north and went hard. It was to be a mostly sunny very cold day, compounded by the wind which was naturally out of the north. I stopped only once mid-morning for coffee and to get warm. I had a ferry crossing the bay the river Shannon flows into which I made just as it was pulling out. As a result I had my afternoon soup in Kilrush after finishing riding for the day. At the hostel I visited with an old Frenchman doing a slow drive around Ireland. He was in the hostel with me in Killarney. Once you see someone for a second time you are old friends and you can sit for a good visit. He provided the wine and cheese; I provided the Irish Whisky. 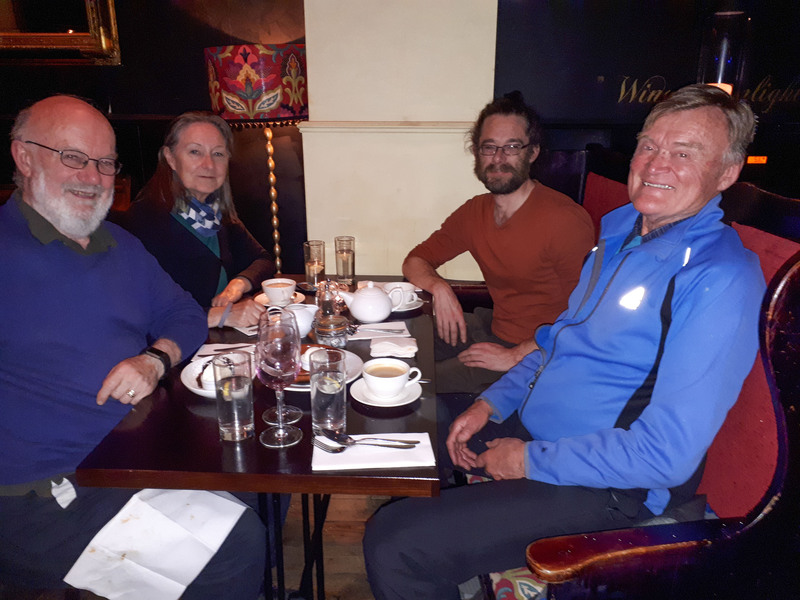 We shared our fare with a young girl from New Zealand who is on a seven day cycle from Galway to Dingle. I hope she makes it but she is very slow and can’t ride the busier roads which are not really that busy and are much shorter than the route she favours. Grey and blustery day, but no-where near as cold because the wind is finally from the south. After two weeks I finally have a wind-assisted day. 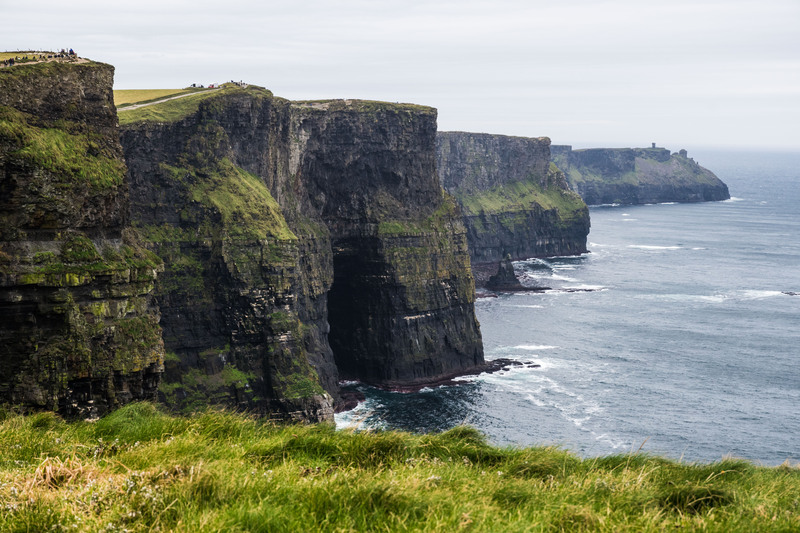 I did not have very far to ride as I planned on hitting the Cliffs of Moher, one of the must-visit places for me. 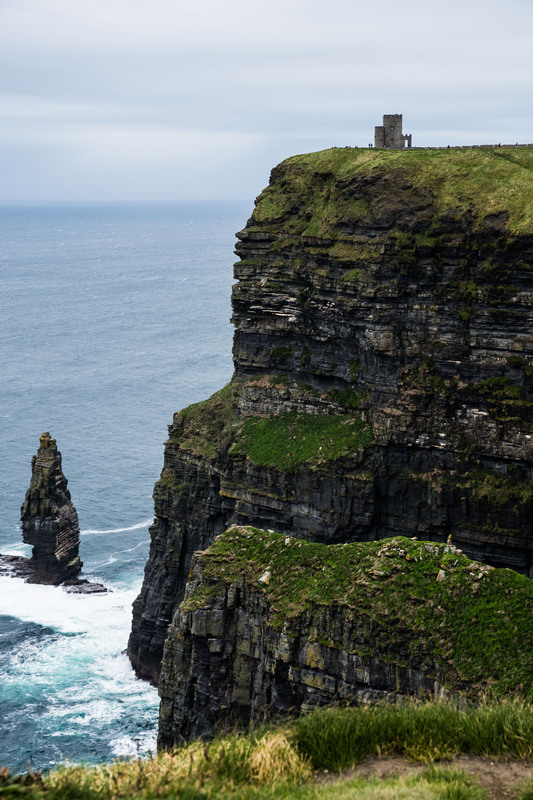 It is also one of the most visited sites in Ireland and so I would walk along the cliffs getting my pictures carefully excluding the thousands of others doing the same thing. In a way the grey windy day fit in well with the foreboding black cliffs dropping into the rough North Atlantic. The downside of this day for me was another flat tire just before I reached the cliffs and another just after as I somehow buggered fixing the first one. I am now worried about my tire situation and wonder if I have some fault in my rear wheel as I can find no reason for all the flats I am having. I went past little Doolin hoping for a bike shop in larger Lisdoonvarna. Neither place has 1000 residents. I checked into a big hostel and was told that Doolin has the bike shop. I was approached by a strange woman in the hostel about coming to the Trad in one of the local pubs. I told her I would likely see her there, but when I went for dinner I must have chosen the wrong pub, she and her friends were not there. The next day I was told to stay away from Lisdoon, as locals call it, at this time because a yearly “match-making” event is on which brings out the crazies. 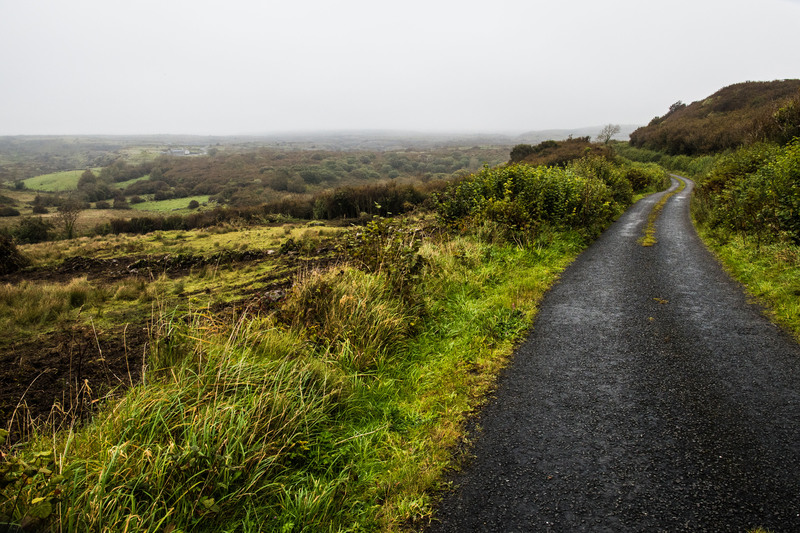 I headed out in thick fog onto some very small roads leading into an area called the Burren. It is a windswept limestone region with very few people. Drawing me into the Burren in addition to the tiny roads is the “Poulnabrone Dolmen”. 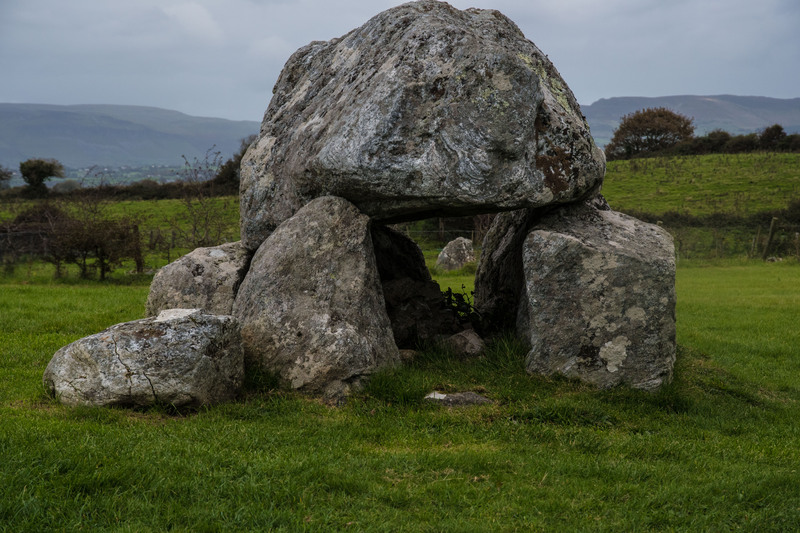 It is one of the countless pre-historic sites in this part of Ireland. 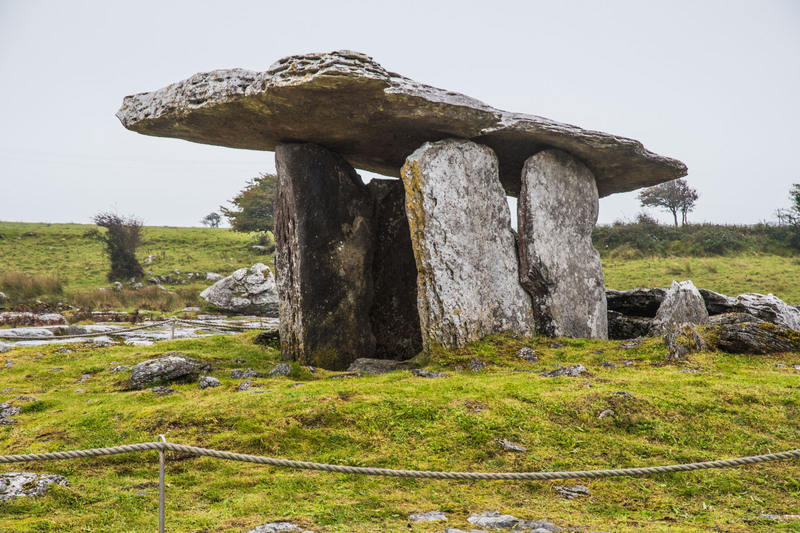 This particular structure, dating from about 3000BC, seemed to act as a burial site for a small number of people. 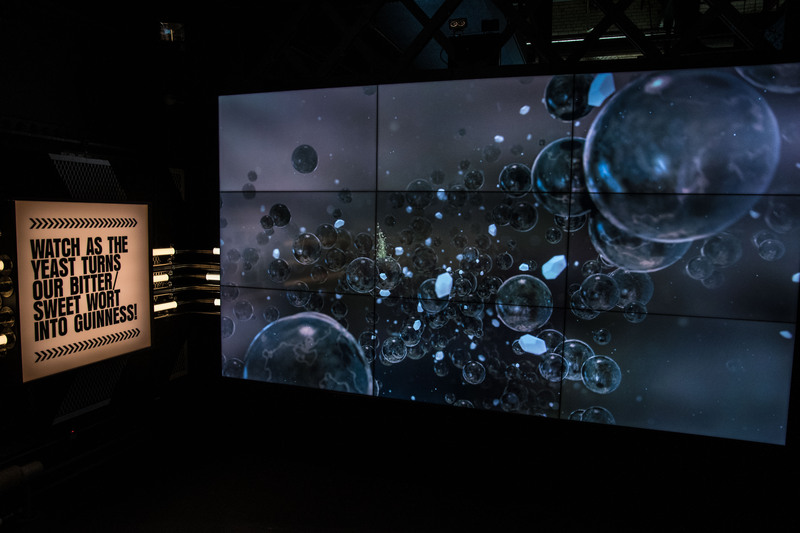 I was drawn to this site by the object itself and by the remote location. It was here that I was warned to stay away from match making. From the Dolmen I had a big drop down across this strange limestone environment to the coast where I had one final flat on my way into Galway. I now realized that the culprit is a spoke that pokes through, likely when I hit a bump at just the right, or should I say wrong time. I noticed that the hole was in the same place on each of a number of my tube patches. Around the corner from my hostel in Galway I found a bike shop who did some fine work on my bike, including giving me a whole new set of replacement tubes, adding an extra rim tape to the wheel, a little derailleur tuning. We will see how it all works out. I’m heading to Connemara. It took about 45 minutes to clear Galway. The sun was out and my old friend the headwind was back. Heading west into Connemara it is not unusual to expect a west wind I guess. After my coffee stop, about an hour and a bit it, some mist began to form, but not enough to motivate me to put my rain stuff on. As the day went on there was never any real rain, but the mist was thick enough to cause drips from my helmet and I gradually became soaked. Lesson learned. Part way into the day I watched for and found “the quiet man bridge”. 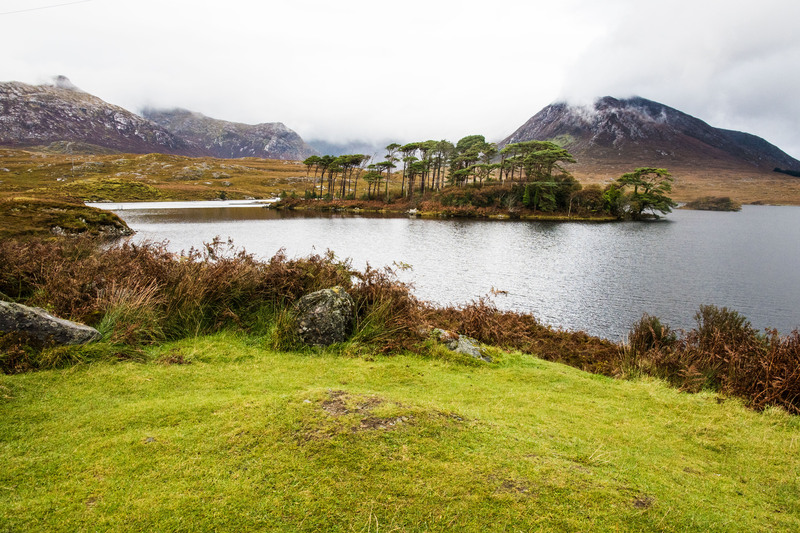 The Quiet Man, with John Wayne and Maureen O’Hara was filmed in the Connemara and it has become one of the attractions for tourists. 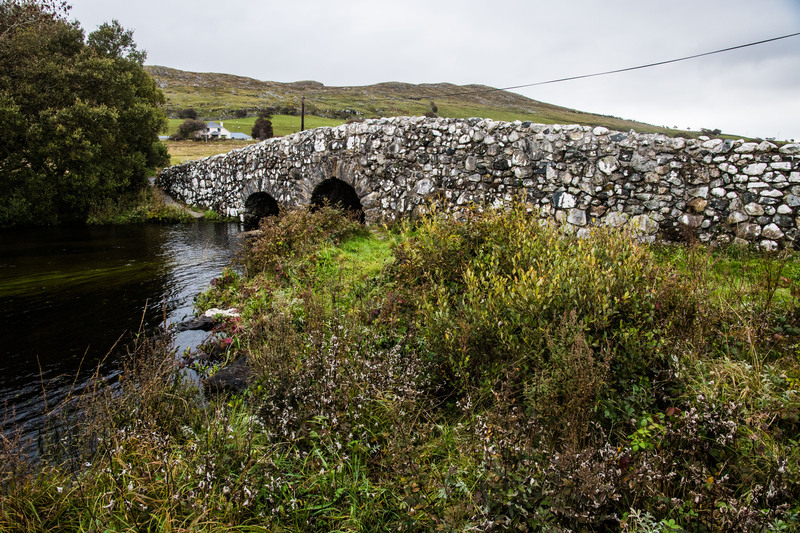 The bridge is just off of the road I was taking into the Connemara. I had considered taking a road that goes through the town of Cong, the site of much more of the movie, but I just settled for the bridge. I thought it was pretty nice. Nearing Clifden I did stop for a few more pictures. 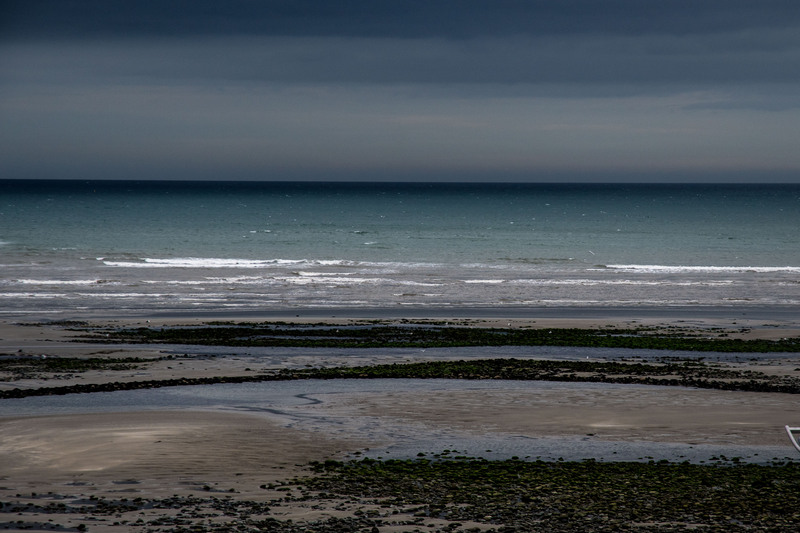 I went past many lovely settings on this day, but the damp mist was too uncomfortable for me to be stopping much. In this segment I have been staying almost exclusively in hostels but have continued eating mostly in pubs. I have been happy with both. The riding has been tough with wind and rain almost constant. My bike troubles have been problematic but still I am enjoying it. Hopefully a main problem has been fixed. I am riding a mix of busy main roads and quiet secondary roads. I need to get on the main roads when I want to put some distance behind me, but the drivers have been very good and I do not feel overly stressed when on busy roads. All is good. Late leaving Calgary I was re-directed from Toronto to London and then Dublin, arriving at about 3:00 pm, four hours late. A taxi dropped me off at my warm showers host at a little after 4:00. Eoin (pronounced Owen) is a 39 year old student who luckily had spent time as a bike mechanic. My derailleur extender was broken in transport. Eoin spent a couple hour fabricating a fix. It was about 8:00 by the time we pronounced the bike as good as can be and off we went for pizza. 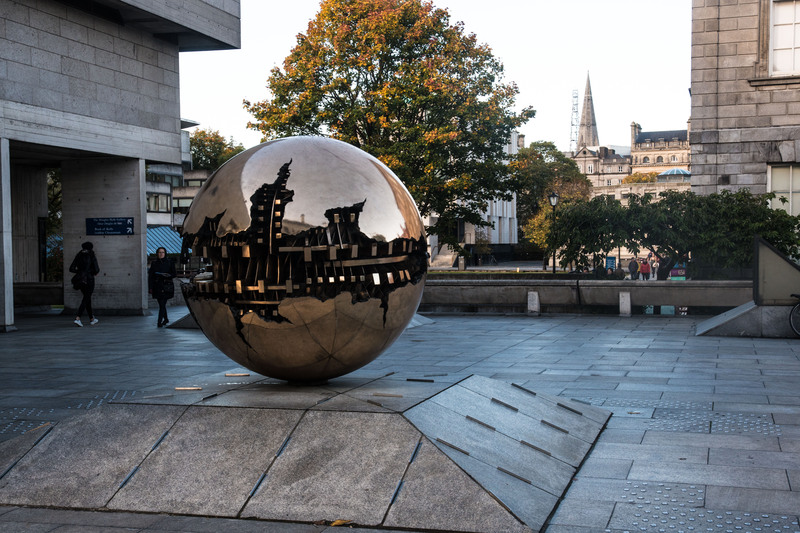 I cycled into central Dublin to test the bike and to pick up a small Ireland road atlas. The bike was fine for now, but to cover me Eoin found an extender on Amazon and had it delivered to a bike shop near Cork. 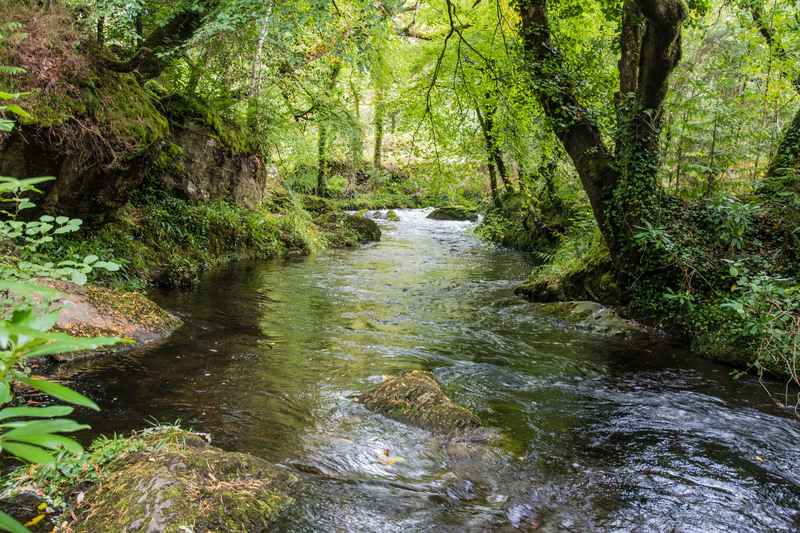 About noon I said my goodbyes and followed Eoin’s directions to get out of town heading south into the Wicklow hills. It was mostly painted bike trails in Dublin but once clear of the city onto the R roads I was sharing the two lane road with fairly heavy traffic. The riding was fine as the traffic is fairly slow. About half way out I moved onto a quieter road suggested by Eoin. It was more hard work as the quiet roads may be even steeper than the R roads. I pushed up one hill. I had a bowl of soup and bread at Roundwood and then on into Laragh. I had no reservation and was considering tucking into the woods in my tent but the wind was up and the rain coming in. I checked into the local hotel and talked them down to 75 Euro. 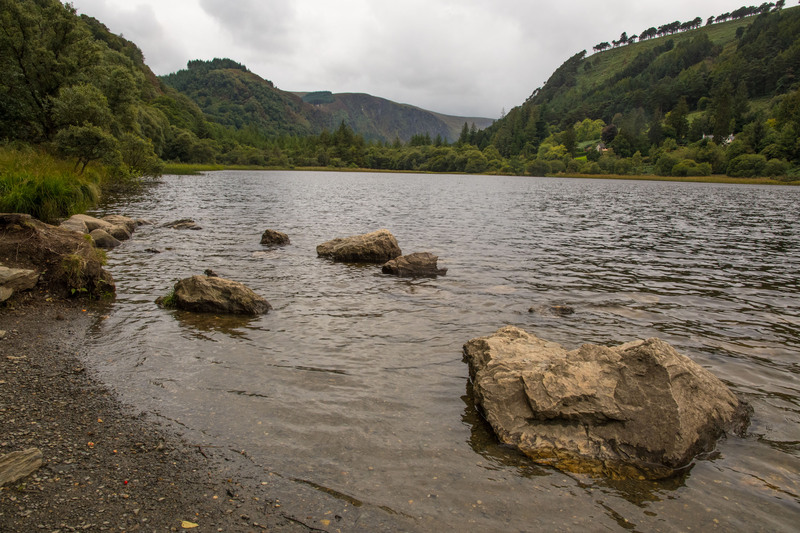 From Laragh it is 3 km up to the old monastery at Glendalough. 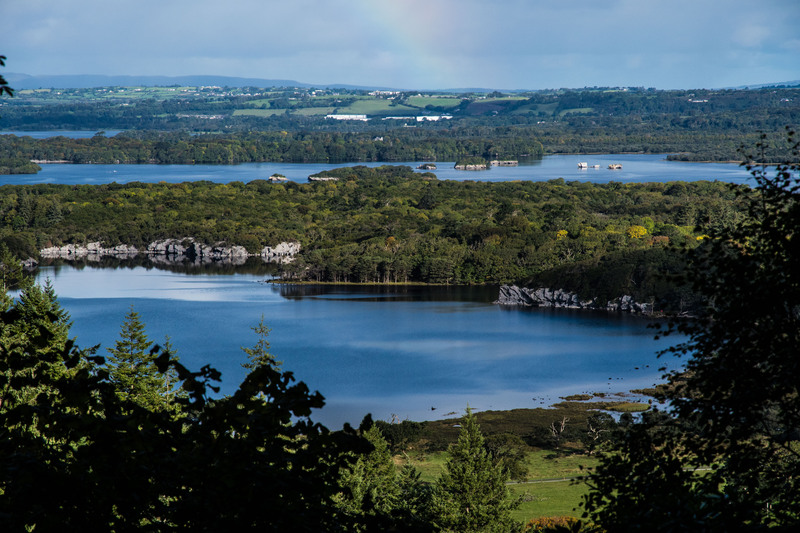 I had a nice 5 km walk around the ruins and cemetery and then on up to the lough (lake) itself. There is a nice round tower here, an integral part of the monk’s defence from Viking attack. 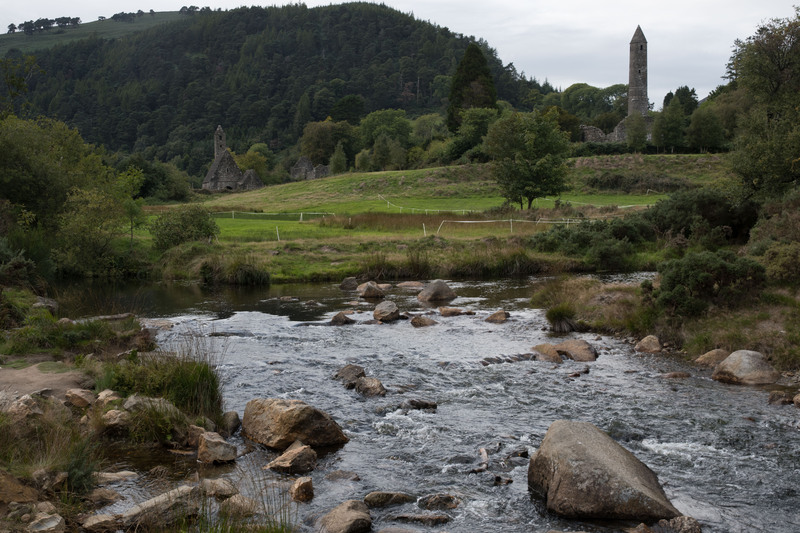 Glendalough was attacked four times; I don’t know how effective their defence was. 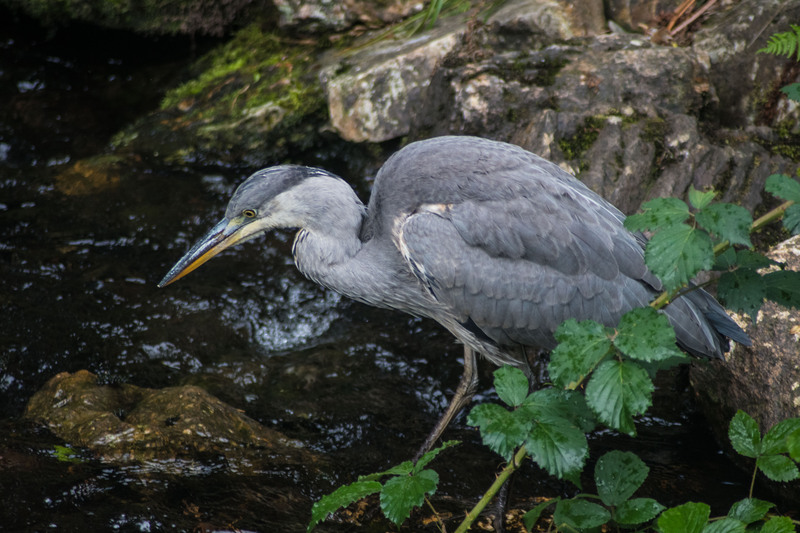 I took some nice pictures of a Grey Heron in the river flowing out of the lough. The weather, my hotel meals, dinner and breakfast, and stay have convinced me that I won’t be tenting much until things improve. That sentiment was reinforced in the morning when I suited up in my rain gear and stepped into a steady drizzle. The ride south was wonderful. Deep forest and serpentine roads with very few cars. I was worrying a bit about hills but my bike seemed to handle them fine. Through Rathdrum and on towards Aughrim. My target was Kilkenny. I had picked a route through to the SW coast in part based upon the regions where I could create a route out of small roads. As I was whizzing down one of the continuous hills I passed what I will call a gypsy wagon. Four little people sitting abreast on the bench of a covered wagon pulled by a single horse. I was going too fast to stop for a picture but my wave was returned by all four. And then my bike gave up. As I was shifting gears they screeched loudly, my rear wheel seized and I abruptly came to rest. The makeshift extender had bent turning the derailleur into the wheel. Nothing on the wheel seemed to be damaged but the derailleur was toast, and nothing I could do would work. After fussing a bit I started to walk. I was hoping for a bus but as I had yet to see one knew this was unlikely. A road sign indicated that I was still 10 km from Aughrim. I began sitting on the bike and pushing with one foot, and I lucked onto a few down hills. I guess it took an hour and a half to get into town, but there was no bike shop. A small town bike shop wouldn’t be much help getting a fix, but I thought they might help get me riding, so now I found a sheltered spot and began trying to do it myself. The idea was to take out some chain links in effect making a one speed bike. I had just broken the chain, removed the links to get to the length I wanted and was struggling to put it together when the couple whose driveway I was using came out to see what was up. I guess I didn’t look very adept as they suggested that they could drive me into a bike shop. No arm twisting was necessary and so we went into their house, had some tea and began phoning bike shops. The fourth one we called figured they would be able to help. So off we went. Fifteen minutes later the bike guy had dug around in his stuff and found everything we would need, including the bike extender. I walked down to the closest hotel, negotiated a 110 E stay on this busy Friday night and two hours later and another 300E poorer I had a newly tuned bike. Big money, but no effective time lost. Gorey was off of my initial route and so now I created a new one. Having dug pretty deeply into my funds with expensive hotels and my bike repair I thought I had better make some advance bookings. My new route would head towards the Viking cities of Wexford and Waterford. I made a reservation at Duncannon and would ride fairly busy R roads to get there. After a big breakfast that is a part of all accommodation here and an hour and a half on the busy R road I had a nice coffee break and a warm up. An then an hour later a 2 km detour got me to the Wexford Wildfowl reserve. The mud flats along the coast where the reserve is are interestingly called slops. Notable for geese I saw Greylags and Barnacles. I also saw a lovely little European Robin, which keeps popping up on this ride. 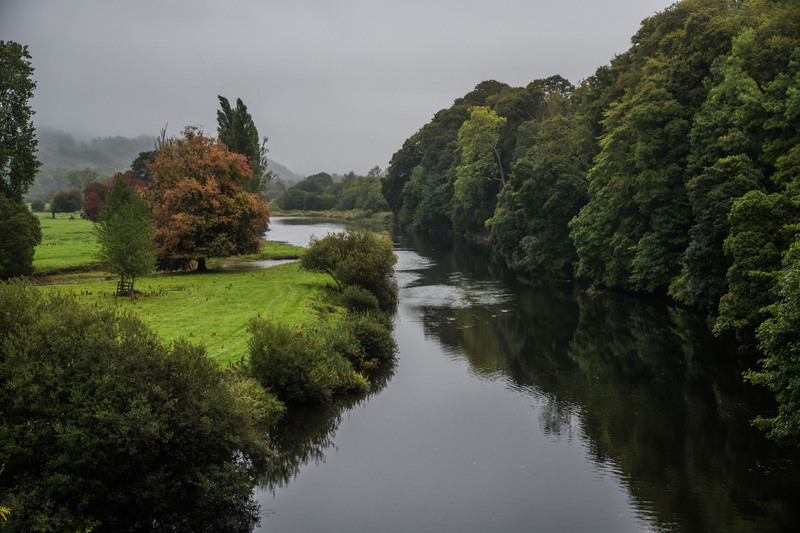 I rode through the middle of Wexford, stopping only to get a record keeping picture, and then on to Wellingtonbridge for soup and bread that is becoming my lunch break meal of choice. Duncannon is across the bay from Waterford and my B&B was 45E. I’m still not getting away very early as the weather is so poor. 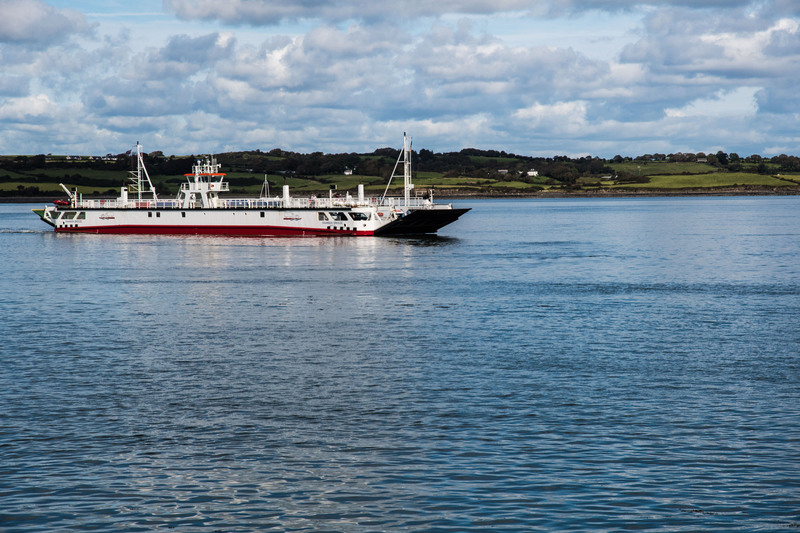 I had a 5 km ride to a ferry and then another 15 km into the centre of Waterford. Both legs had a good climb. Waterford sits up the bay where the Barrow River empties into the sea. 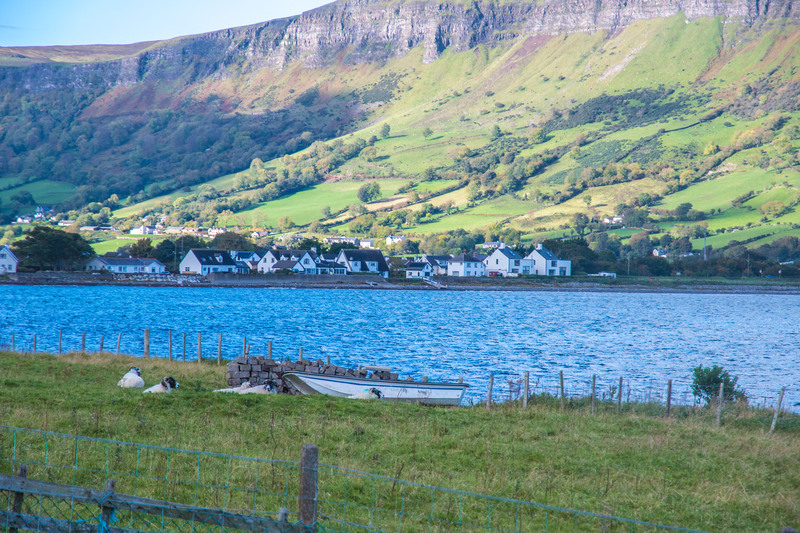 No doubt a well-protected harbour for the Vikings who ended up creating Ireland’s first town here. There is a group of museums in a cluster called The Viking triangle, but I was headed to the Waterford Greenway. It was Sunday and the sun had finally revealed itself. 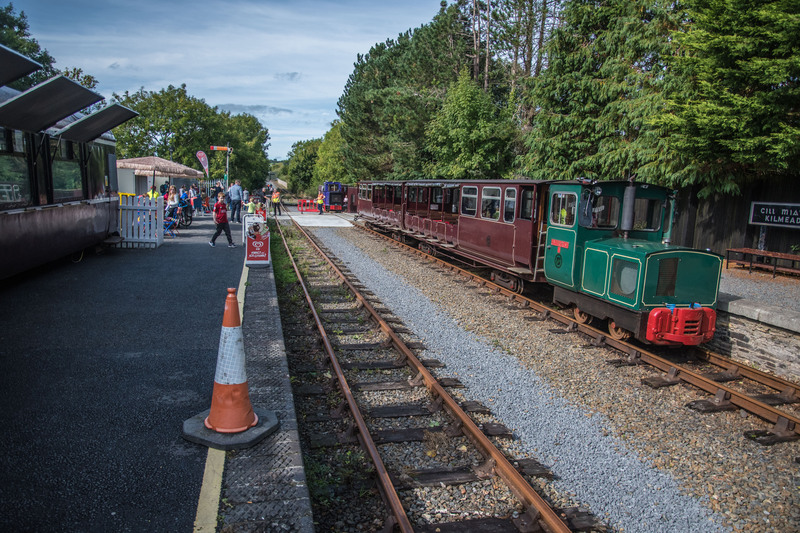 The Waterford Greenway is a destination rails-to-trails conversion. 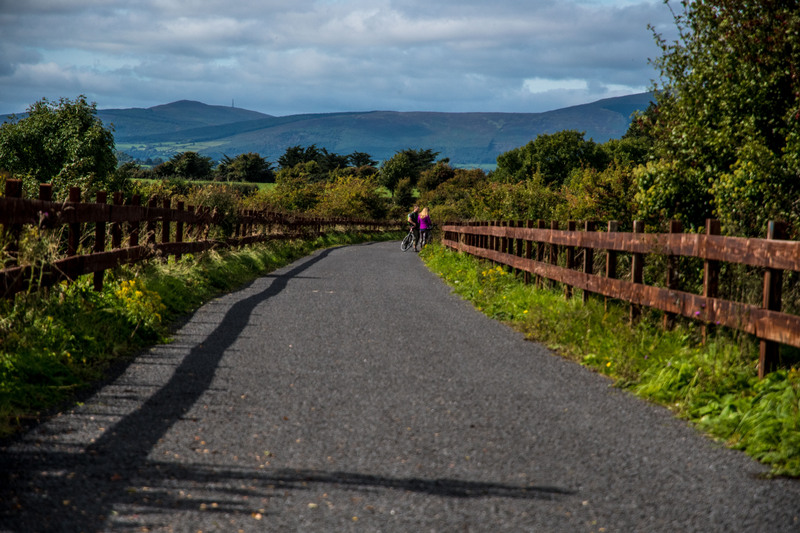 It is 47 km long, there are bike rental outlets at the two ends, Waterford and Dungarvan and at places along the way. Not only was the sun shining but the wind was down and of course the normal rolling hills had been flattened for the railway. Now in place of the big dips there were tunnels and bridges, most made a hundred years ago. I went slowly, savouring the car free riding and mostly continuous company of cyclists and walkers. As it was Sunday there were many families. I had my coffee stop at a railway station for the 5 or 6 km segment of tiny railway that runs for the benefits of families. I had a breakfast bagel and soup at a stop with at least 100 cyclists. 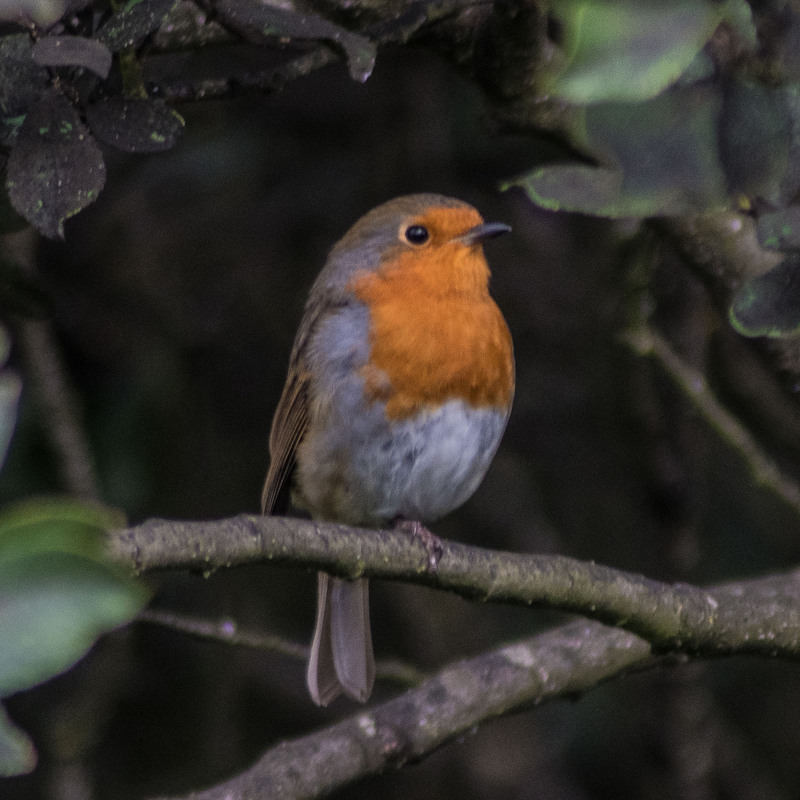 Along the way I got more pictures of a European Robin, the Knockmealdown Mountains near Dervla Murphy’s home and some shore birds near Dungarvan. My pub dinner on this night was shared with dozens of other cyclists. A Truly lovely day. My B&B in Dungarvan was on the outskirts of Dungarvan and that set my route for the day. The challenge of finding quiet roads is significant. Because of my location I chose to head west on N72, The N roads are a step above the R roads, but as it turned out it was less busy than the R roads of a couple of days ago. The wind and rain were back but, rain-geared up, on I went. 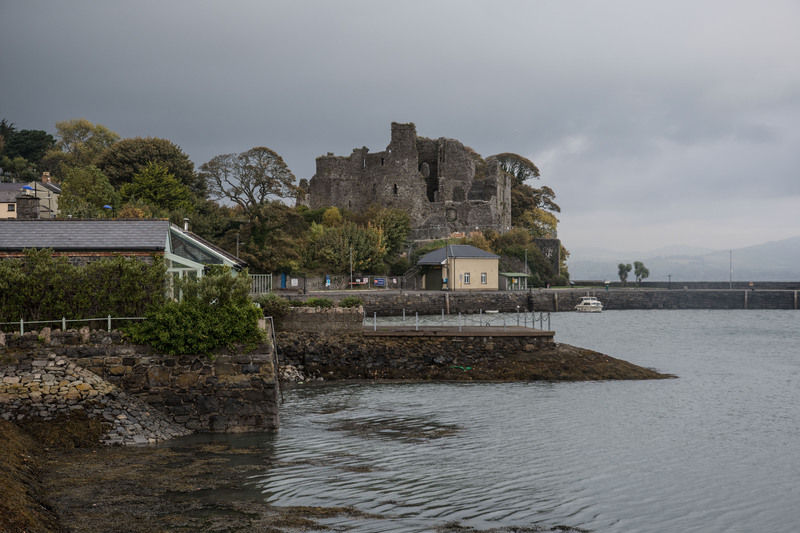 I stopped for coffee at Lismore, the home of Dervla Murphy. 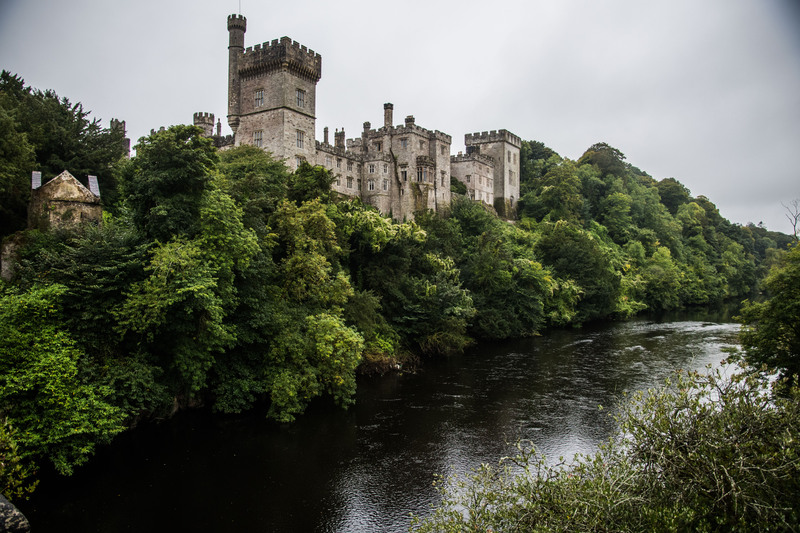 Spectacular Lismore Castle, still a private residence, rises above the Blackwater River. It was nice enough for me to pull out my camera in the rain. As I turned south onto some R roads the wind picked up but the traffic almost disappeared for more than an hour. I got back into traffic as I neared Cobh (pronounced Cove). 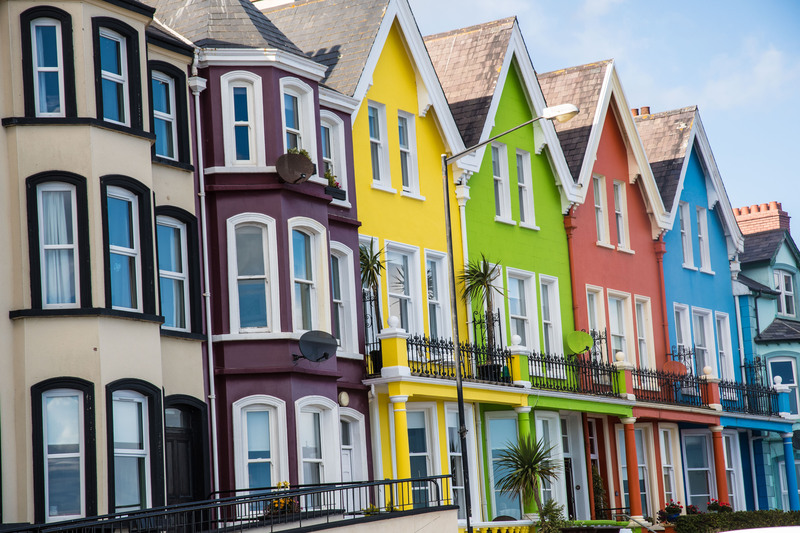 Cobh looks onto the sea across a passage or two from Cork, Ireland’s second city. Cobh is famous as the last port the Titanic touched before heading off to disaster. More rain and heavier wind. I had a 5 km ride to a ferry and then along a bay to Carrigaline where I picked up my spare derailleur extender from the bike shop we had it sent to. I now continued on heading west. I got as far as Bandon and then rather than spending the night I caught a bus to Glengarriff. The forecast if for 50 to 85 km winds for the next few days. I didn’t want to get stuck in Bandon if the forecast holds. 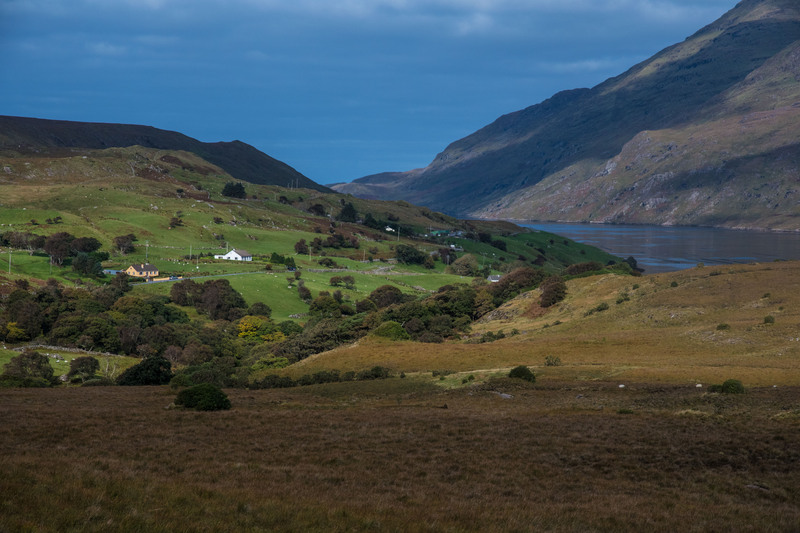 I have booked myself in to a Glengarriff B&B for two nights and will go walking for a day before heading out onto the Beara Peninsula, the first of the Peninsulas on the west coast that I want to ride. Until today except for my bike failure day I was riding 65-90 km a day, sleeping in nice places with great breakfasts, having mostly pub dinners. Over half of my time I have spent on quiet hilly roads. I have not taken many pictures because of the wind and rain, but I would say I am really enjoying the ride and the Irish atmosphere. The wind was ferocious over night, but it wasn’t that bad during the day and it never did rain. The breakfast is served late in my B&B so I wasn’t out walking until about 10. I made my way to a vantage point where I could look out over the bay but vantage points also don’t have much protection from the wind. 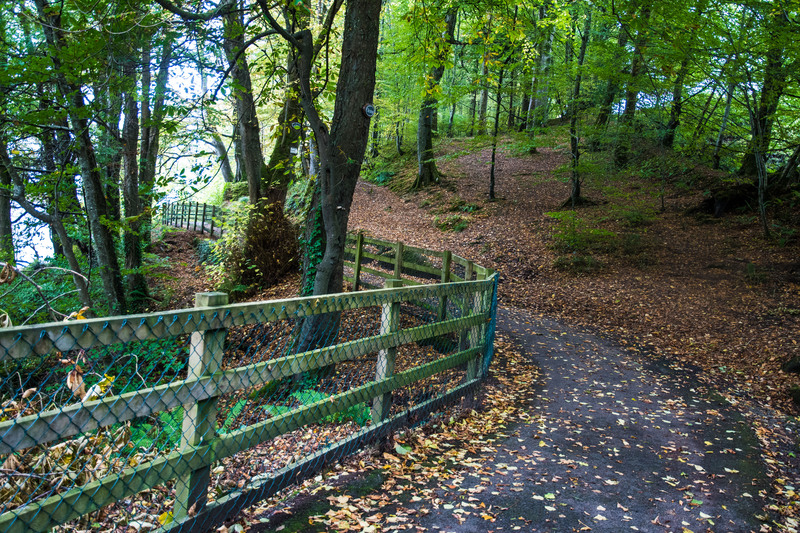 The walk I chose was through something called Glengarriff Woods, perfect for a windy day. I walked on a series of forest trails for about four hours. It was quite lovely. 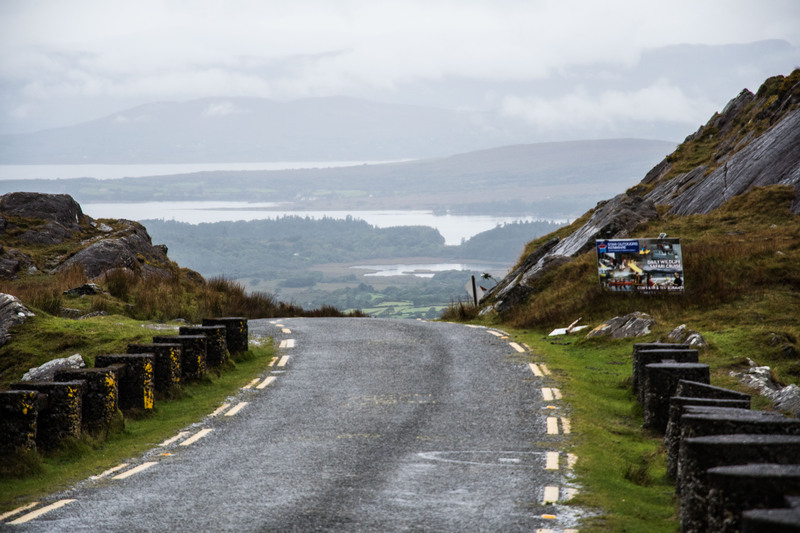 Another rainy windy day is forecast for tomorrow, so my bike trip out onto the Beara Peninsula looks challenging, but on I will go. The next week or so will be heading north through Kerry experiencing these peninsulas and possibly some of the towns along the way. The weather will kind of dictate what I will do.